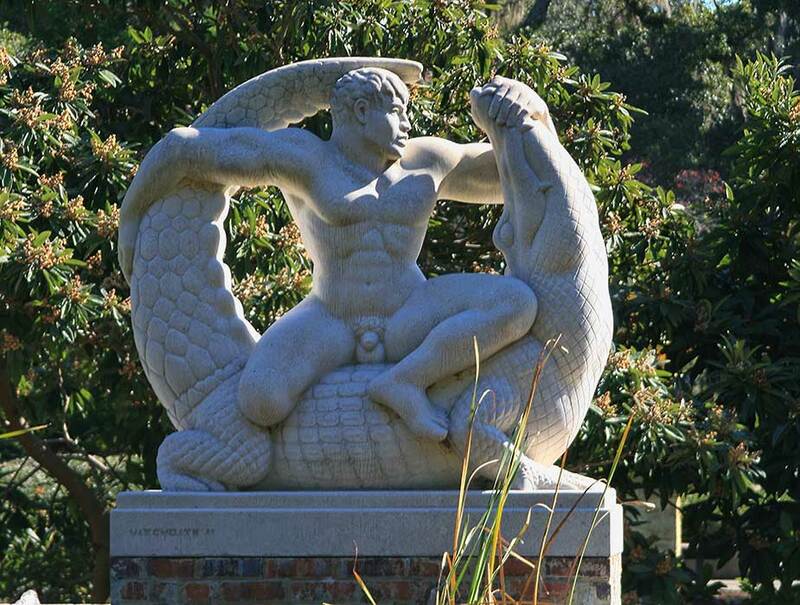 Brookgreen Gardens. The largest online directory. 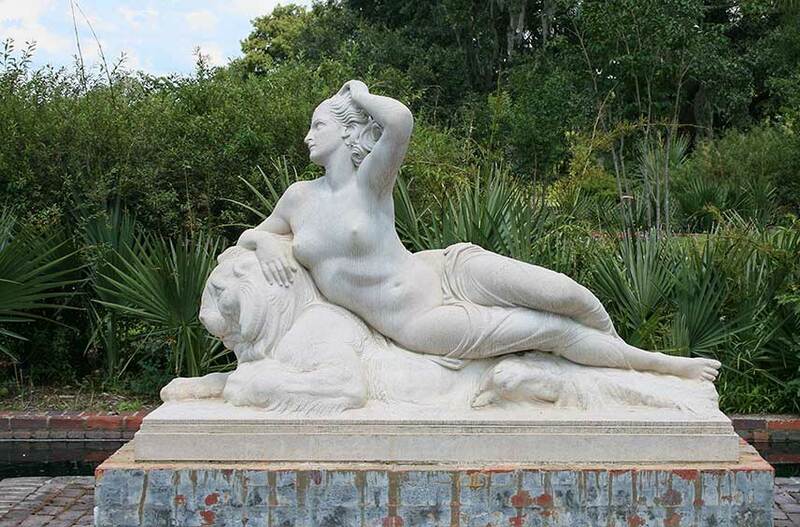 Sculptor's name, date and a photo! 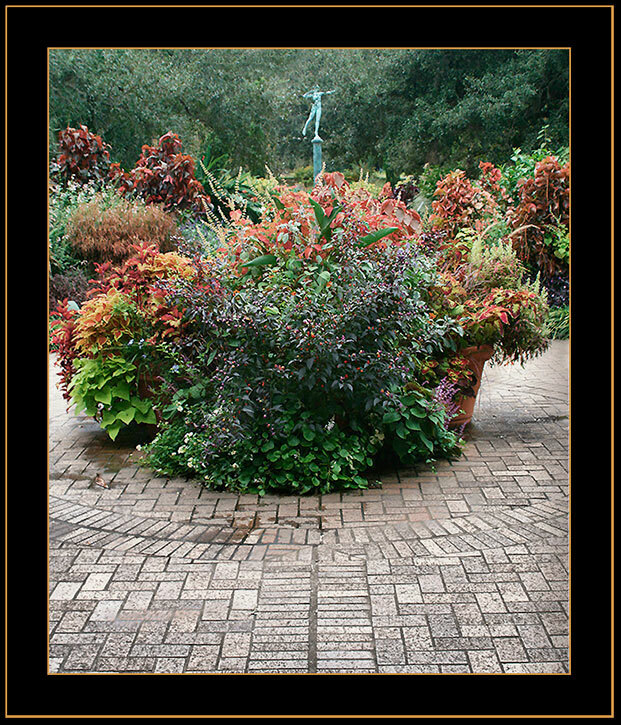 LEGOS My LEGO photos from Brookgreen Gardens! Page 4. 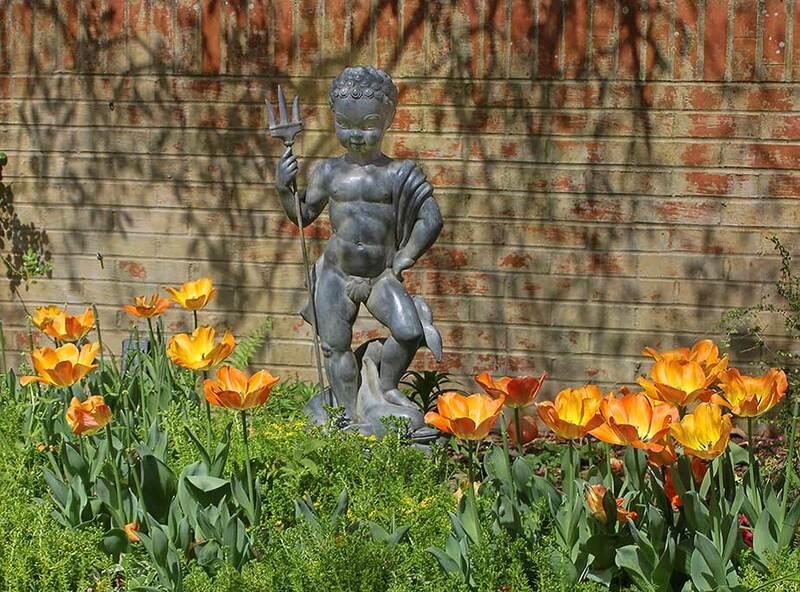 Special Events - Nights of a Thousand Candles, Harvest Home and more. 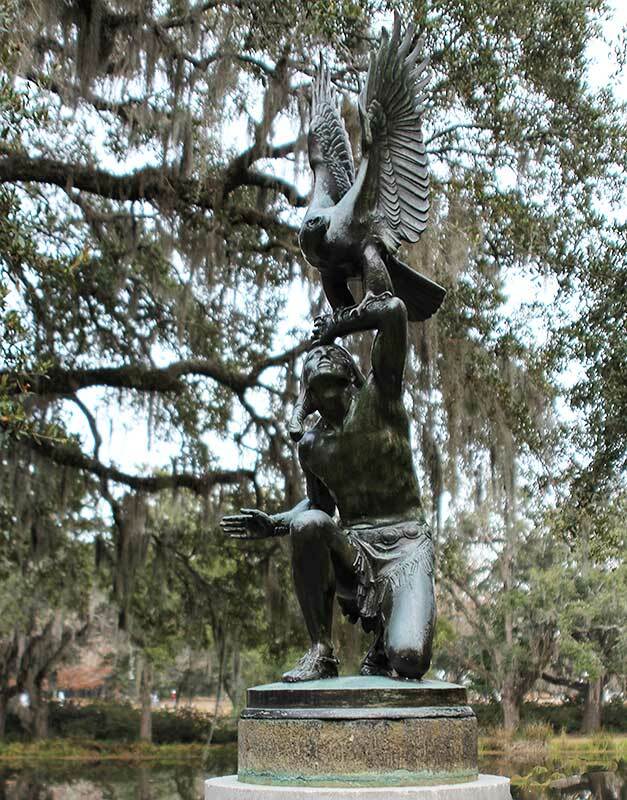 My photos (including Brookgreen) are For Sale! 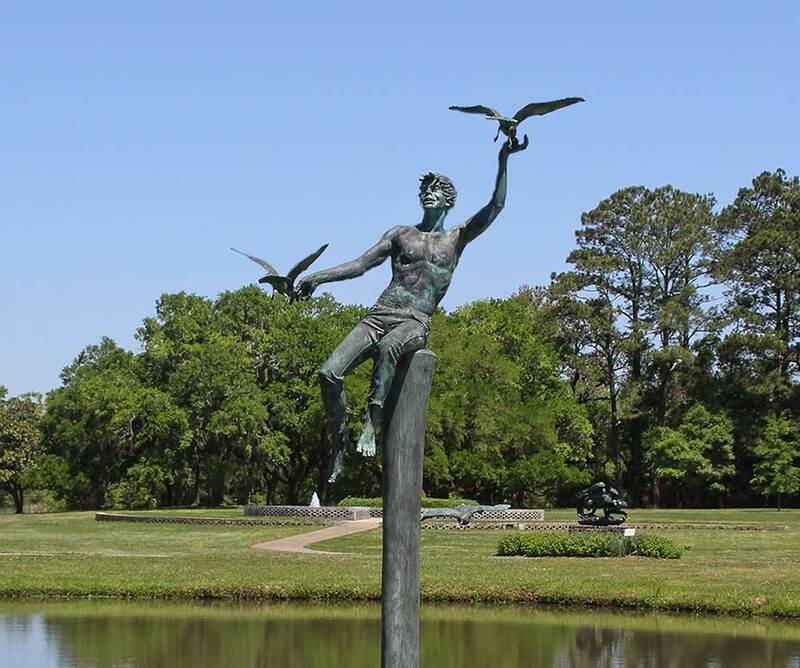 I designed this page to connect sculptors at Brookgreen Gardens with the sculptor, their name, sculpture information, dates and a photo. This project has been challenging and exciting. 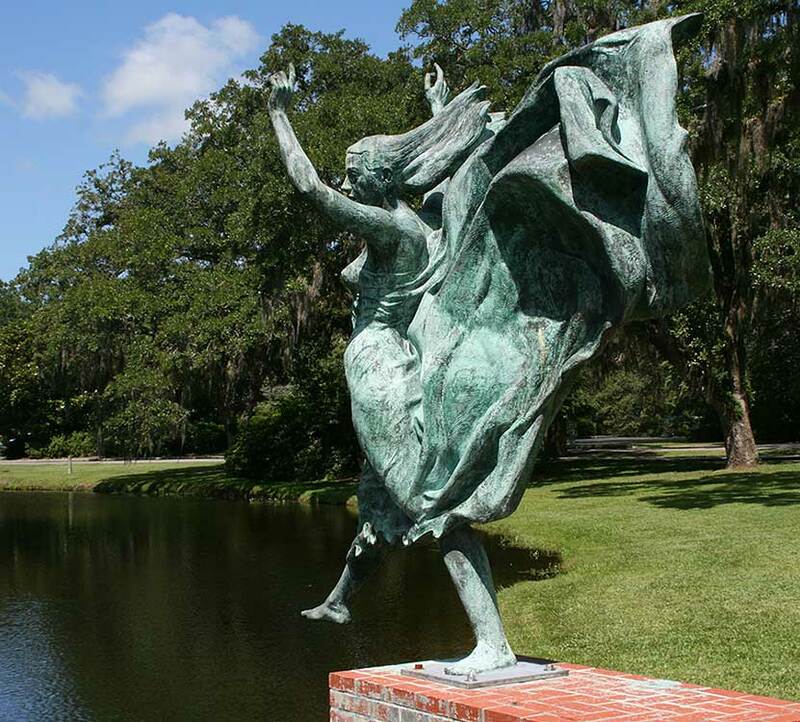 I believe this is the only free Brookgreen webpage with listings of over 200 sculptures at Brookgreen Gardens, connecting the sculpture, the sculptor, information and photos all on one web page. I am the photographer for all of them. 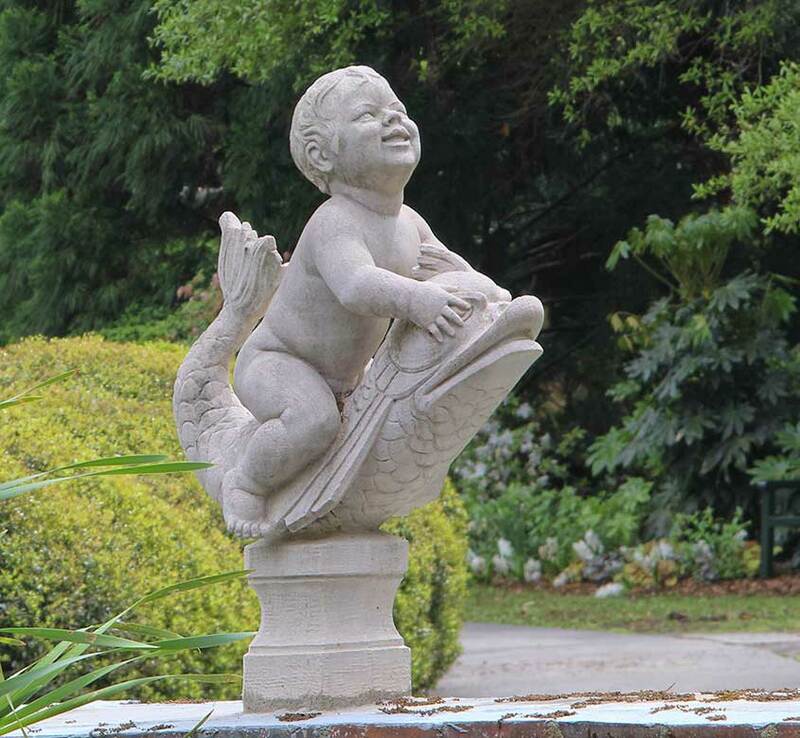 I am always adding more sculptures. 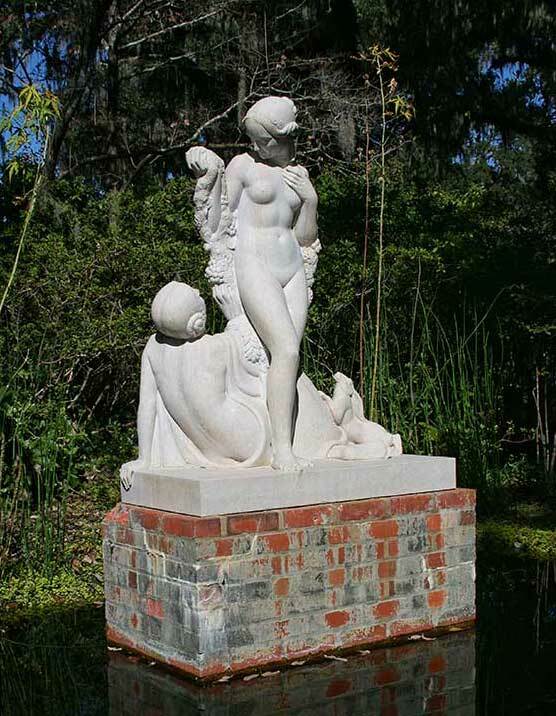 If you are interested in a sculpture not listed here, please send me the name, location or of whatever you remember, or perhaps you have a Brookgreen story to tell. Contact me, Patricia Blackstock. I would love to hear from you. 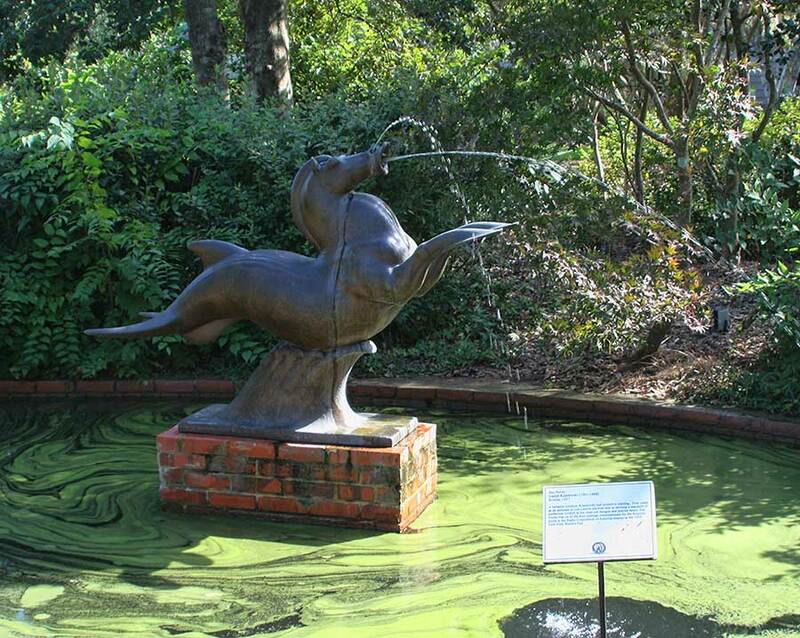 Brookgreen Sculpture Gardens is located just pastMurrells Inlet. 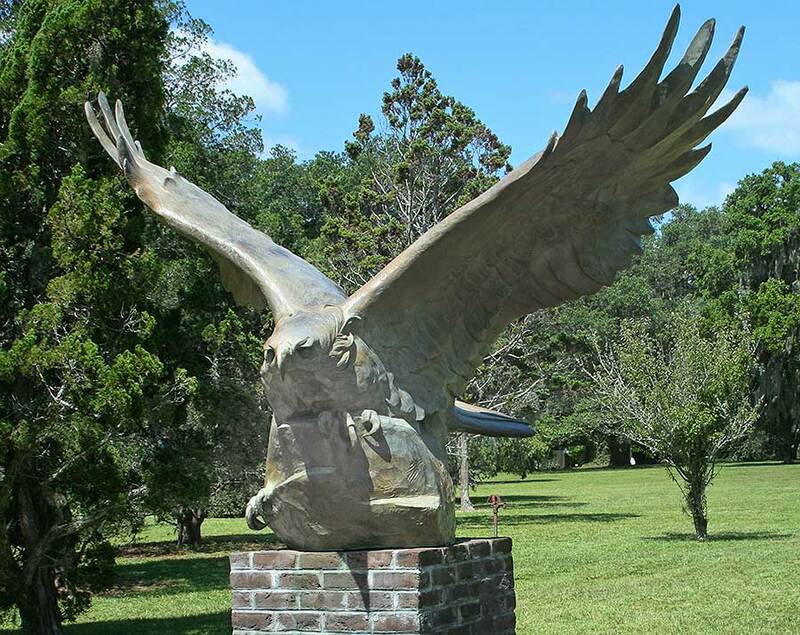 It includes more than 9,000 acres plus a Wildlife Preserve. 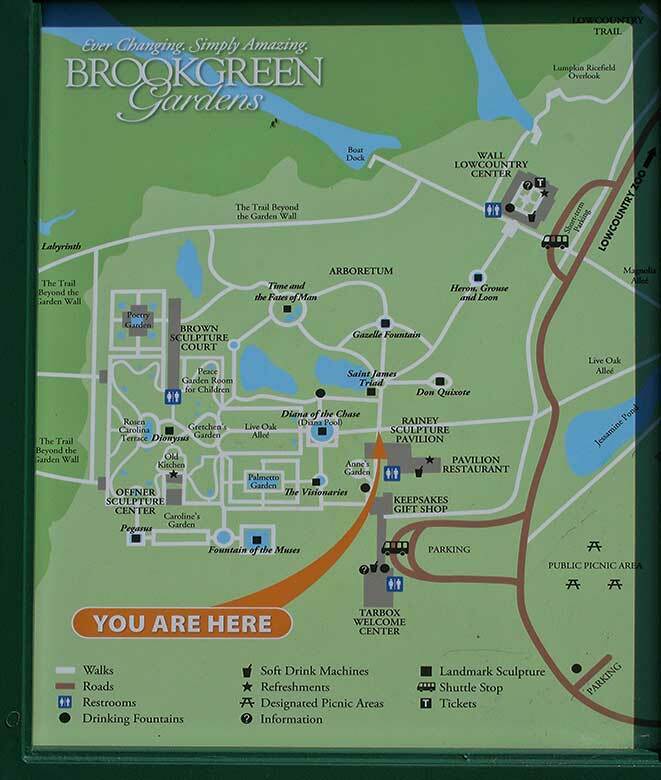 Brookgreen has earned accreditation from the American Assc. 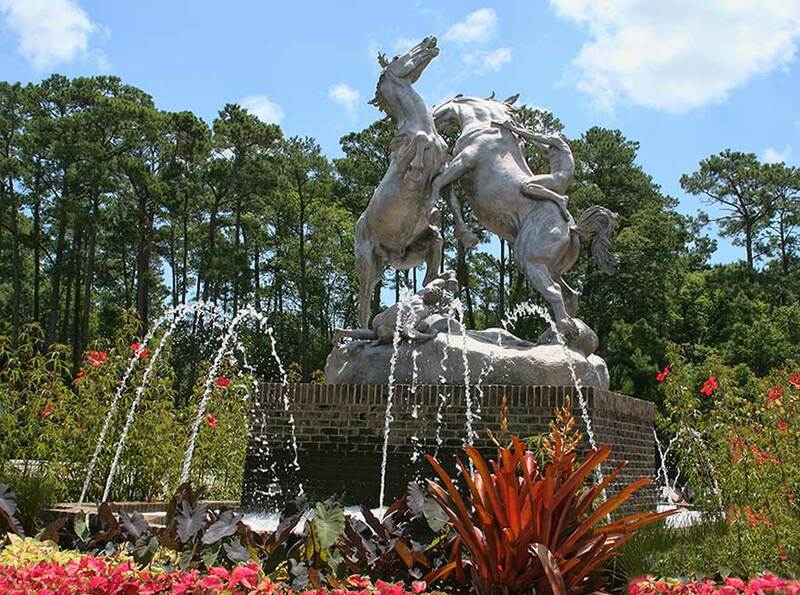 of Museums and the Association of Zoos and Aquariums, as well as being designated as an historic site and being listed in the National Register of Historic Places. 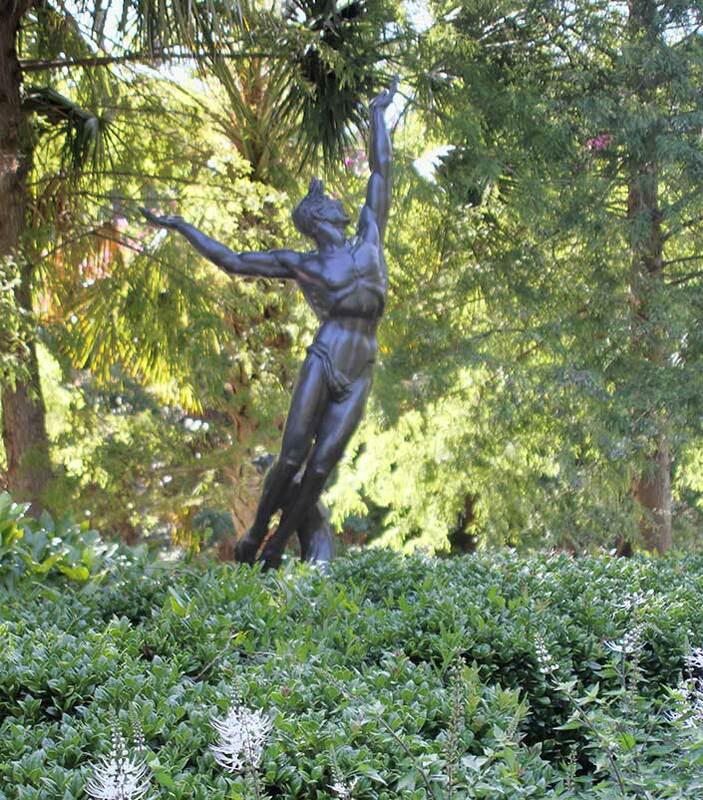 On July 13, 1931, Brookgreen Gardens was officially named the best sculpture garden in the U.S. Archer and Anna Hyatt Huntington founded Brookgreen Gardens in order to show American Sculpture in a garden setting. 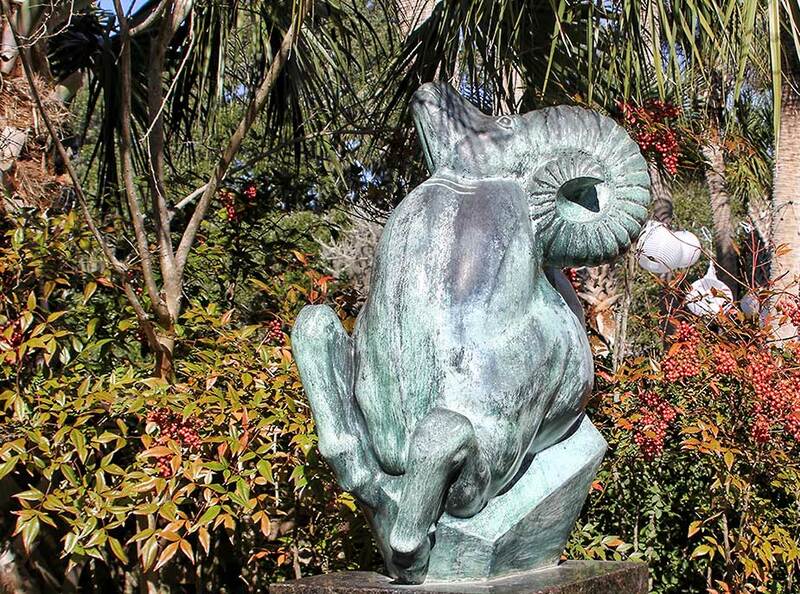 There are currently over 500 sculptures in Brookgreen Gardens. 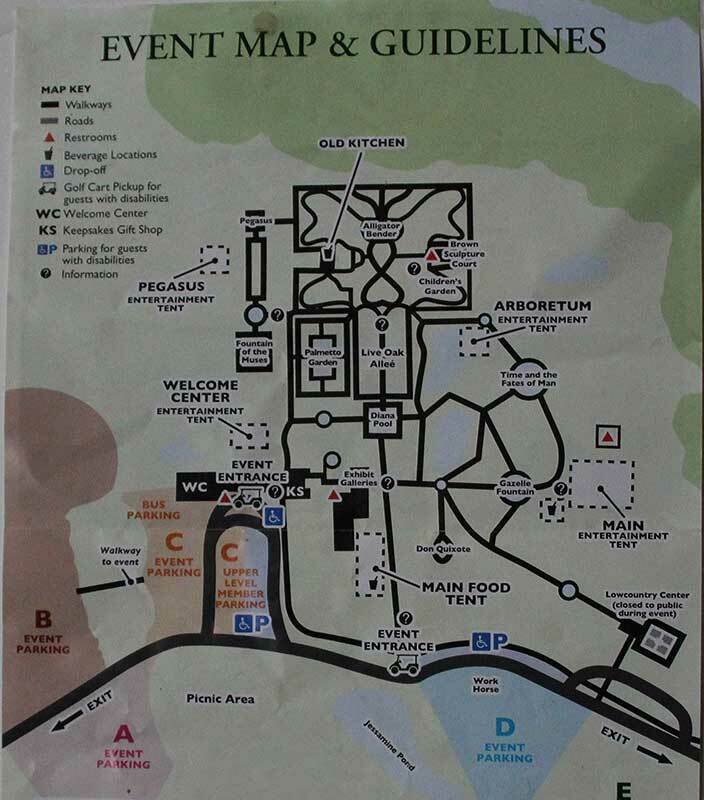 Page 4. 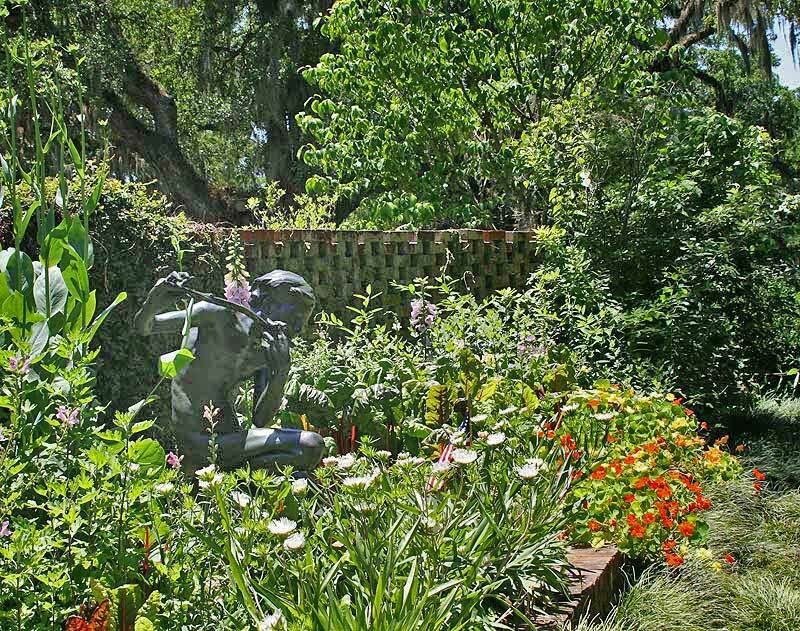 Special Events, Nights of a Thousand Candles, Harvest Home and more. 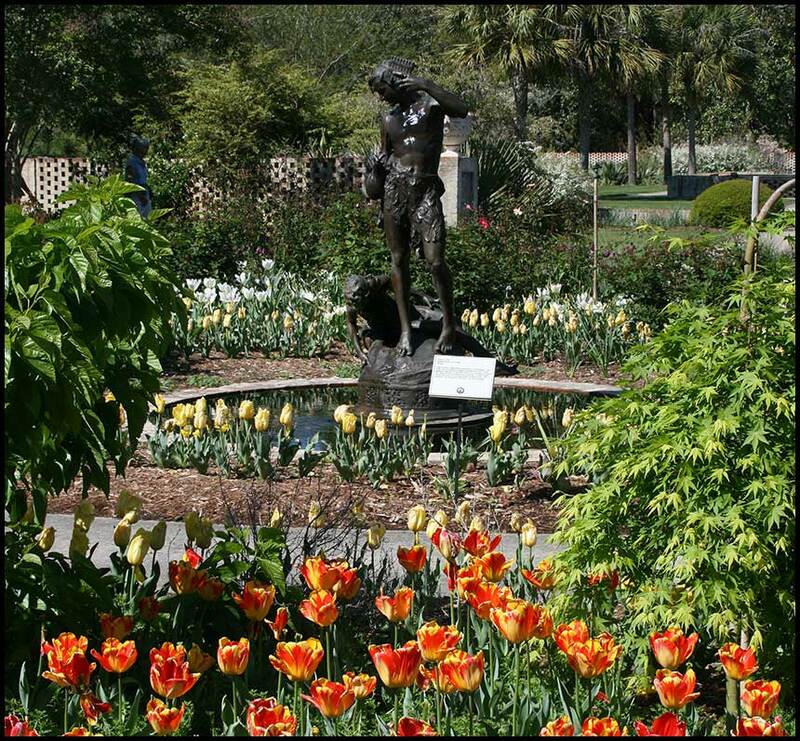 We have been living in Myrtle Been living in Myrtle Beach since 1997, and year after year we have enjoyed our annual family pass to Brookgreen Gardens. 1. (Left.) 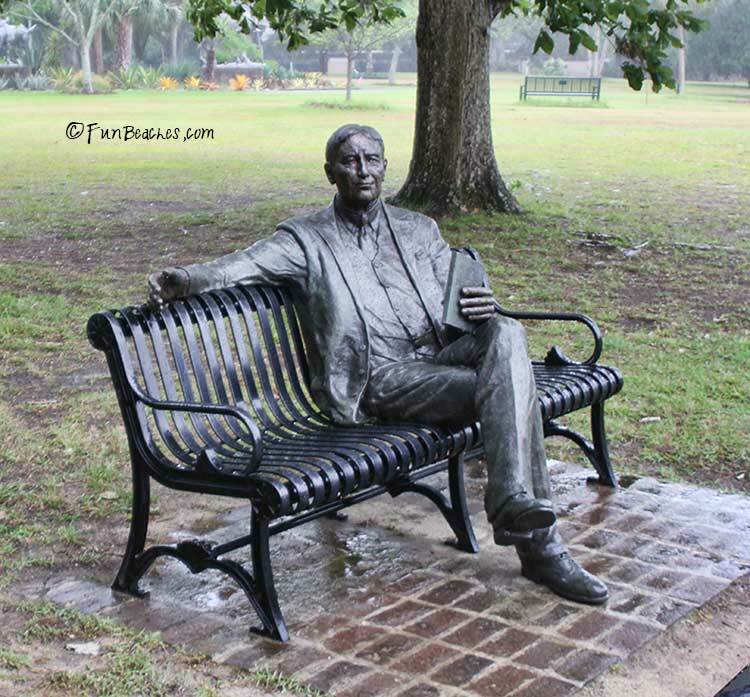 Derek Wernher's realistic old man sitting on a park bench, reading a newspaper. 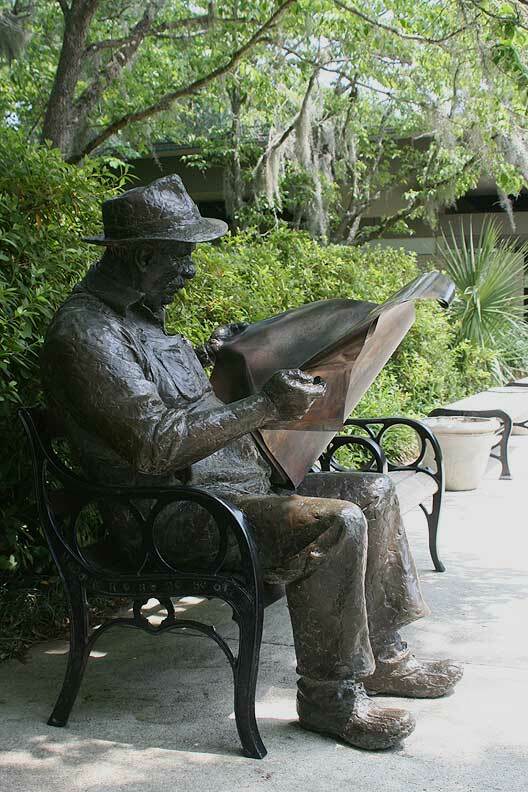 The title of the sculpture is the pen name of the newspaper's editor, Len Ganeway. 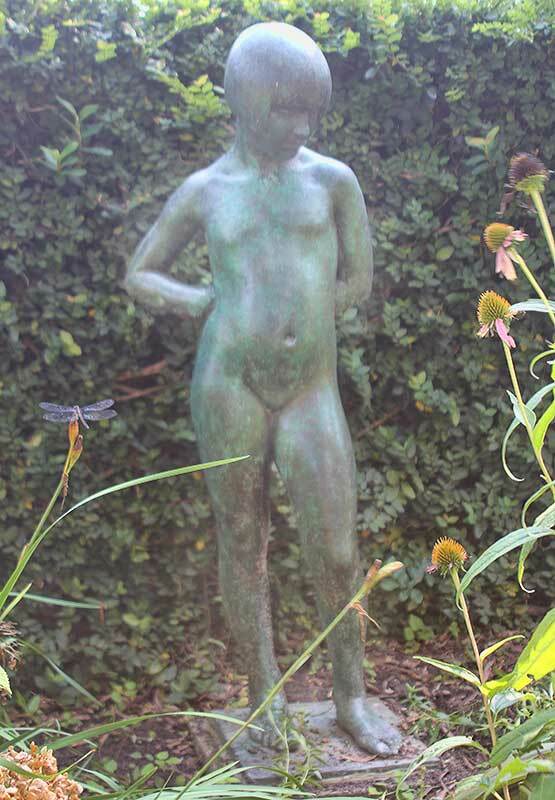 Bronze 1980. 2. 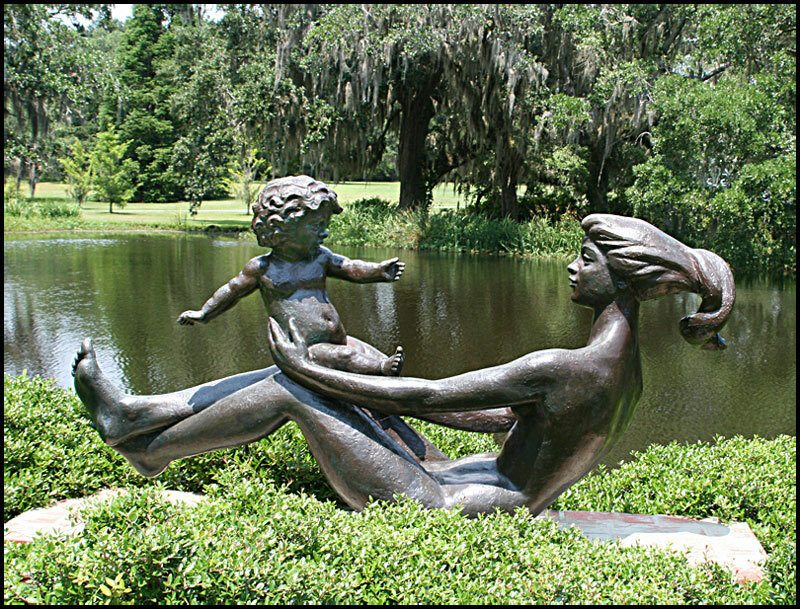 Joy of Motherhood - Willard Newman Hirsh (1905-1982) Bronze - Gift of Mrs. Willard Hirsch. Infusing many of Hirsch's works in the spirit od the love of life. 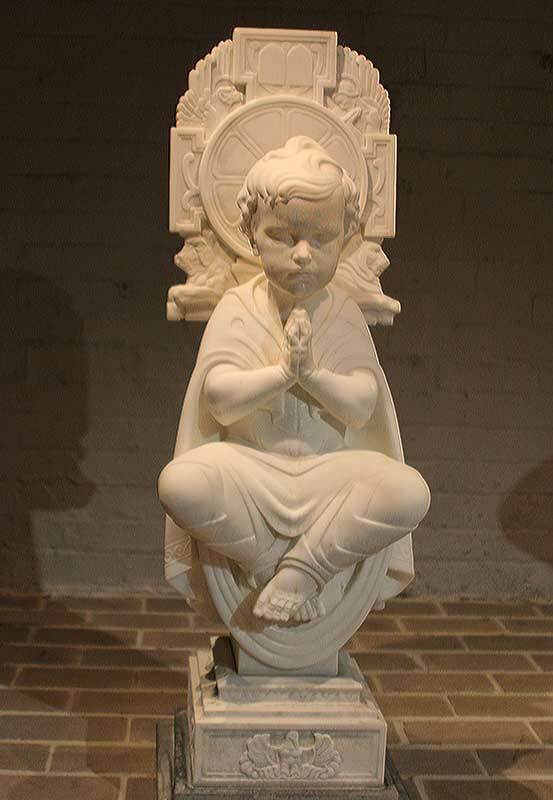 The physical and spiritual bone between mother and child was a favorite theme. 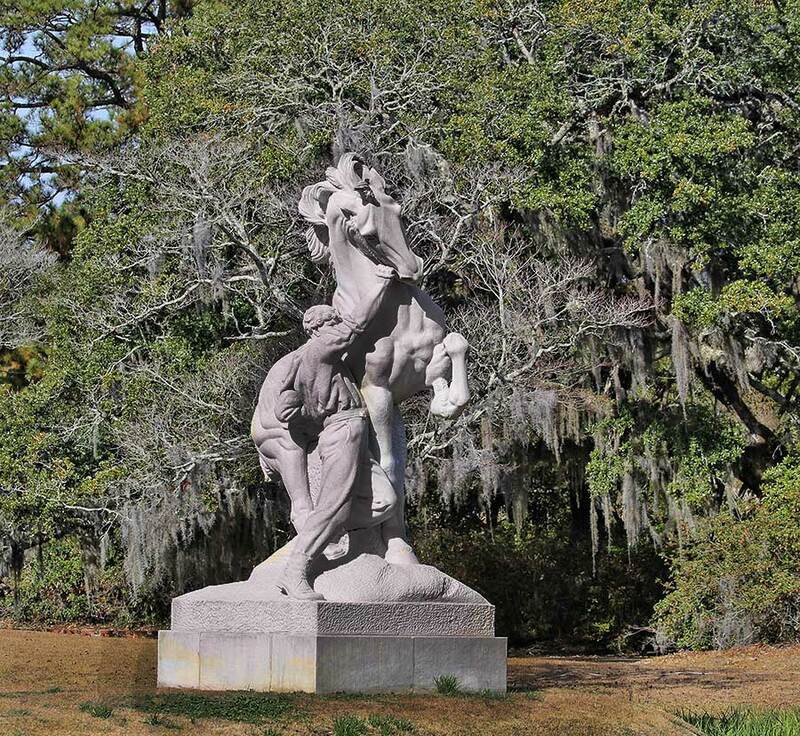 A native of Charleston, SC, Hirsch not only promoted sculpture through his own work, but also as an instructor, provided opportunities for children and young adults learn the creative process. 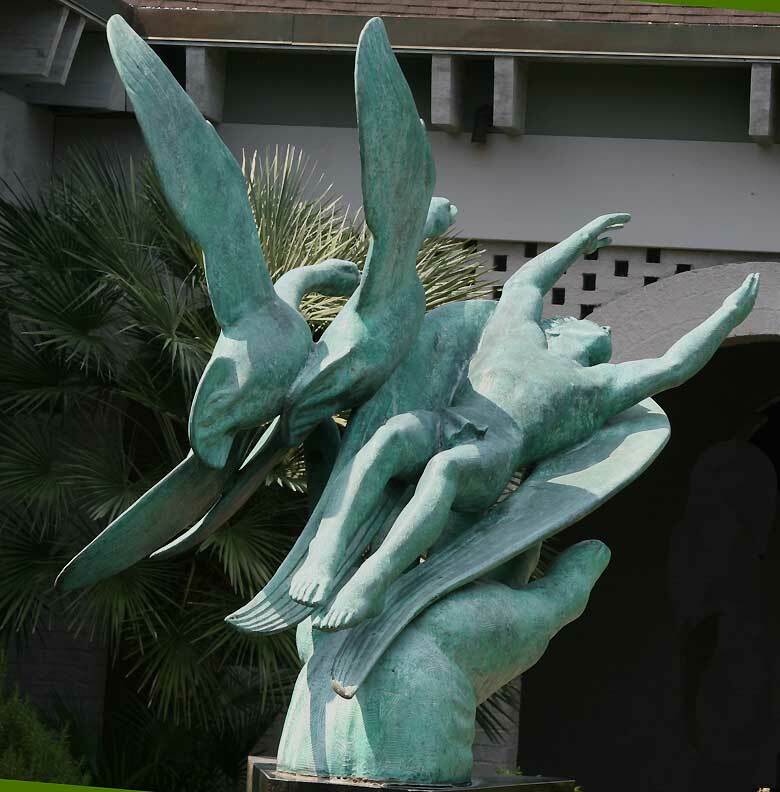 3 The Guardian, Sahl Swarz (1912 - 2004) Bronze, 1937. 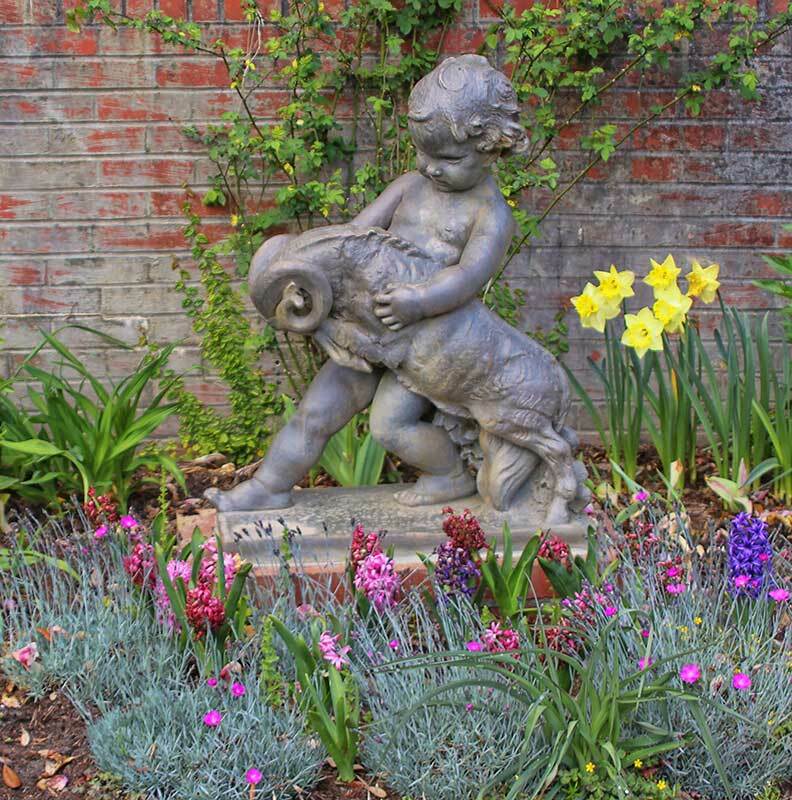 Sahl Swarz was one of Dorothea Denslow's students at the Clay Club in the city of New York. 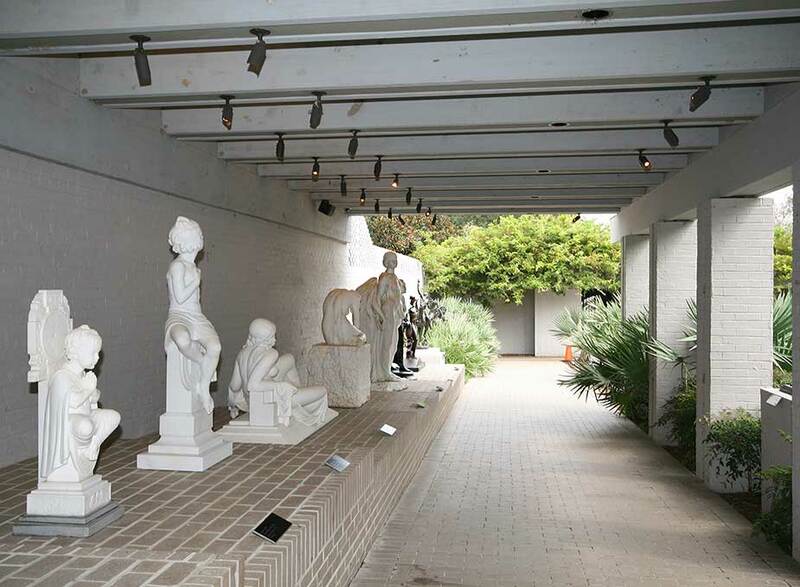 He later became associate director and was part of the evolution into the Sculpture Center. 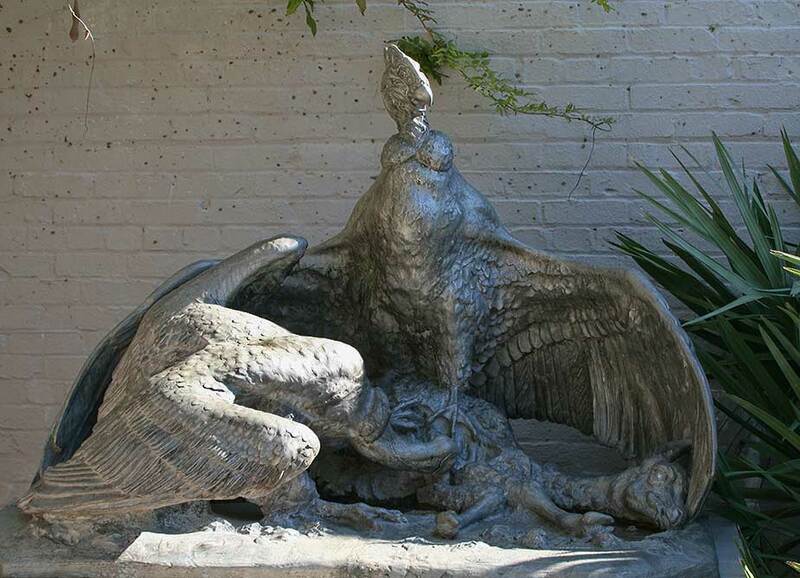 His sculptures were commissioned for government art projects in post offices and courthouses throughout the1930s, 4. 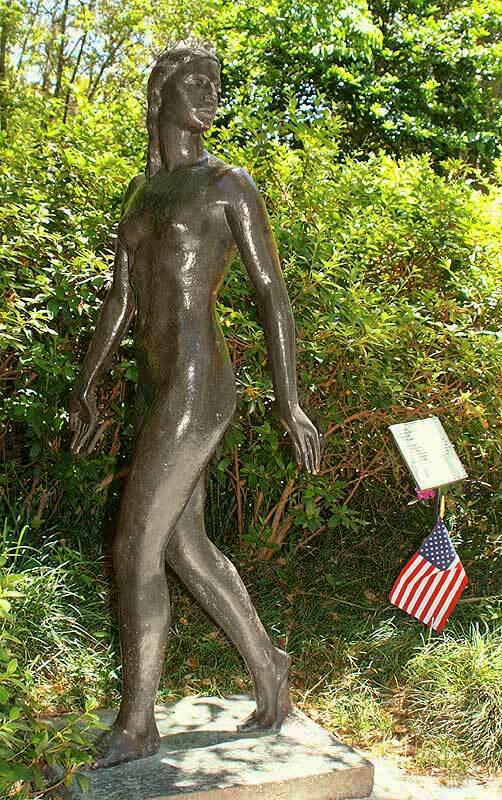 (Currently on loan to the Myrtle Beach Airport (MYR) United We Stand (Flag raising on Iwo Jima) Felix de Weldon (1907-2003) Bronze, 2001, a 13 inch study. 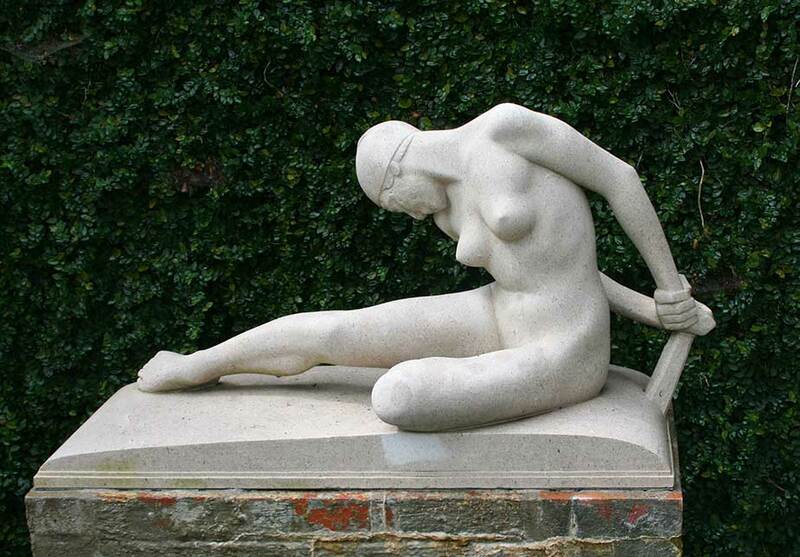 Courtesy of the sculptor's estate. 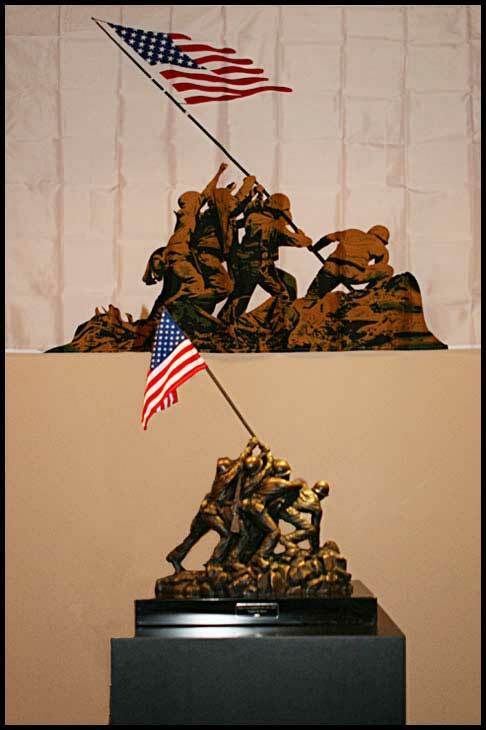 In response to the events of 9/11/2001, Felix de Weldon authorized a special edition of this sculpture, The Flag Raising on Iwo Jima, often referred to as the Marine Corp War Memorial. 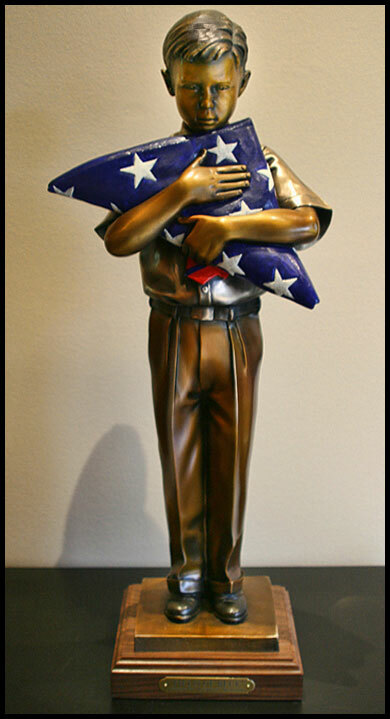 In Weldon's words: "This sculptire stands as the American symbol of unity of action, the will to sacrifice, and America's relentless determination to defend freedom." 5. and 6. 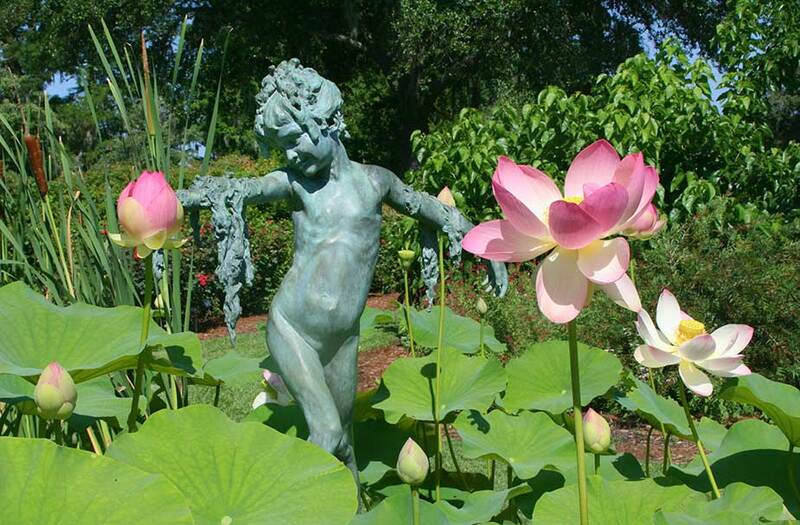 In his will, Richard McDermott Miller 1922- 2004, left his entire collection to Brookgreen Gardens. 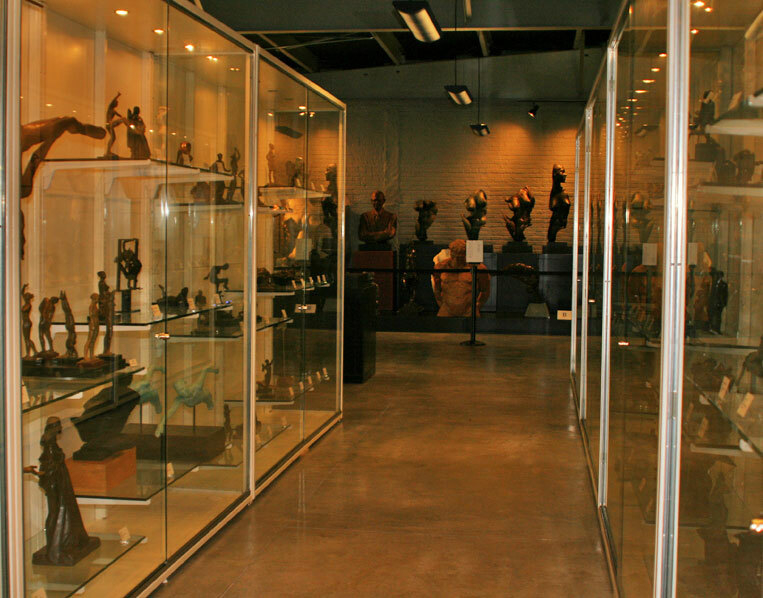 The collection is housed in the Offner Sculpture Center, along with work of other sculptors. 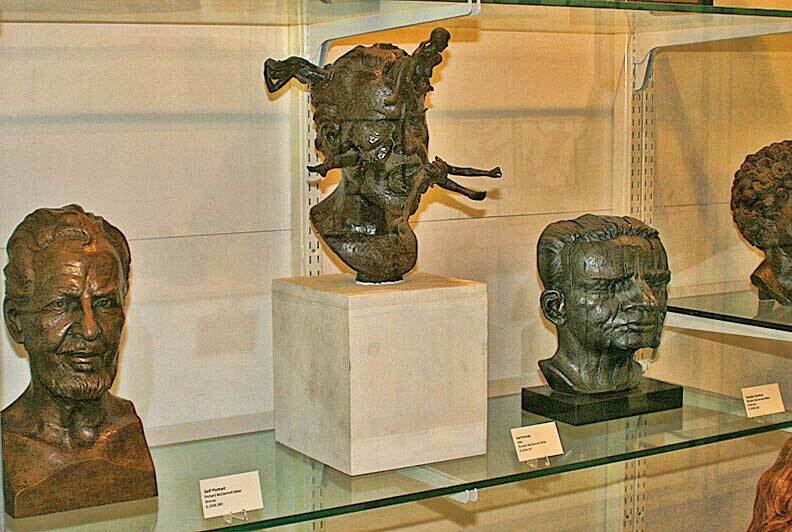 These heads are Miller's selfies. 1. 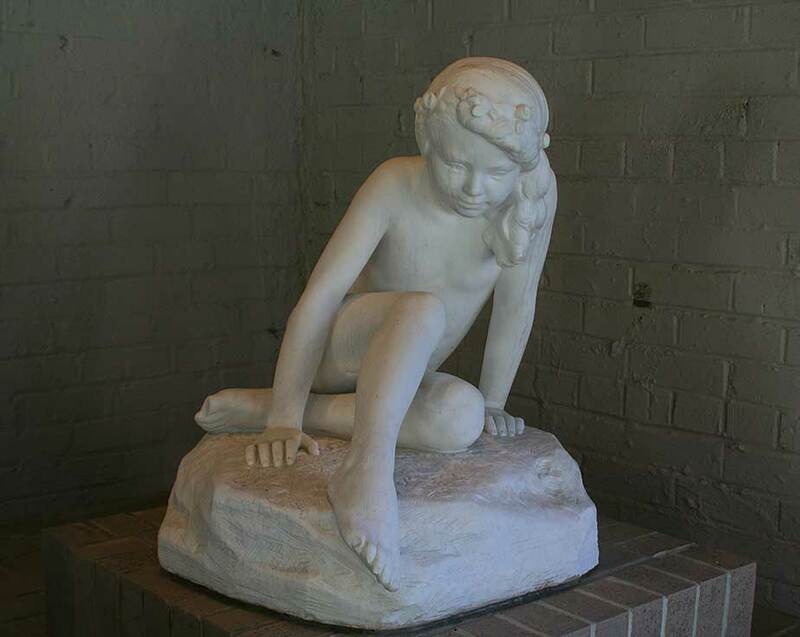 Little Lady of the Sea by Earnest Bruce Haswell 1889-1956. After attending Cincinnati (Ohio) Art Academy, he studied in Brussels at the Academie Royale des Beaux-Arts. 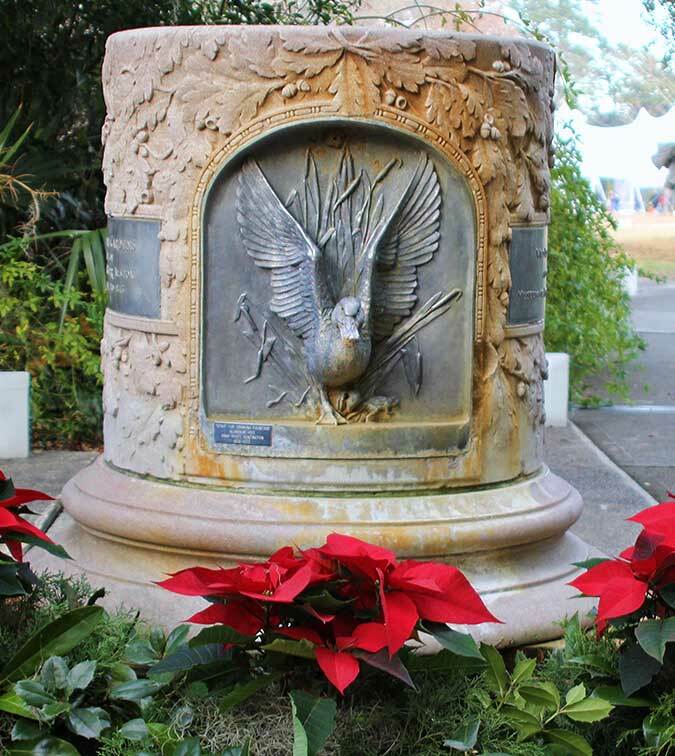 As World War 1 began, he came home and created war memorials for many Ohio towns. 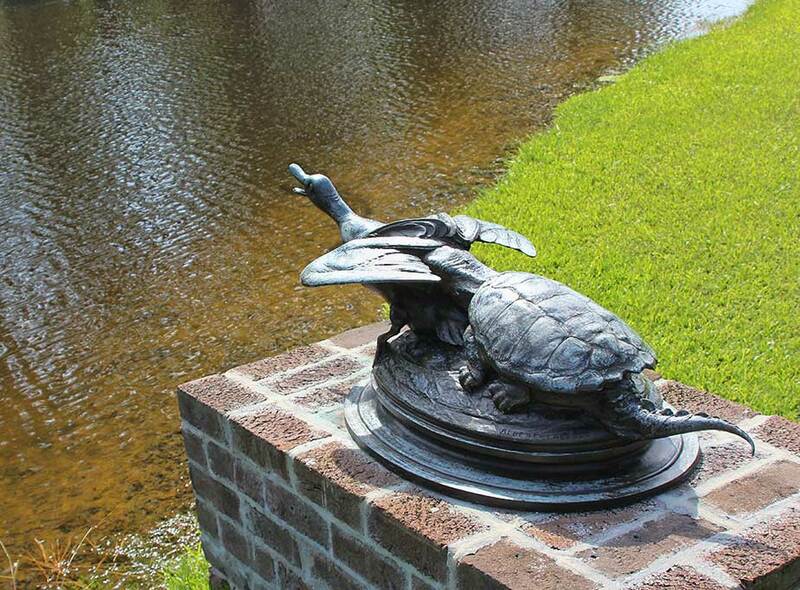 Later he specialized in fountains, sundials and bird baths. 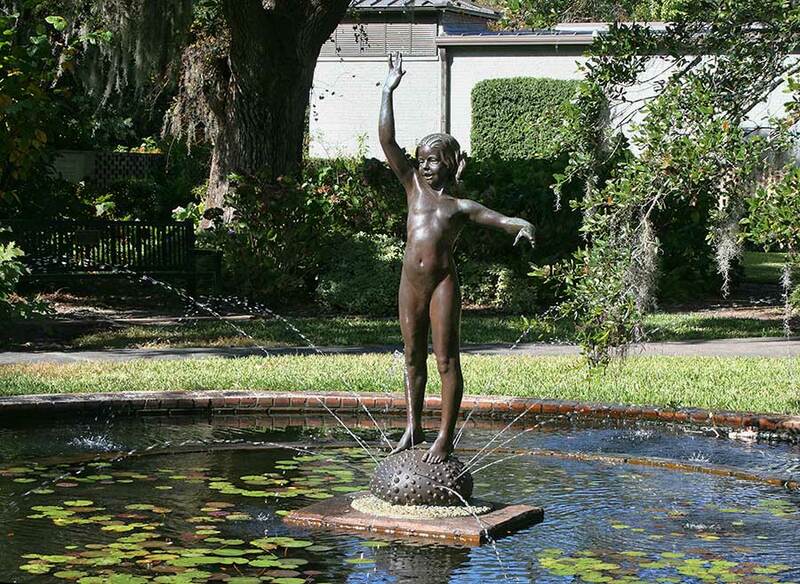 Little Lady of the Sea was acquired by Brookgreen in 1932. 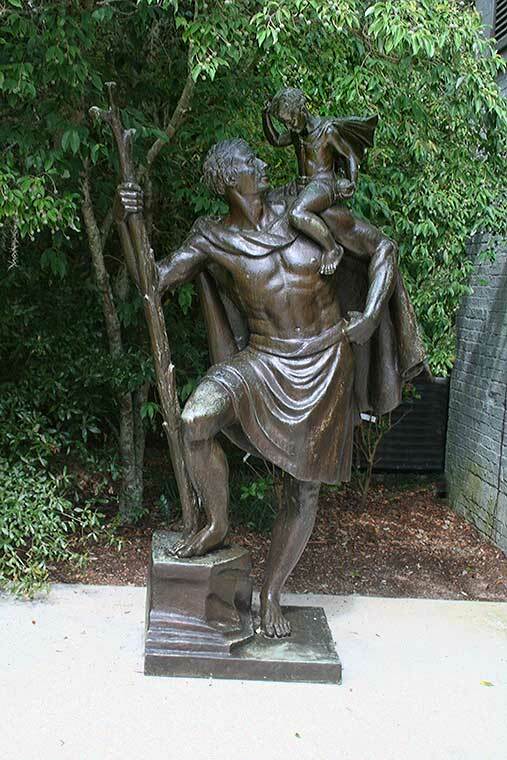 2 The Saint James Triad sculpture is the subject of the book "Voices in Bronze." 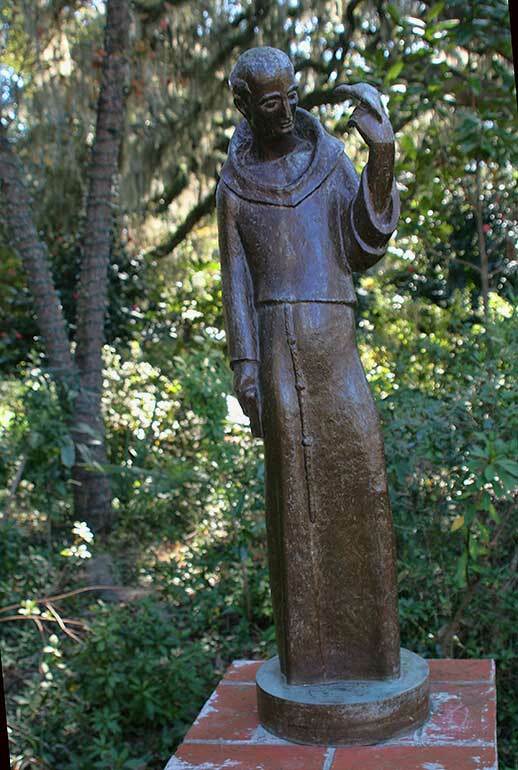 Richard McDermott Miller 1996-1997. 3. 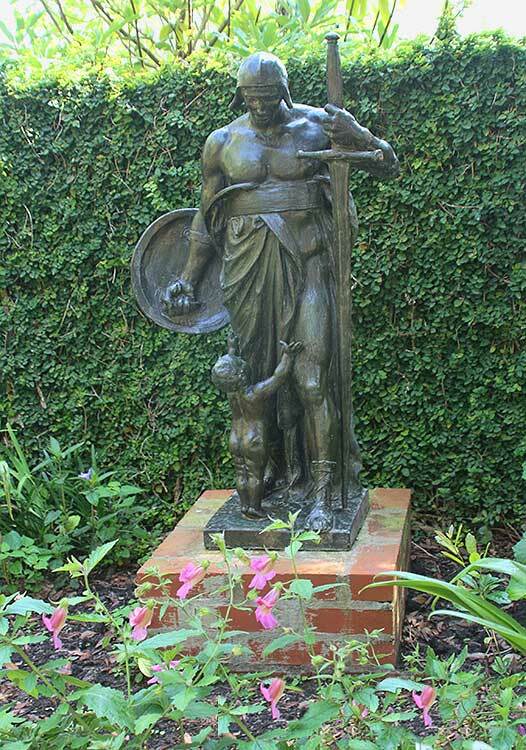 Dionysus Gilt Bronze, 1936 by Edward Francis McCartan. 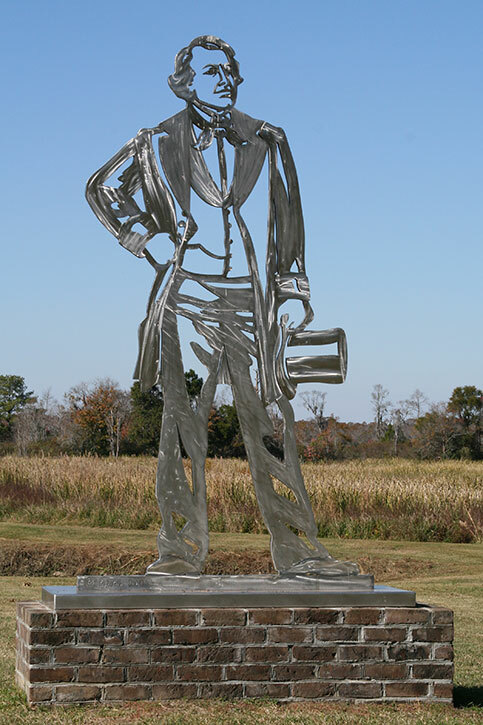 The life-size figure displays McCartan's elegant use of line, giving balance and harmony to the overall commission. 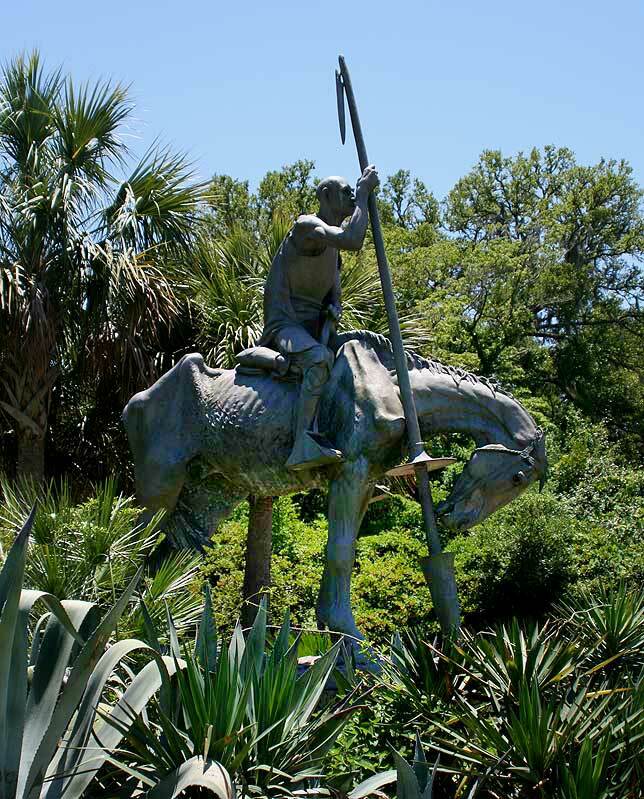 4 Don Quixote - Aluminium 1947 by Anna Hyatt Huntington. 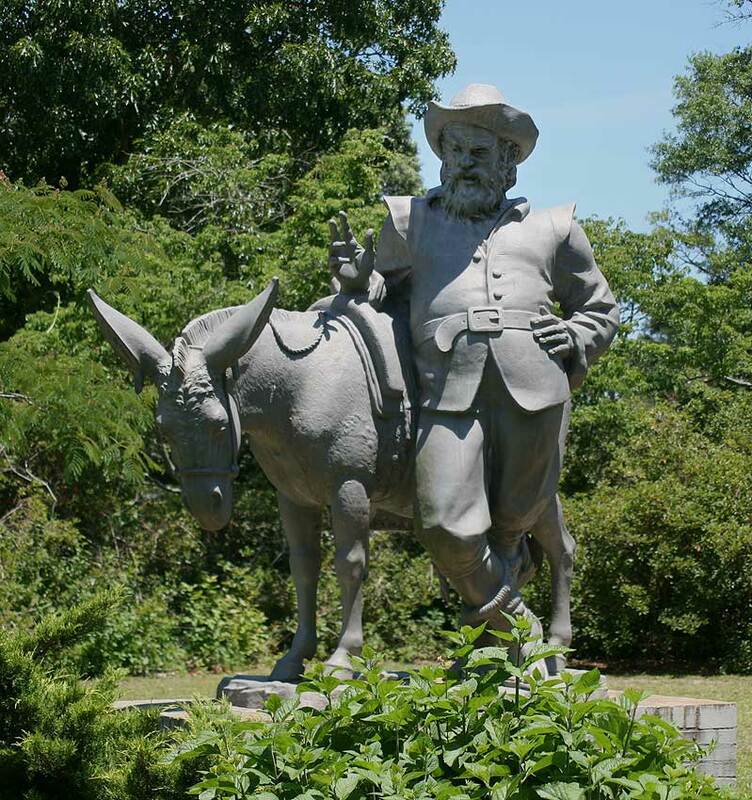 5 Sancho Panza, Aluminium, 1971 by Carl Jennowein, commissioned by Huntington as Don Quixote's companion. 6. 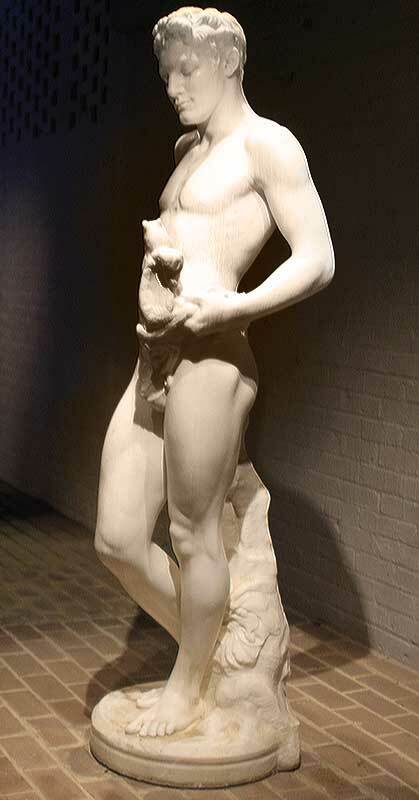 The Athlete (1915) by Rudolf Evens, 1887-1960 represents the harmonious beauty of fine physique. 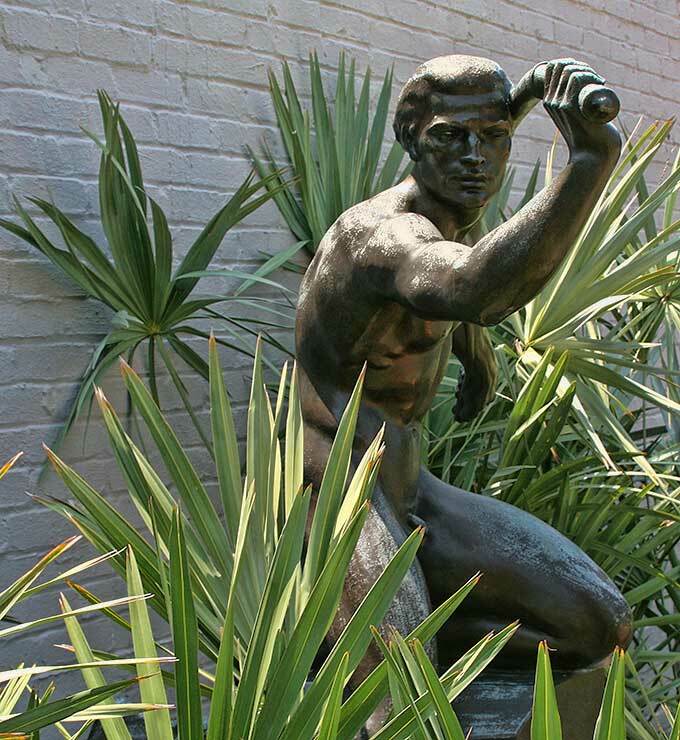 The model was a javelin thrower and champion middleweight wrestler. 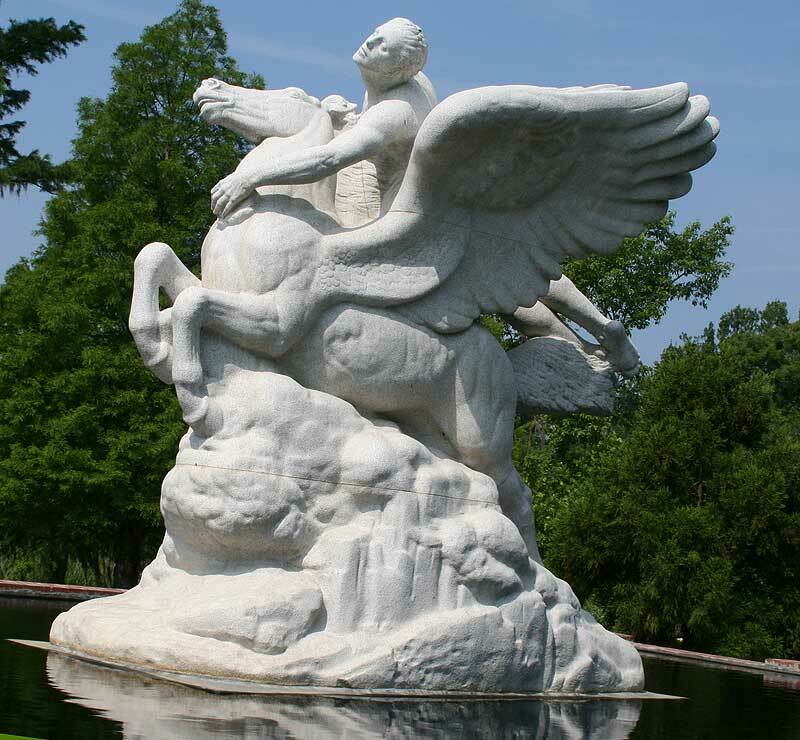 Also known for his "Thomas Jefferson" located inside the Jefferson Memorial in Washington, DC. 1. 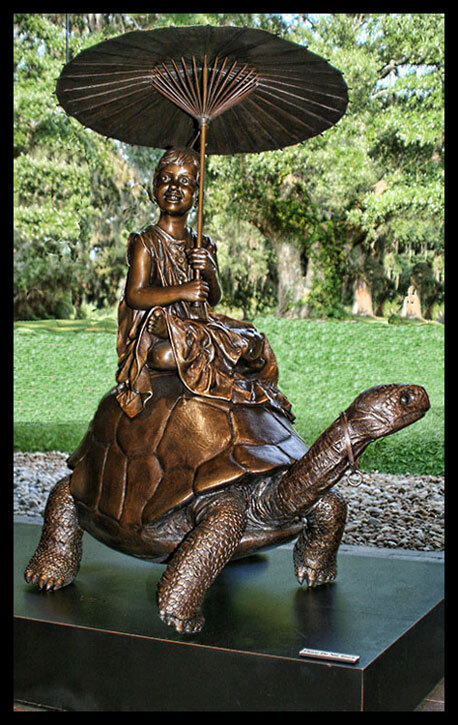 Tortoise Fountain, Janet Scudder (1873 - 1940) Scudder was among the first group of American artists to specialize in figures for garden settings. 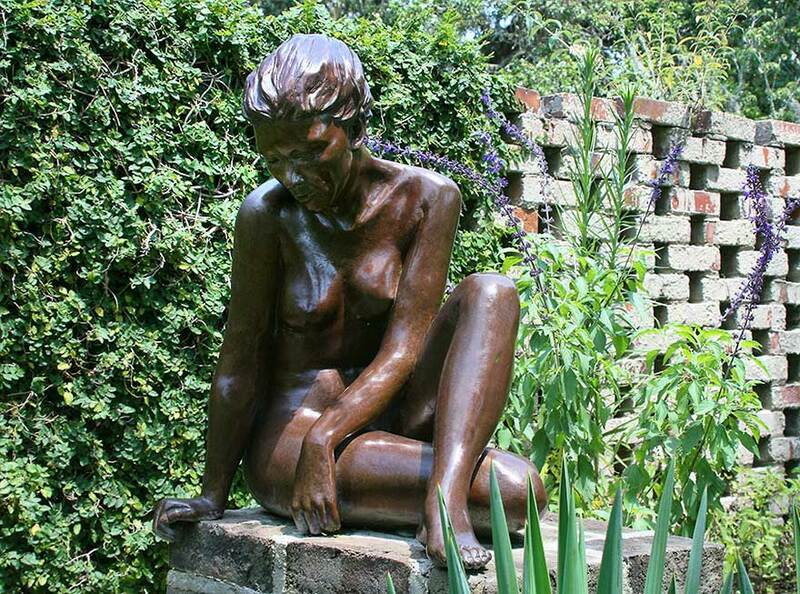 According to the artist, her aim was to please and amuse the world with her sculpture. 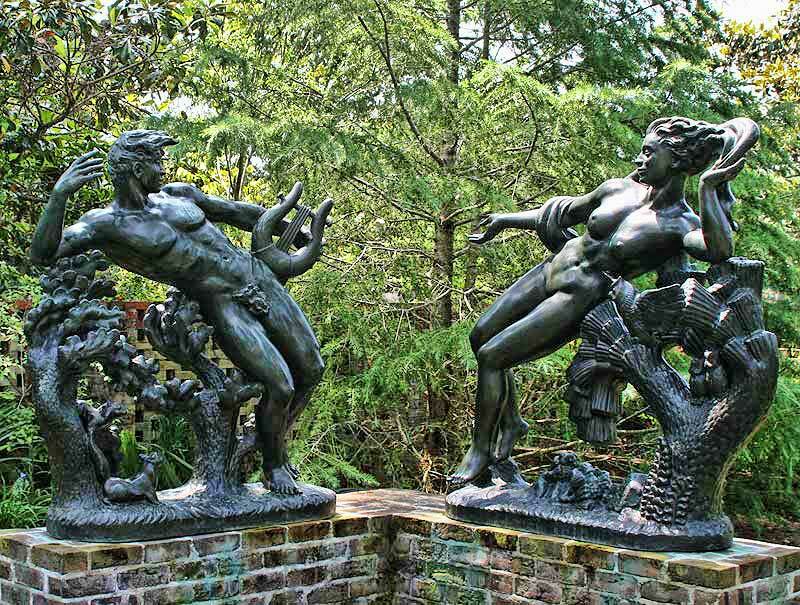 Lead garden figures were part of a series of castings known as the "Childhood of the Gods" designed by Wheeler Williams in 2940 and made available to the public in 1942 through such patrons as Anna Hyatt Huntington 2. 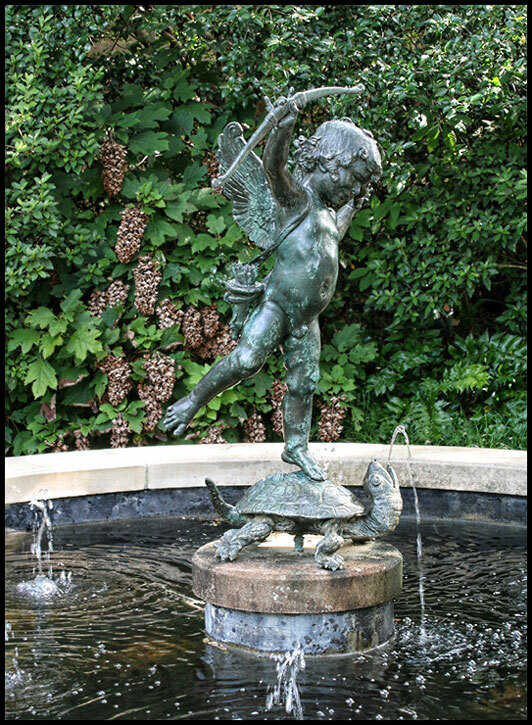 The lead garden sculpture series is an art of castings known as "The Childhood of the Gods" designed by Wheeler Williams in 1940 and made available to the public in 1942 through such patrons as Anna Hyatt Huntington. 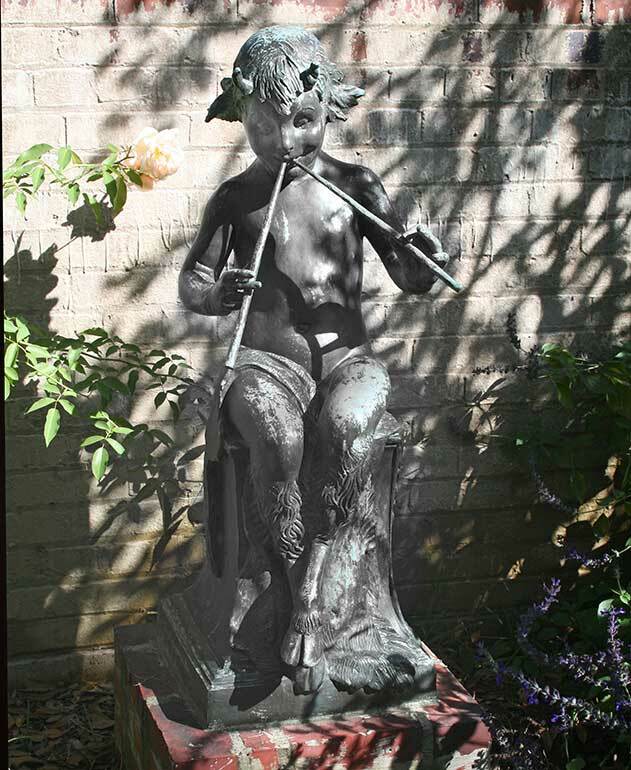 Flute Boy 3. Mother and Baby Bear 4. 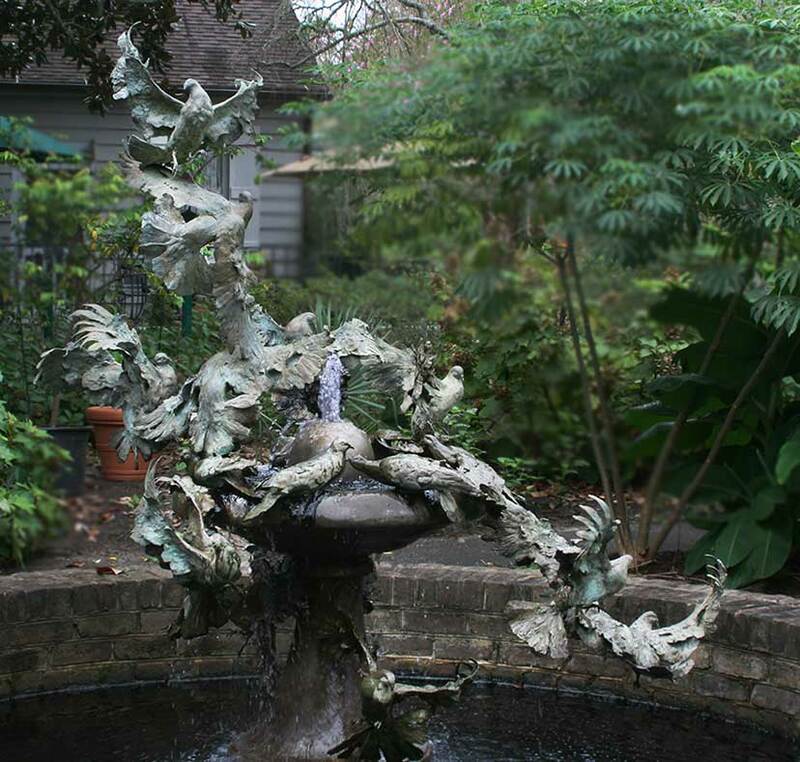 Wood Nymphs, Henry Hering (1874-1949) Aluminum, 1932. 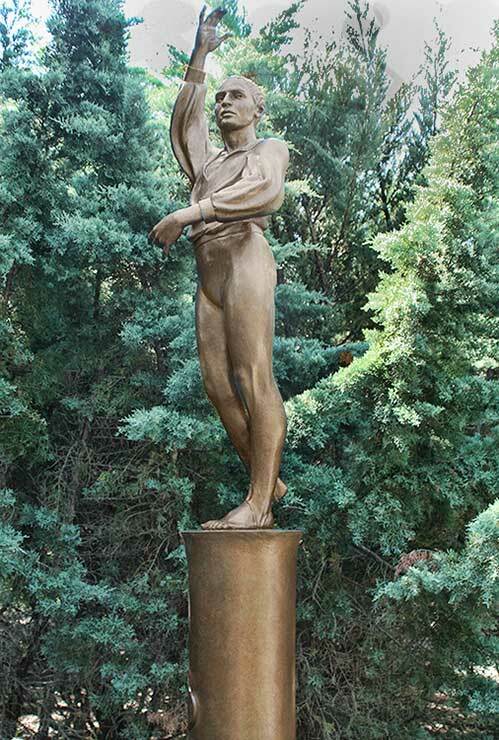 Hering worked for sculptor Philip Martiny, then studied with Augustus Saint-Gaudens, eventually becoming his assistant. 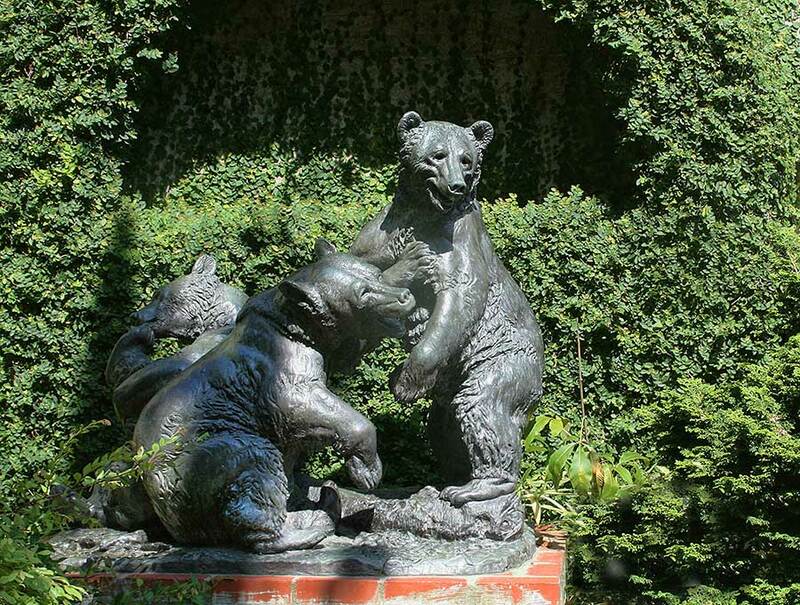 (1.- 4.located in the Children's Garden.) 5. 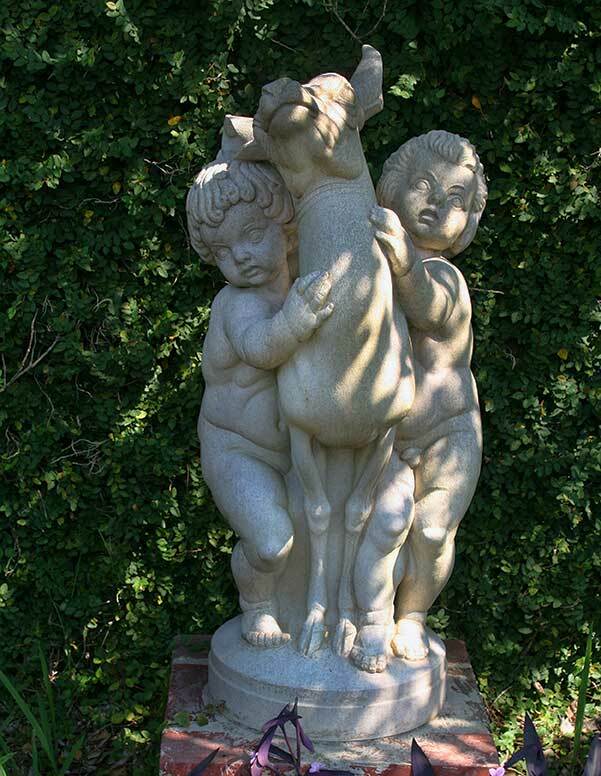 Pastoral by Edmond Romulus Amateis (1897-1891) Tennessee Marble, 1924. 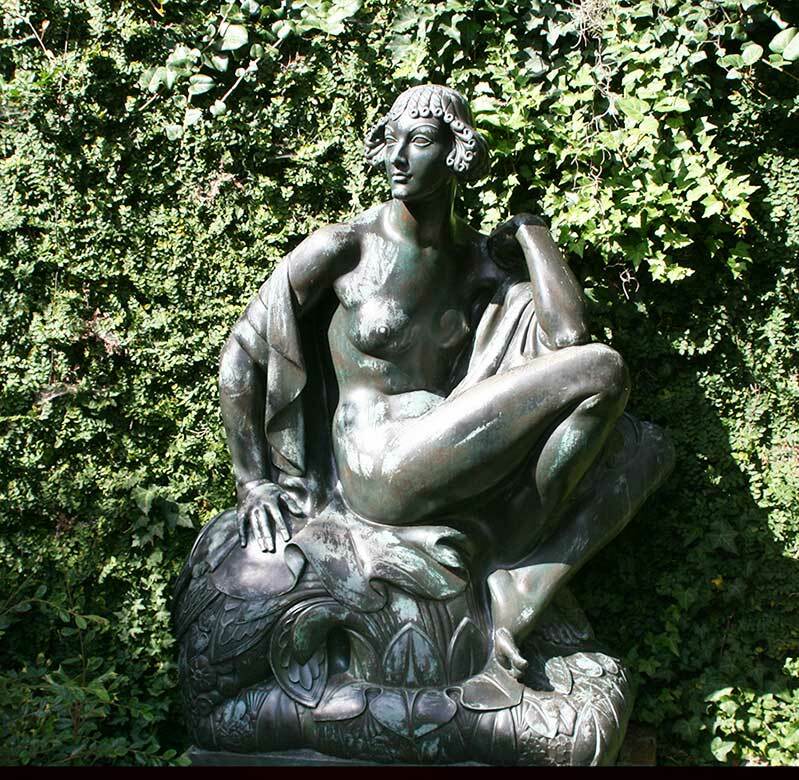 Amateis was drawn to the work of the Italian Renaissance.His intent for good composition and skill resulted in important sculpture commissions. 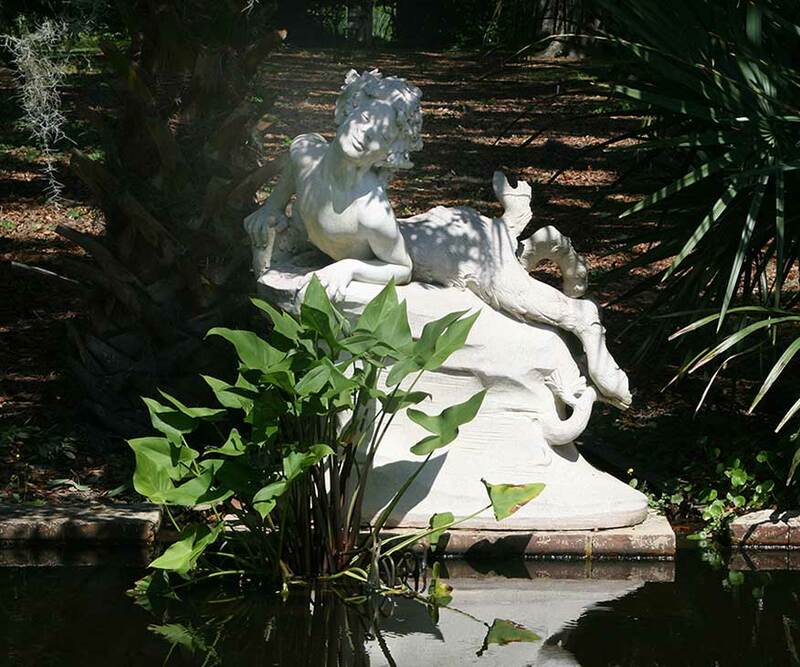 Originally titled Mirafiore, this sulpture was modeled in Rome where Amateis was a student at the American Academy. 6. 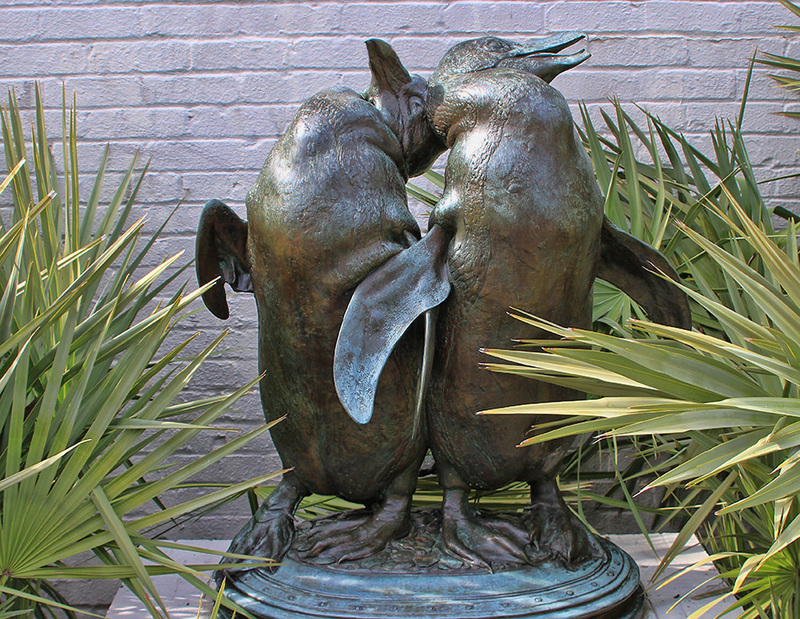 Penguins by Albert Laessle (1877 - 1954) Bronze, 1917. S.1936.047 Click each photo to enlarge. 1. 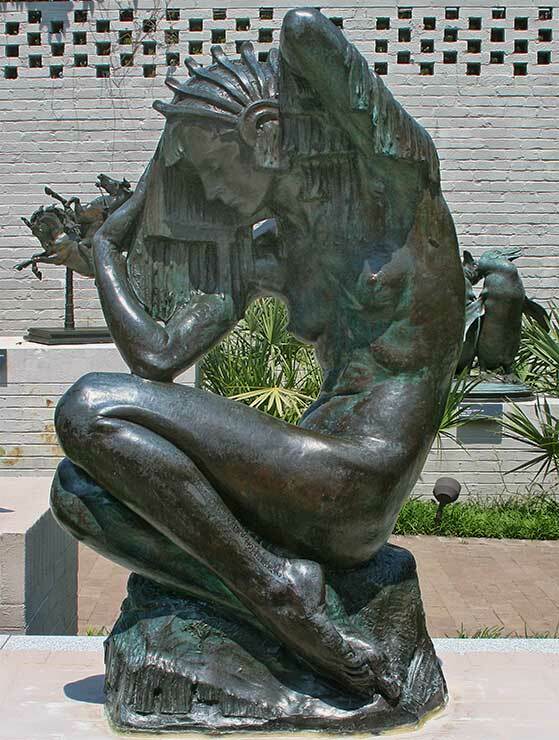 Persephone by Marshall Maynard Fredricks (1908-1998) Bronze. 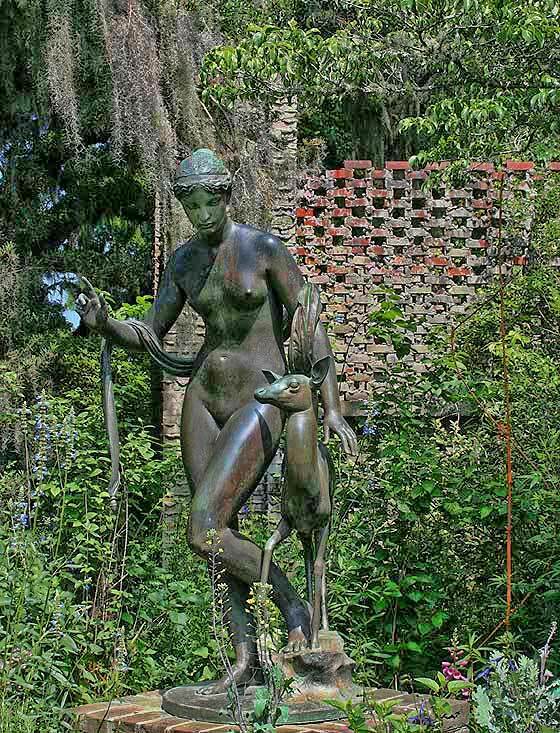 Persephone, Greel Goddess of spring and queen of the underworld, was allowed to spend 6 months of the year in Hades with her husband, Pluto, and 6 months above ground with her mother, Demeter, goddess of the Harvest. Fredricks depicted at the moment of her ascension from the world of the dead to the relm of the living, just as a plant sprouts below ground and emerges through the soil. 2. 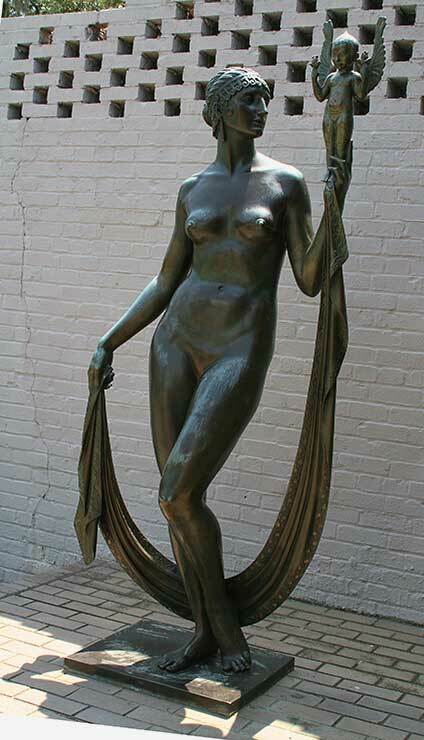 Evening by Paul Howard Manship (1885 - 1966) Bronze, 1938 - Evening is the study sculpture for one of our sculptures known as "The Moods of Time" that Paul Manship created for the 1939 New York World's Fair. 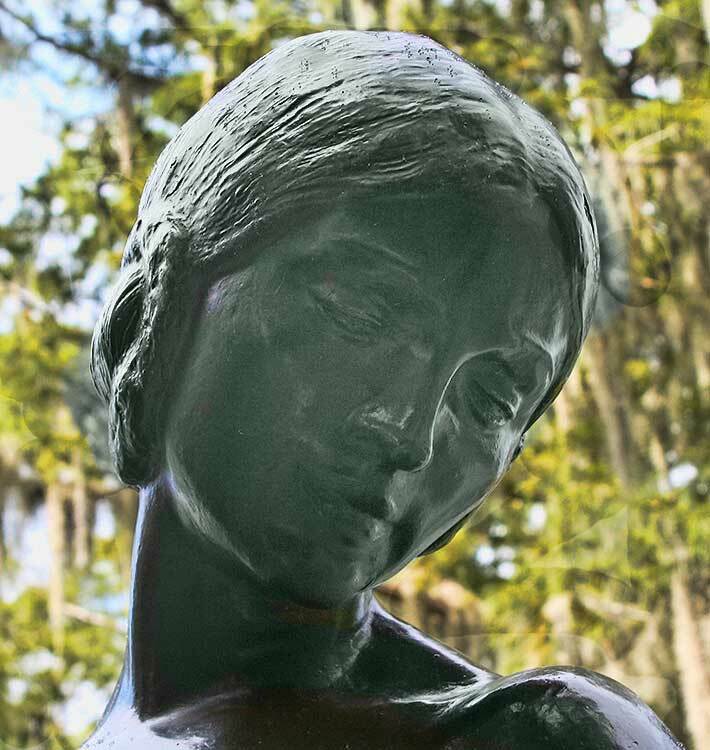 Manship repeated the use of figures in a floating, horizontal design in many of his successful works. 3. 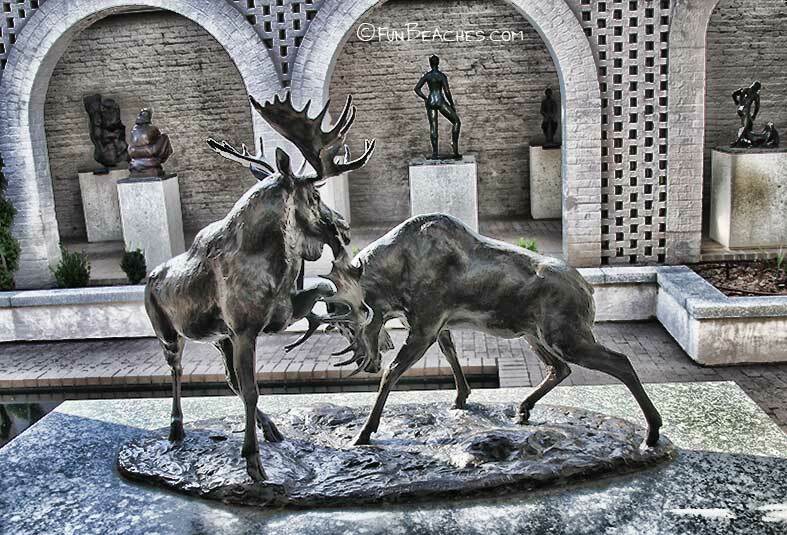 Gazelle Fountain by Marshall Maynard Fredericks (1908-1998) Bronze. 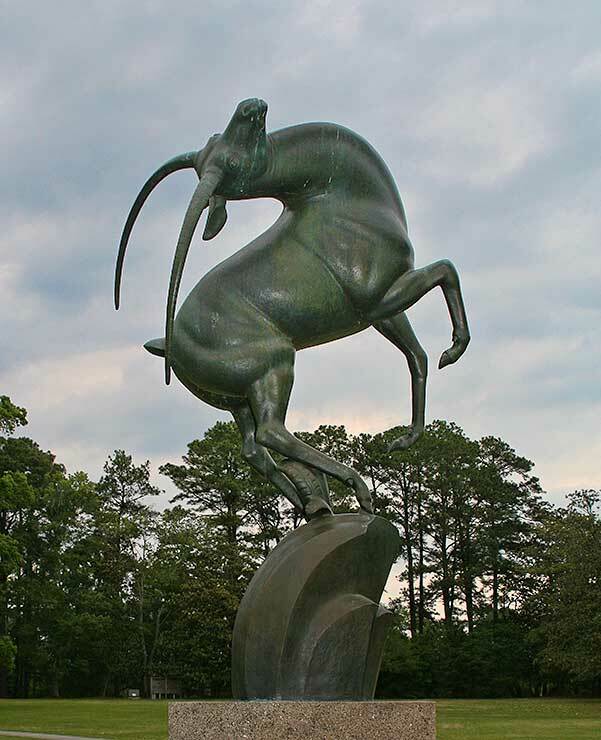 The sleek gazelle was adapted from the central figure of the Levi Barbour Memorial Fountain on Belle Isle near the Detroit River. 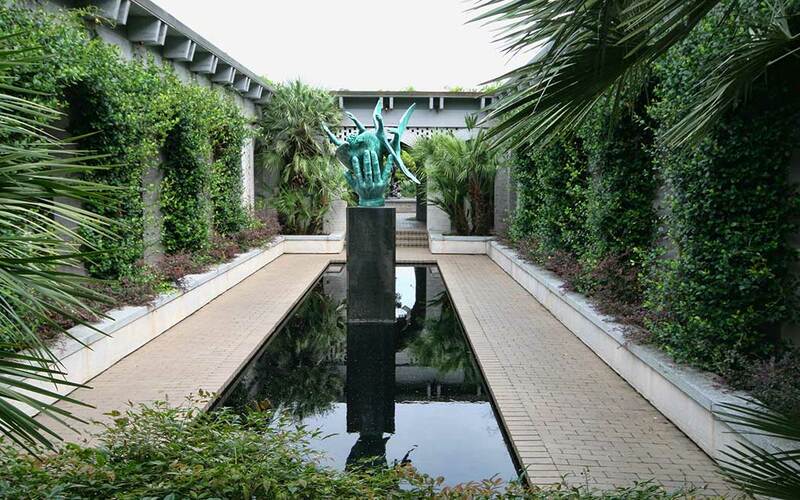 In 1936 this design won first place in a national competition. 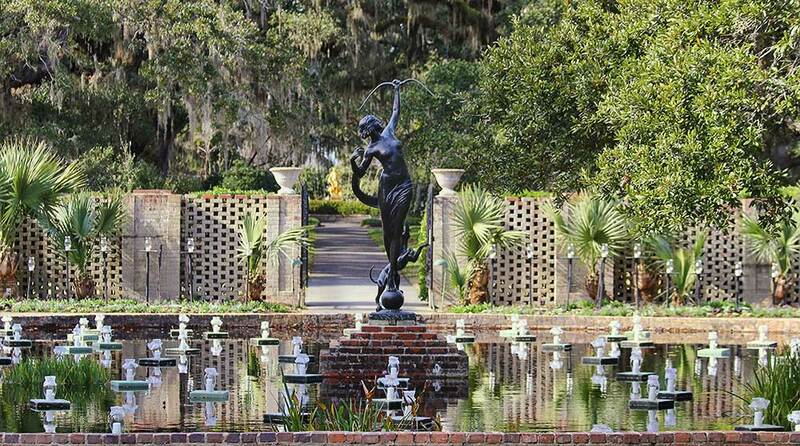 In 1972 it won the purchase prize in a competition sponsored by Brookgreen Gardens. 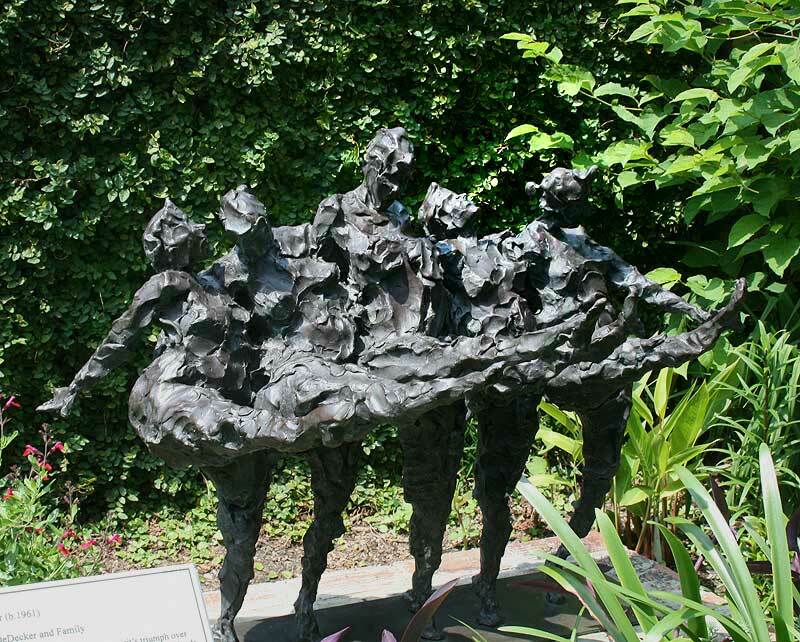 4 Cares for her Brothers by Veryl Goodnight (born 1947) Bronze, 1985, gift of Mr. and Mrs. Wynant J. Williams. 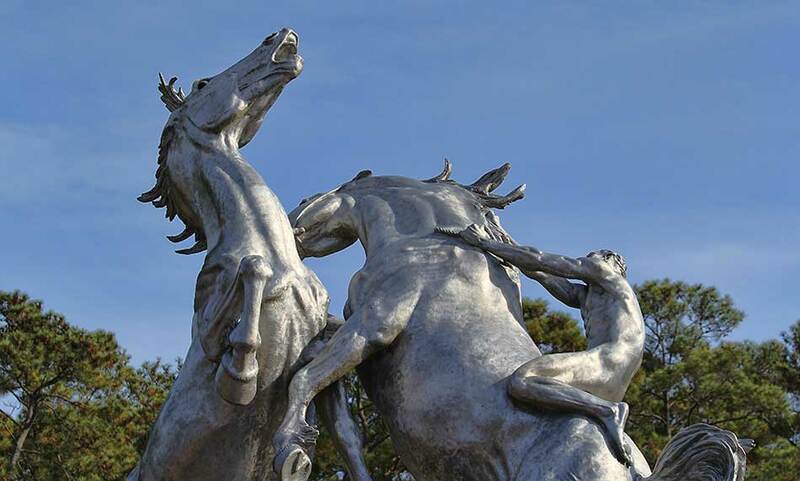 Colorado native Goodnight began her career as a painter but radial Cares for her Brothers" was the first of a series that explored the interrelationships of humans and animals. 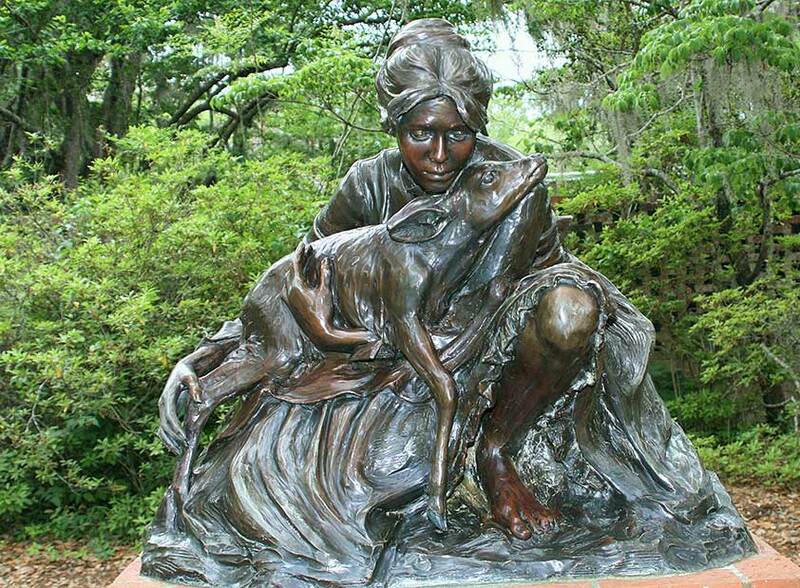 The pioneer woman gently holding a deer fawn depicts the Cheyenne story of Ewo-Wumishi-He-Me, the woman who cared to all living ceatures. 5. Tickled by Louise Peterson Sculptor. 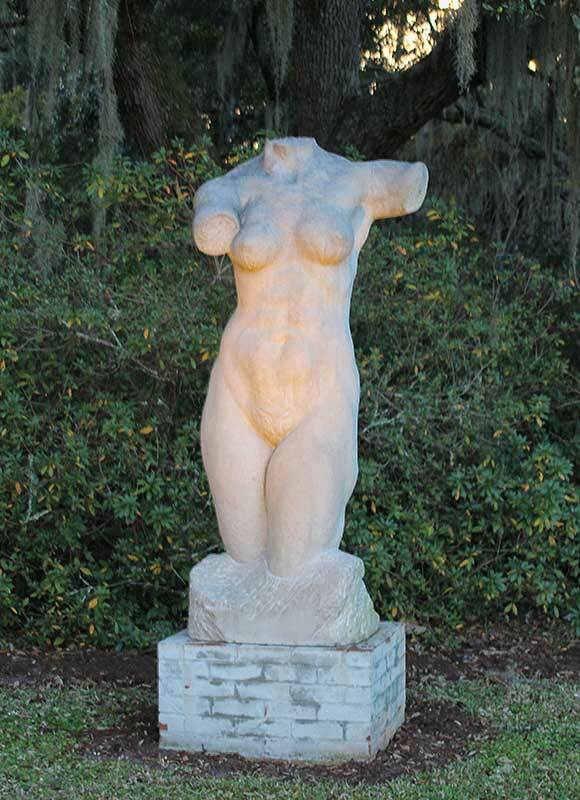 On loan to Brookgreen. 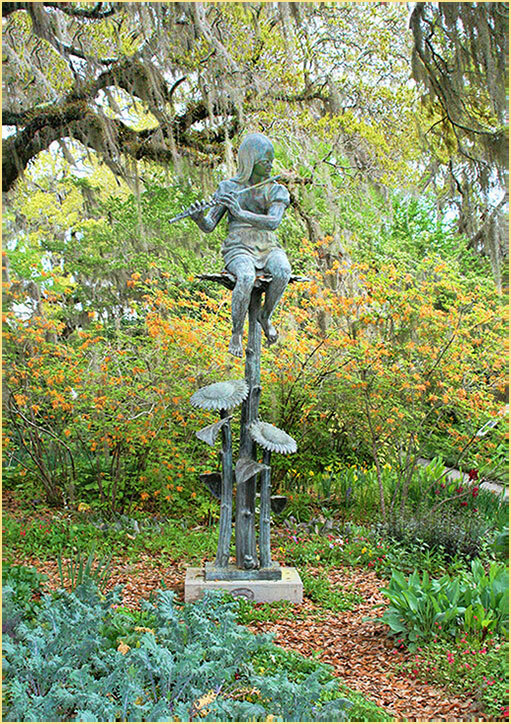 National Sculpture Society Brookgreen 2011 Annual Awards 6. 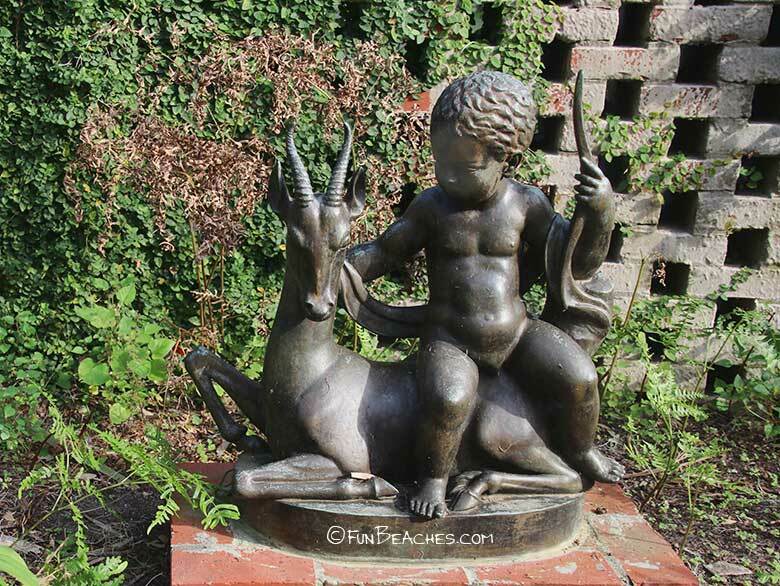 Laughing Boy and Goat byAttilio Piccirilli (1866 - 1945) Lead 1946. 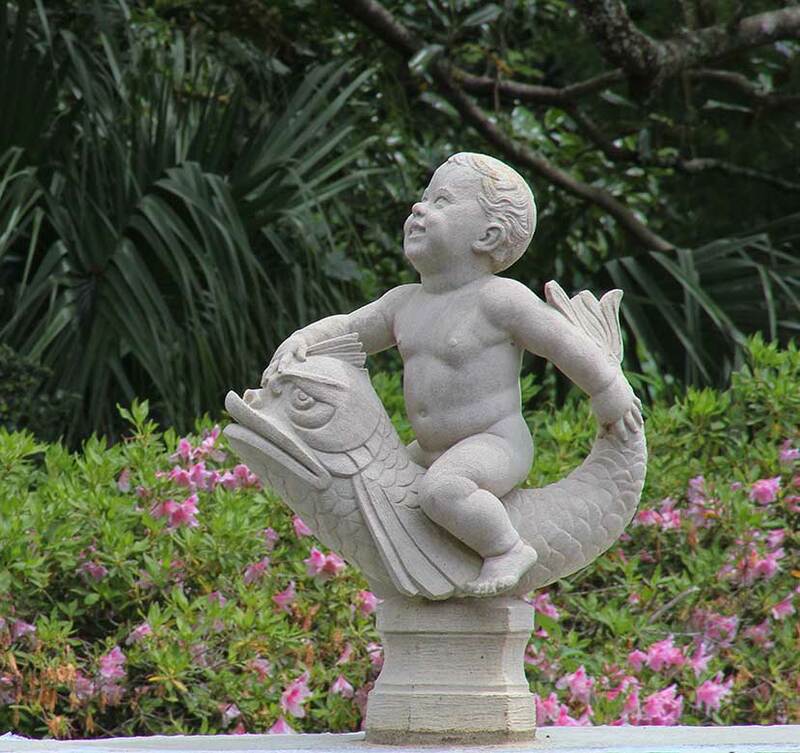 The eldest of 6 brothers, Piccirilli headed the family stone carving studio. 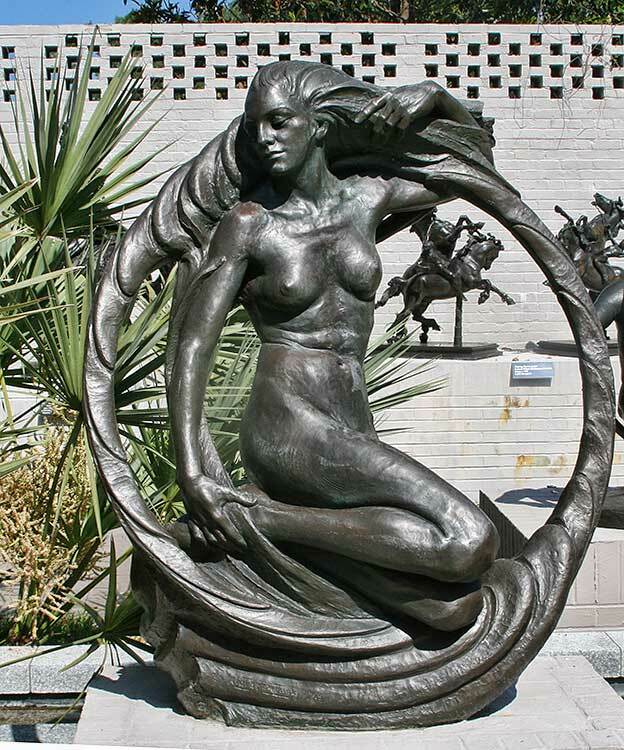 He was the sculptor of several important works including the Maine Monument and figures on the facade of the Brooklyn Museum.This little sculpture was designed in 1936 on a creative impulse of the sculptor. 7. 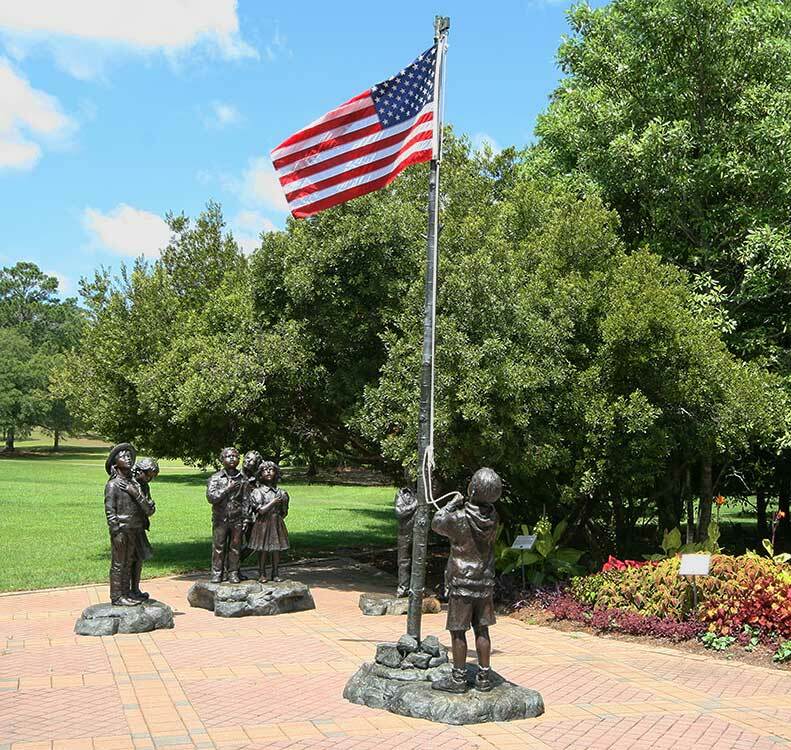 Pledge of Allegiance, by Glenna Goodacre who is best known for having designed the Sacagawea dollar that entered circulation in the United States in 2000. 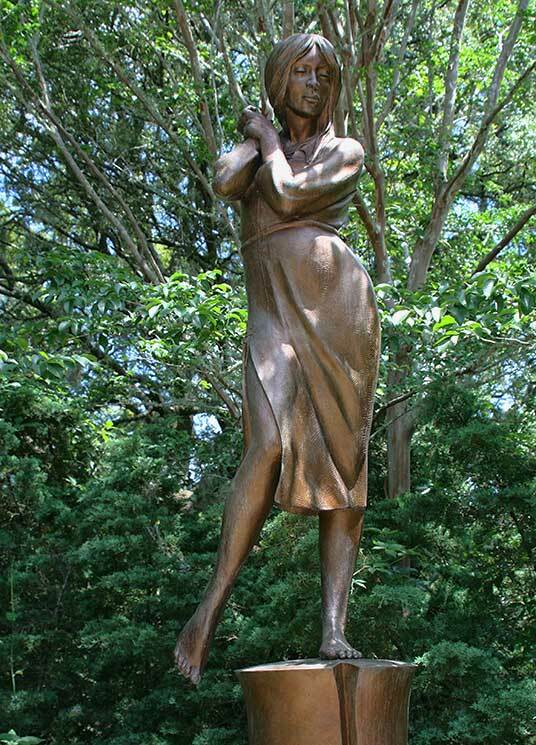 She also designed the Women's Memorial located in Washington D.C.
1. 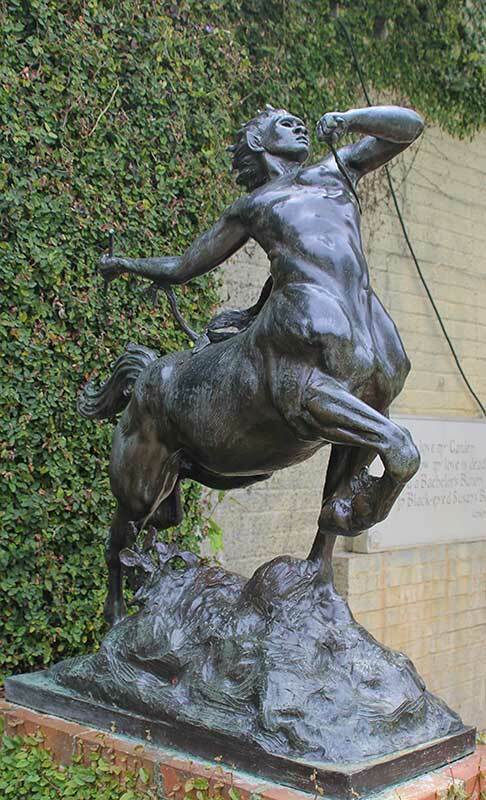 Disarmament by Daniel Chester French (1850-1931) Bronze, 1919. 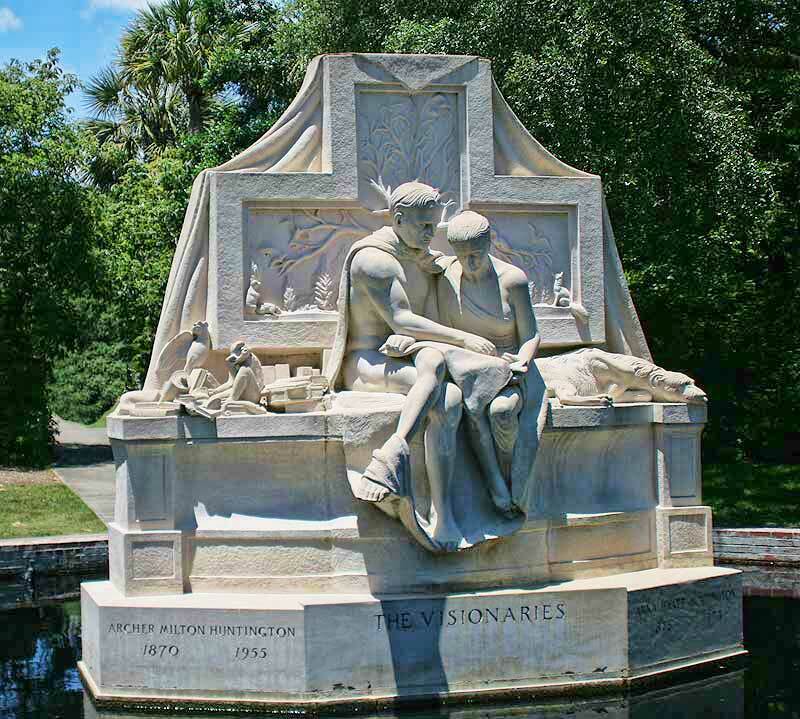 Known as the sculptor of "Seated Lincoln" in the Lincoln Memorial and "The Minuteman" in Concord, Massachusetts, French produced some of America's best loved monuments. 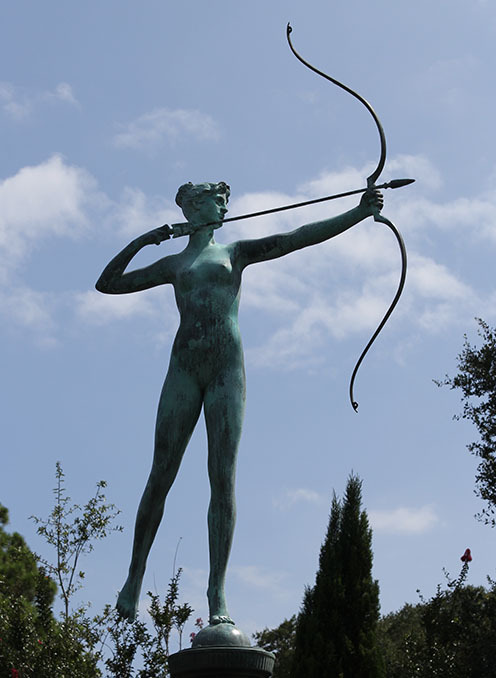 "Disarmament" was modeled for a temporary Victory Arch in NY City at the close of World War 1. The rugged warrior, with his massive sword and battle-worn appearance, smiles gently at an infant, who reaches up to him. 2. 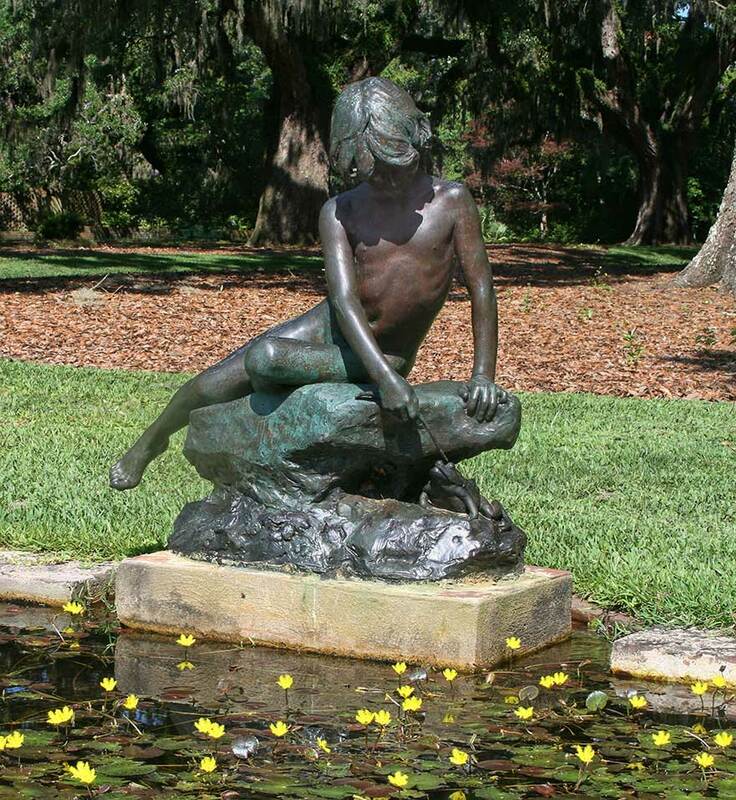 Boy and Frog, Elsie Ward Hering (1872-1923) Bronze. 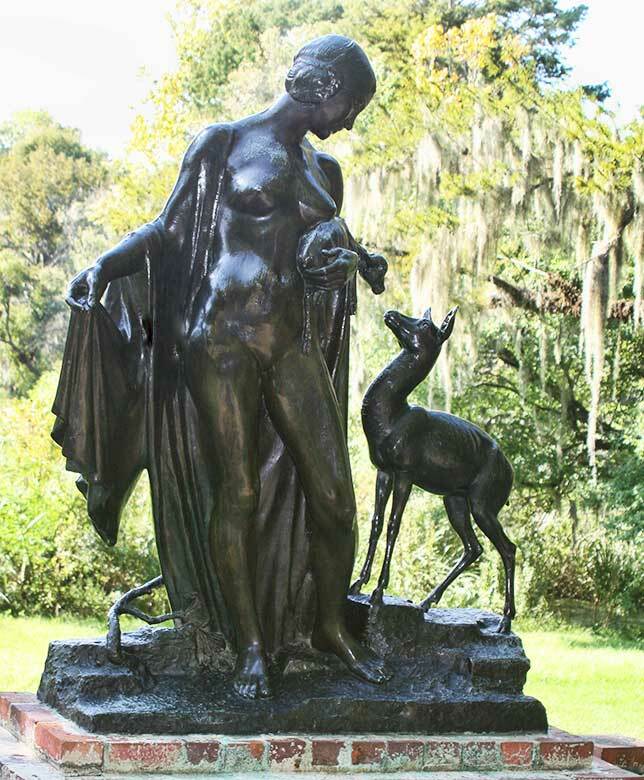 As an assisistant in the studio of Augustus Saint-Gaudens, Elsie Hering helped finish much of the sculptures done toward the end of his life. 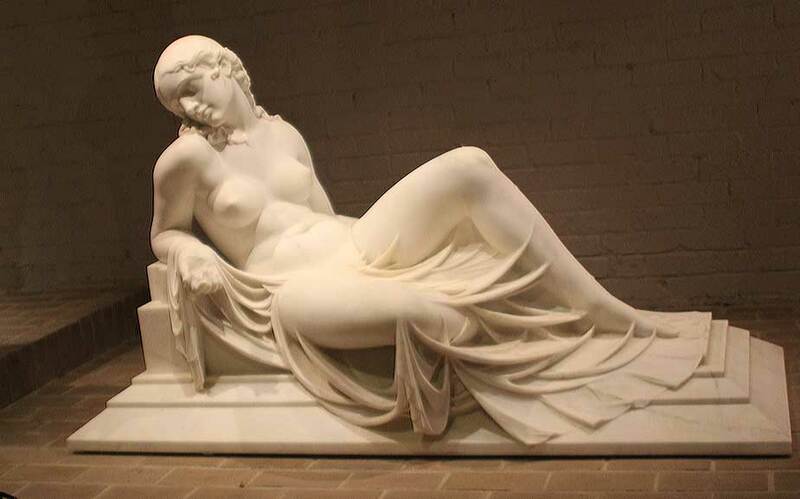 After his death in 1907, she completed a commission that was praised as an "astonishingly beautiful and poetic result filled with the spirit of his life." 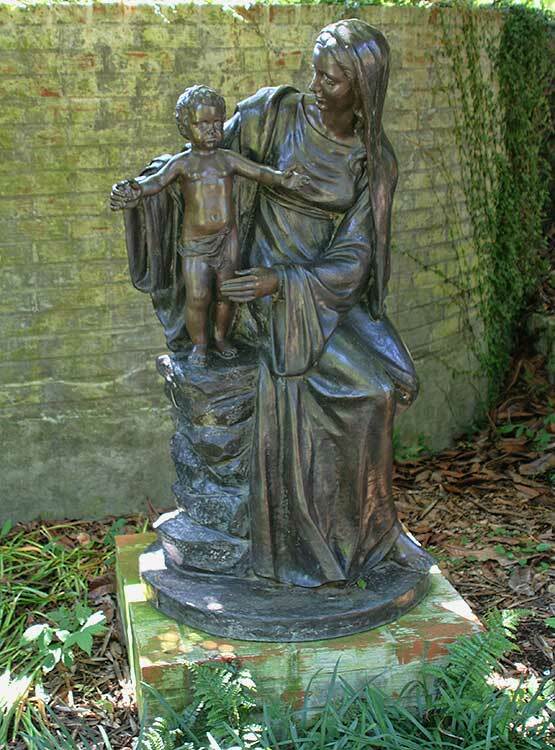 This example of her own delightful sculpture was awarded a bronze medal at the St. Louis Exposition in 1904. 3. Creation: She is the east where dawn brines the new day. She is spring when the land bursts into bloom. 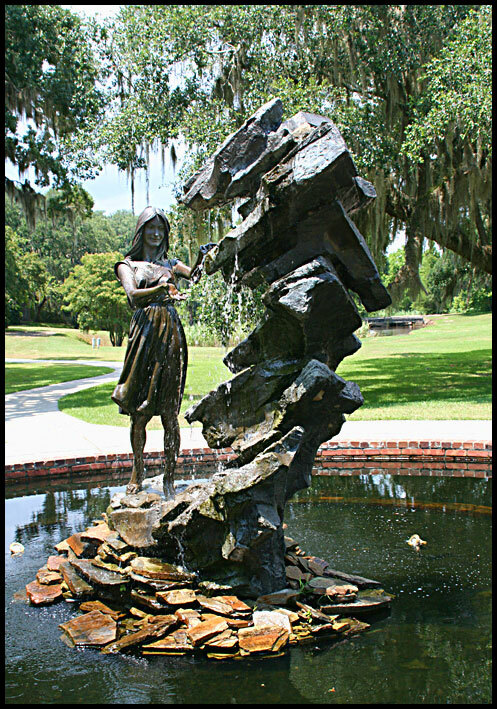 She is water, the cradle of life.. From Circle of Life by Harold "Tuck" Langland (born 1939) Bronze, 2001. Gift of Tuck and Janice Langland. 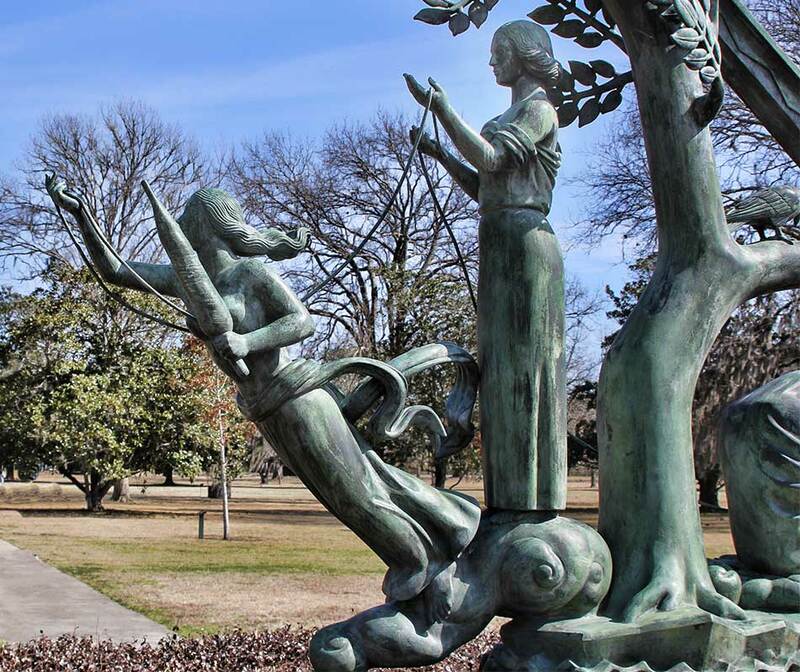 Using the metaphor of dance, this group of 4 figures (two shown above) represents the cycles of human life, four seasons, four elements, and four directions. 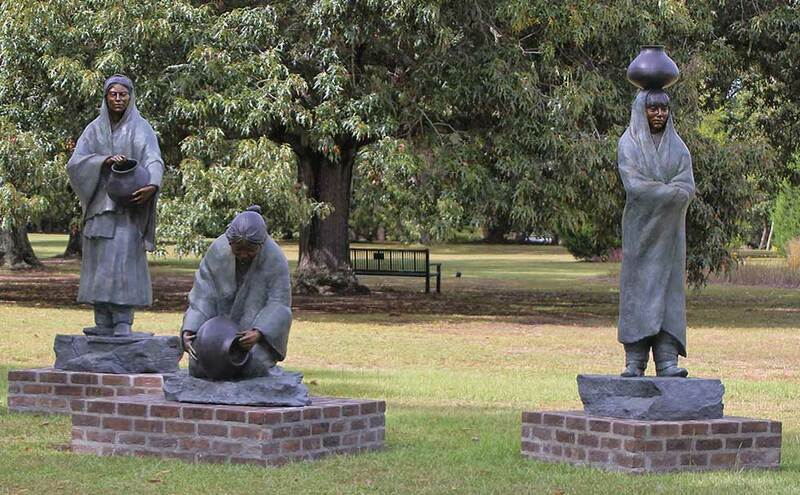 Each figure has an accompanying poem written by the sculptor. 4. Bring: He is the south with the sun high in the day. 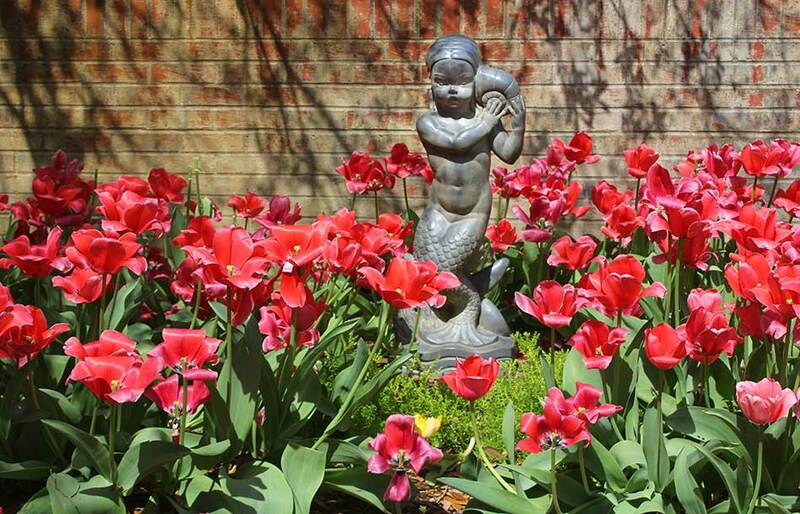 He is summer with growth abundant. He is air and brath of life. 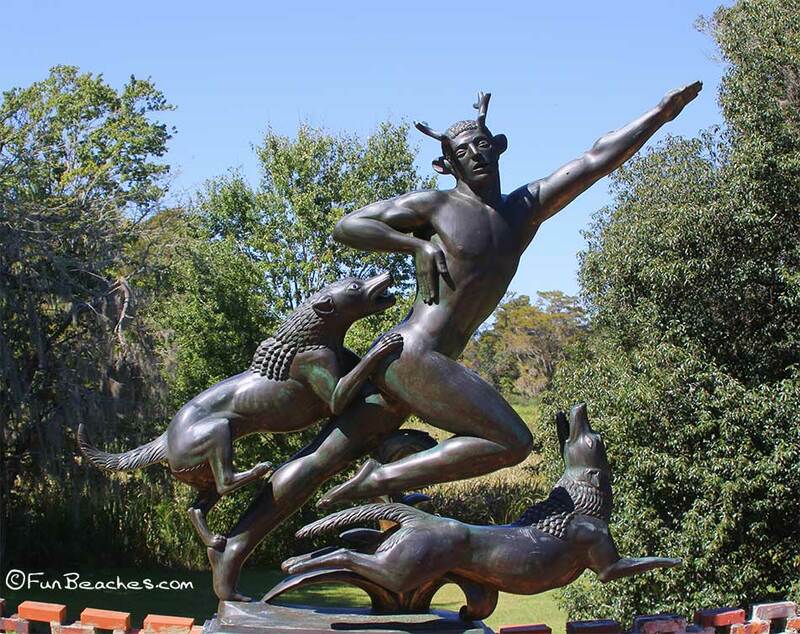 From Circle of Life by Harold "Tuck" Langland (born 1939) Bronze, 2001. Gift of Tuck and Janice Langland. 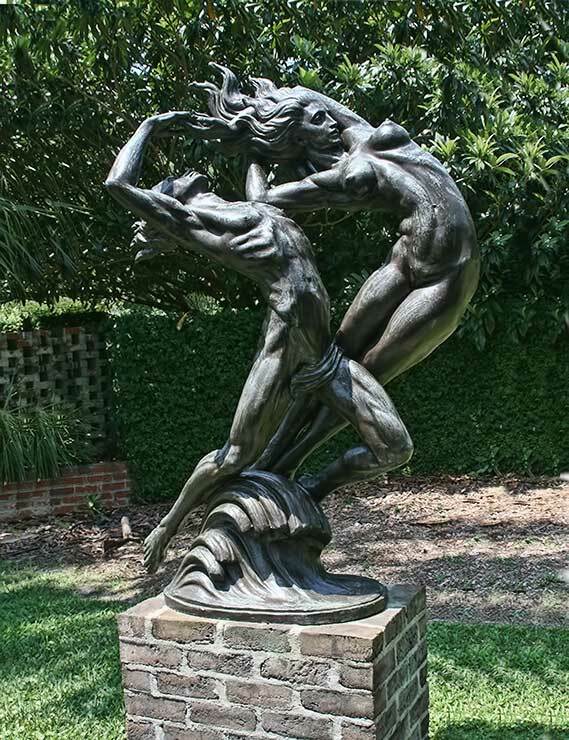 Using the metaphor of dance, this group of 4 figures represents the forms of human life, four seasons, four elements, and four directions. 5. Transformation: He is the West where the descends blazing. He is autumn when living things look to their rest. He is transforming fire. 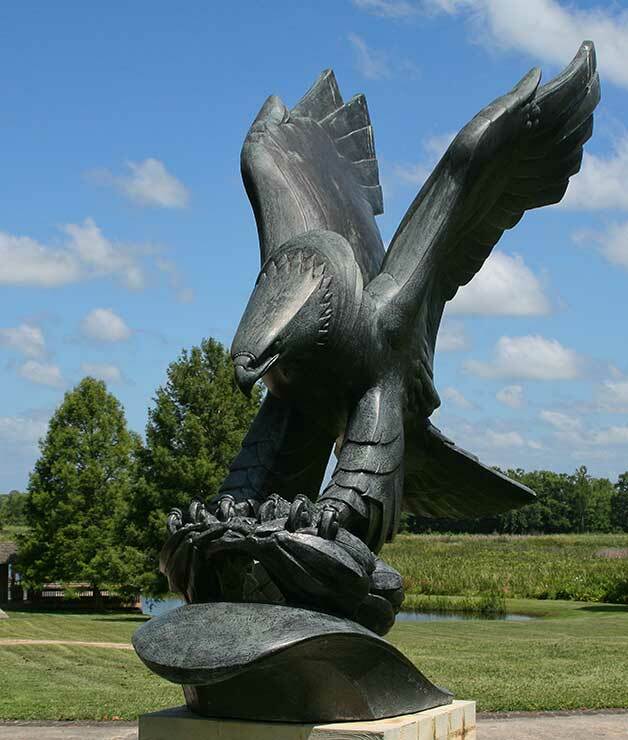 From Circle of Life by Harold "Tuck" Langland (born 1939) Bronze, 2001. Gift of Tuck and Janice Langland. 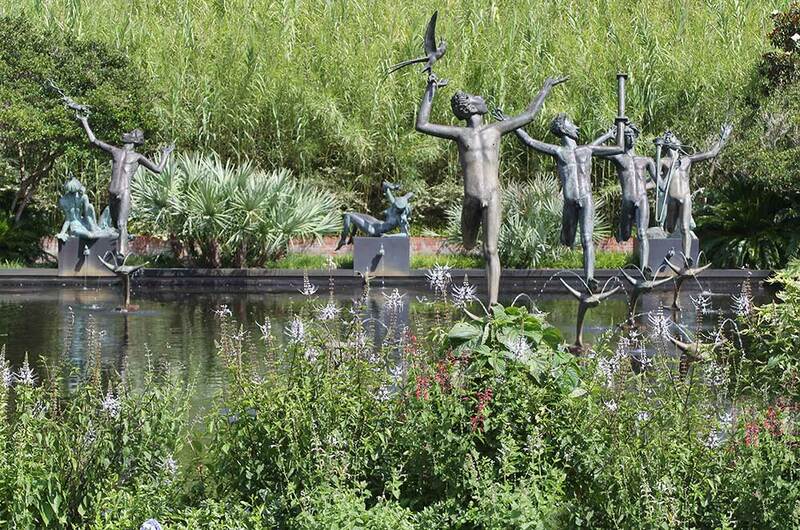 Using the metaphor of dance, this group of 4 figures (two shown above) represents the cycles of human life, four seasons, 4 elements and 4 diretions. 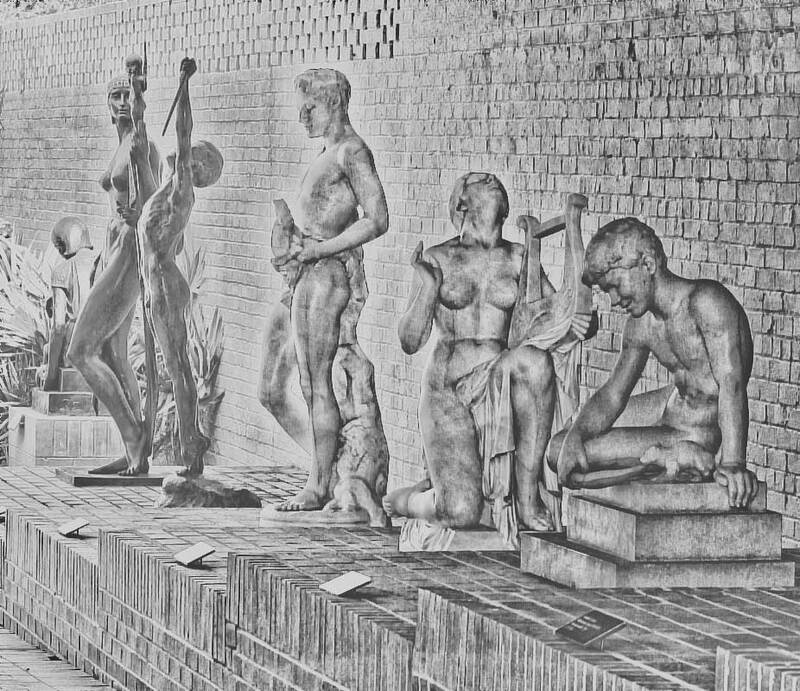 Each figure has an accompanying poem written by the sculptor. 6. Dormancy: She is north who waits in darkness. She is winter when all is still. She is earth listening for spring rain. 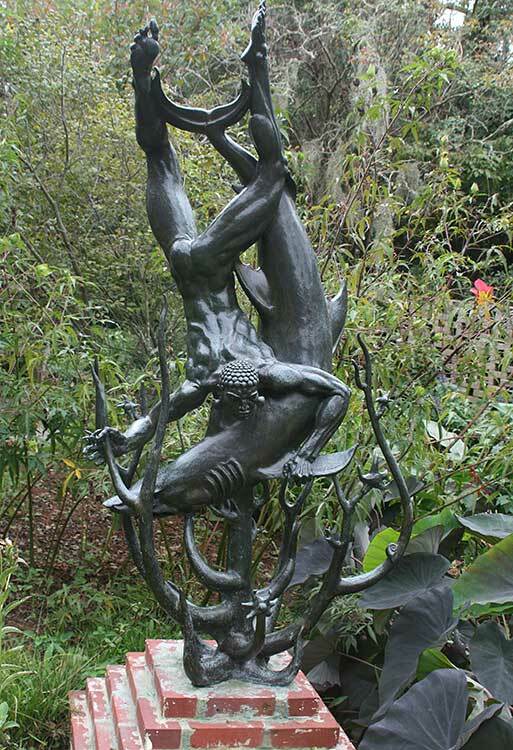 From Circle of Life by Harold "Tuck" Langland (born 1939) Bronze, 2001. Gift of Tuck and Janice Langland. 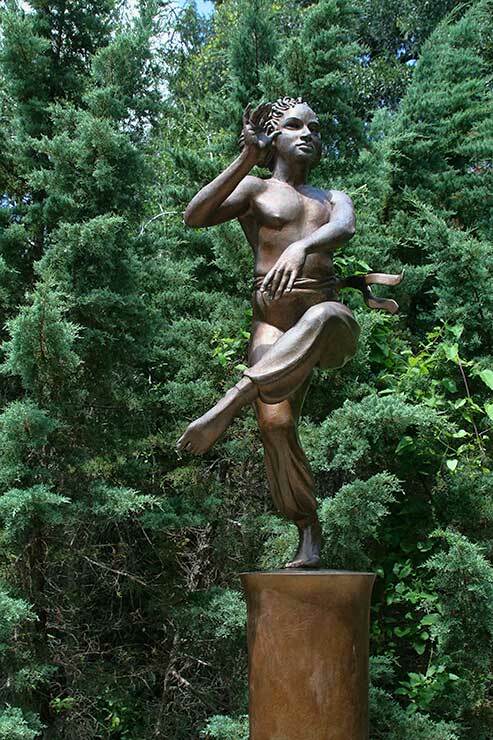 Using the metaphor of dance, this grop of 4 figures (two shown above) represents the cycles of human life, four seasons, four elements, and four directions. 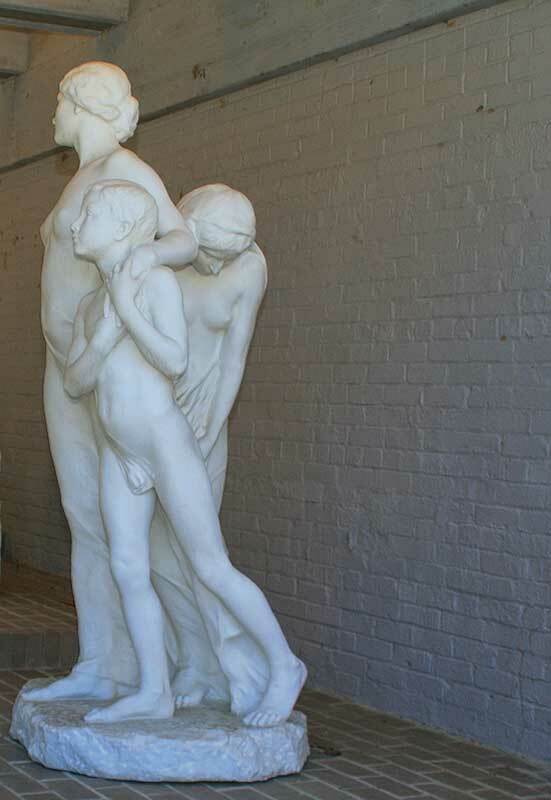 Each figure haas an accompanying poem written by the sculptor 7. 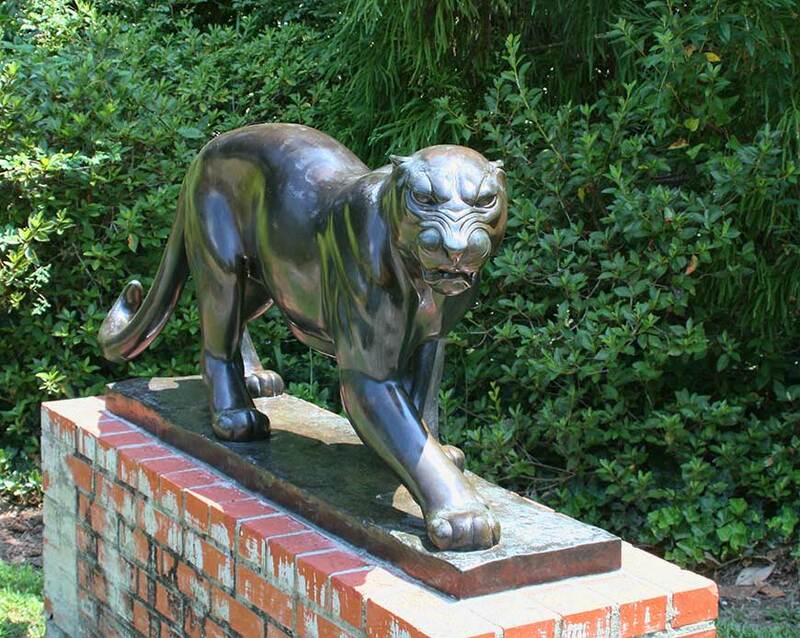 Jaguar by Anna Hyatt Huntington (1876 - 1973) Bronze, 1907. 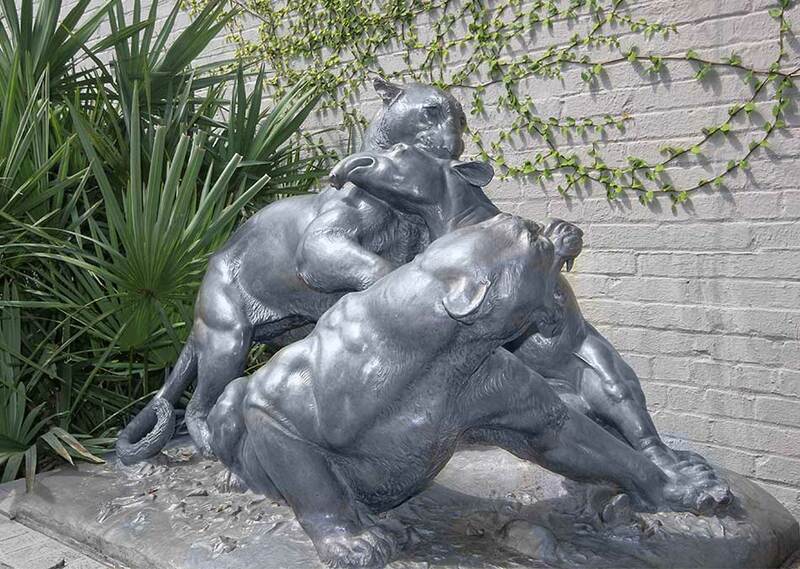 Among Huntington's early sculpture success was a series of jaguar studies done at the New York Zoological Society. 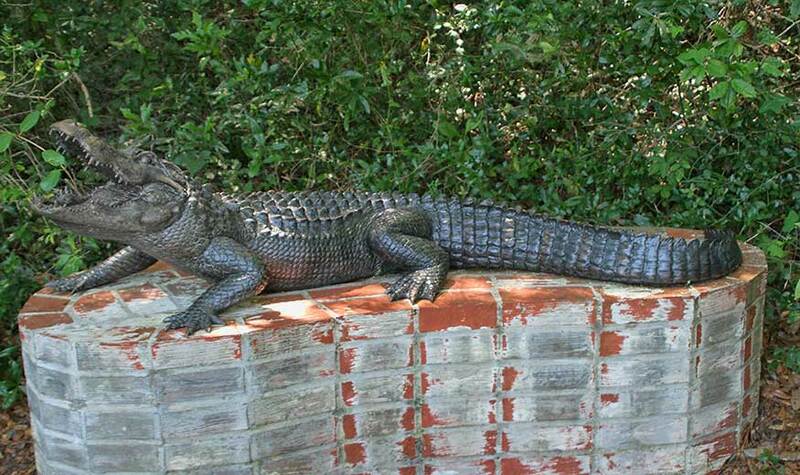 The model, "Senor Lopez" was a beautiful creature, legendary for his size and ferocity. Huntington worked from memory of a split second scene when the animal began to move from an upper level down to his food bowl. Click each photo to enlarge. 1. 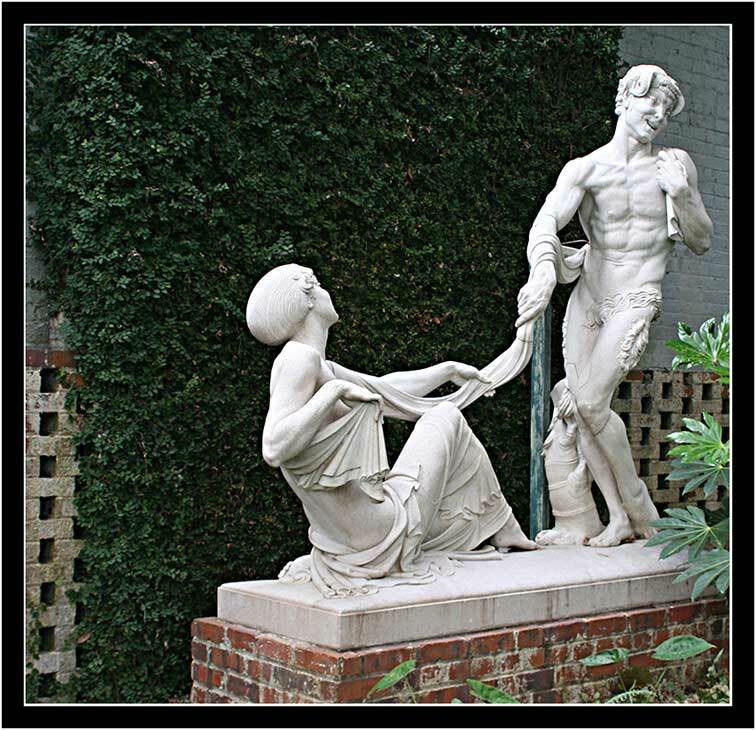 The Wounded Comrade by Carl Ethan Akeley (1864 - 1926) Bronze, 1913. 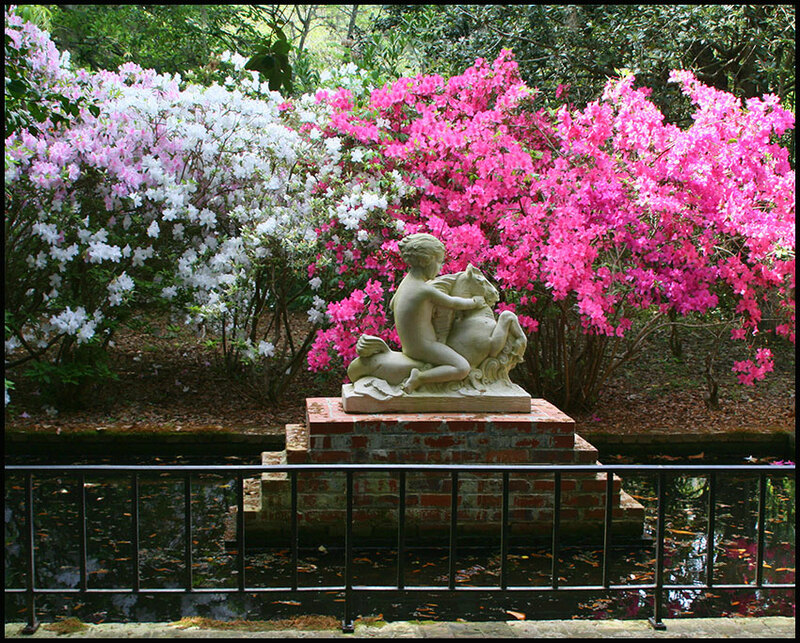 A gift of Robert V. Hatcher, Jr. 2. 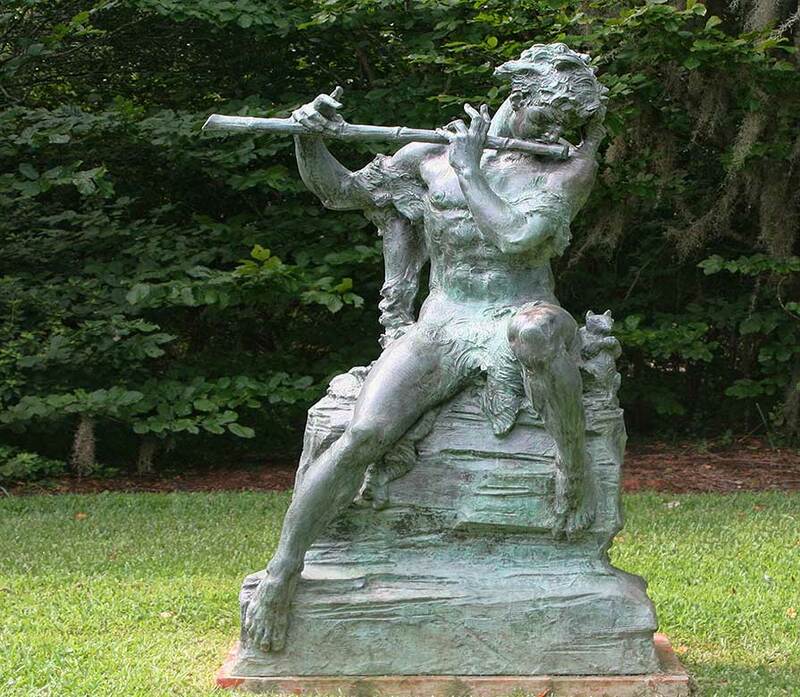 Faun by Leo Lentelli (1879 - 1961) Bronze, 1931. 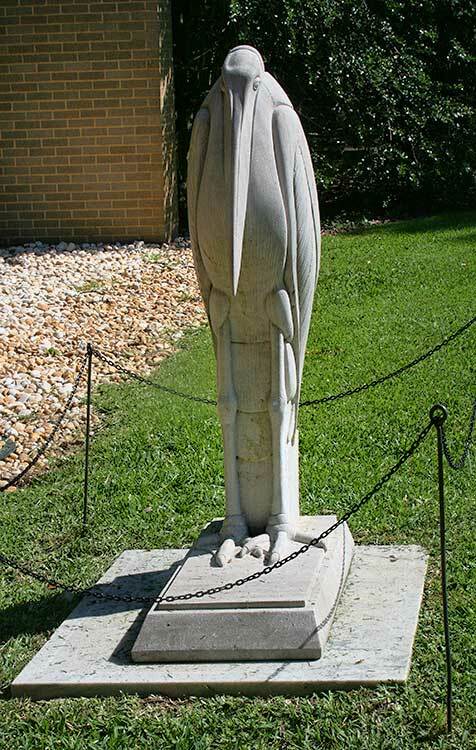 Coming to the United States from Rome as an experienced sculptor in 1903, Lentelli worked in the studios of Philip Martiny, Stirling Calder, and other American sculptors in New York. 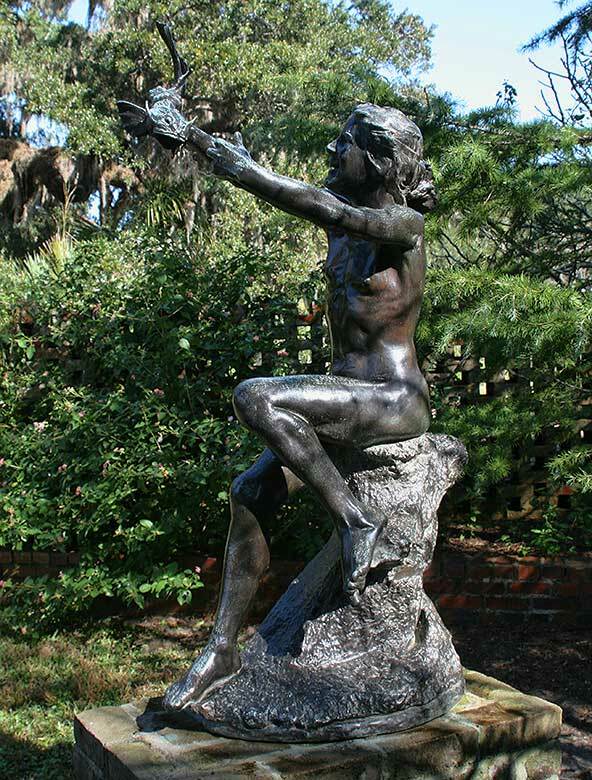 His impressionisticstyle, long limbed figures and ornamental flair was especially suited to architectural works and fountain figures. 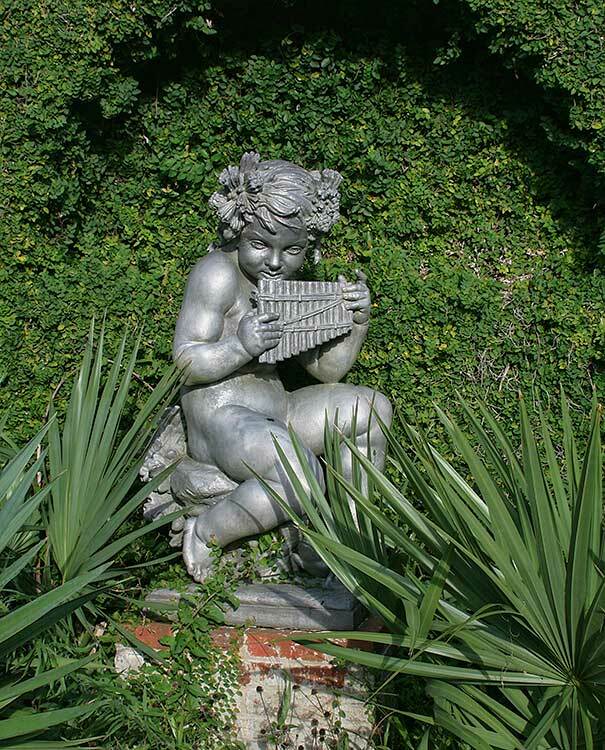 Faun was created for the Boca Raton Club in FL, and three examples were cast. 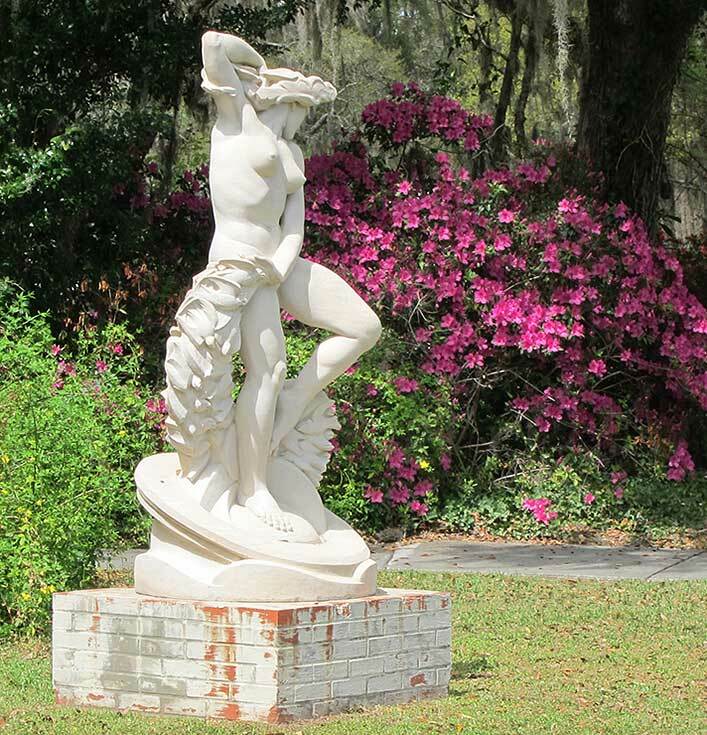 This one was acquired by Brookgreen in 1932. 3. and 4. 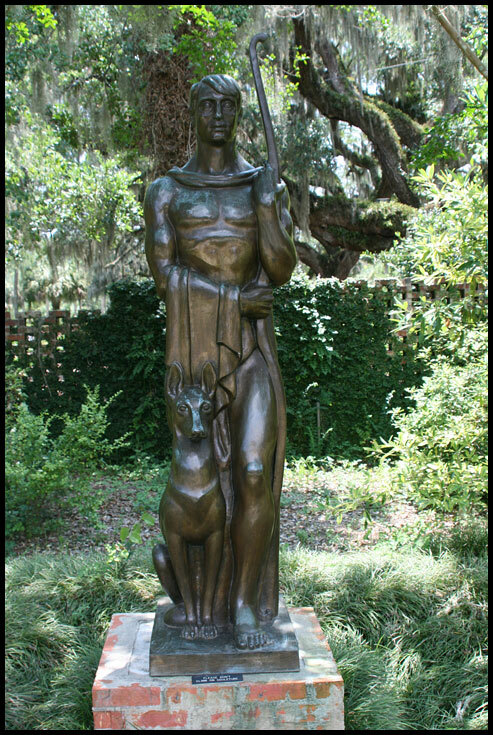 Forest Idyl by Albin Polasek (1879 - 1965) Bronze 1903. A period of study at the American Academy in Rome helped develop Polasek's sense of style and affinity for the human figure. 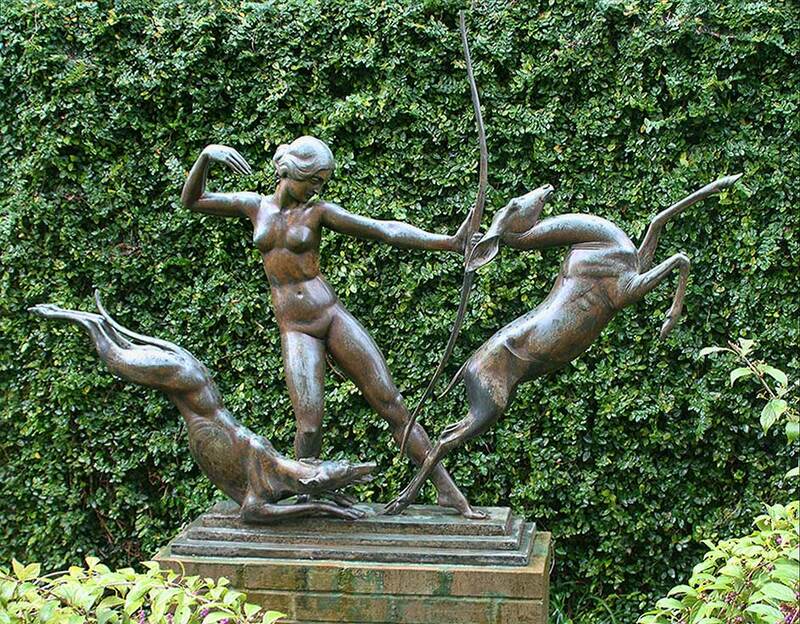 After his return toAmerica in 1913, he took a job as head of the sculpture department at the Art Institute in Chicago. 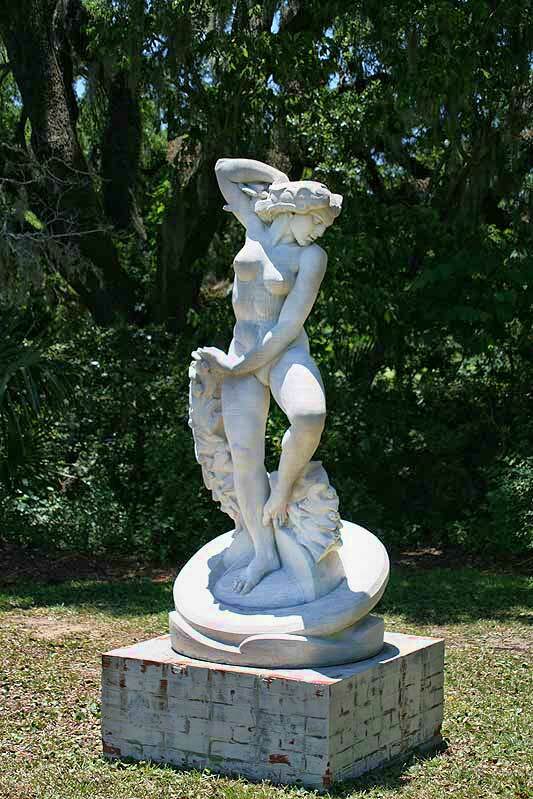 In 1930 he returned to the American Academy as a visiting professor where this sculpture was modeled. 5. 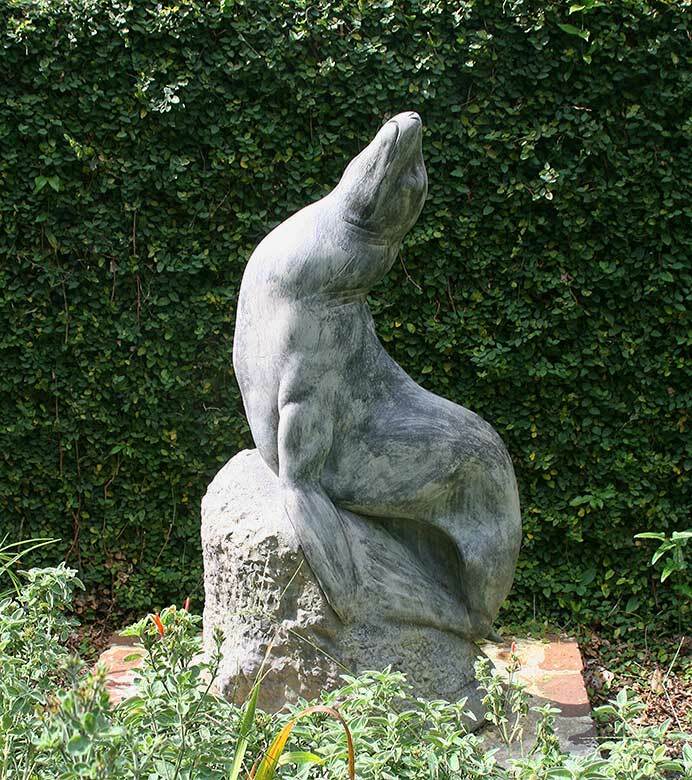 Seal by Furio Piccirilli (1868 - 1949) Black Marble. 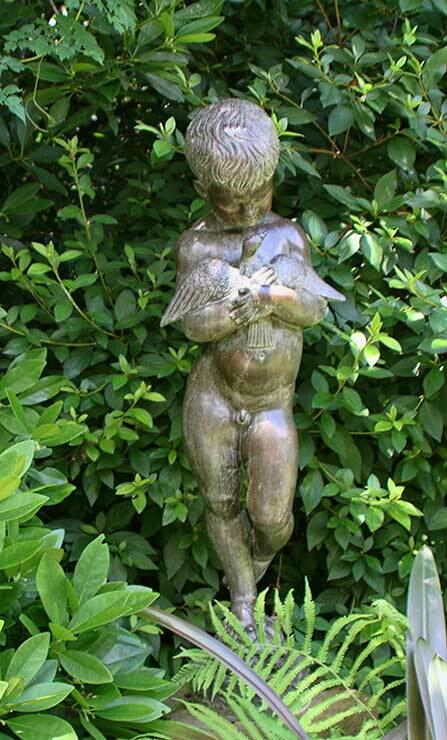 One of six beothers who worked in the old world tradition in the family stone carving business, Furio Piccirilli specialized in figure sculpture and was considered the most creative of them all. 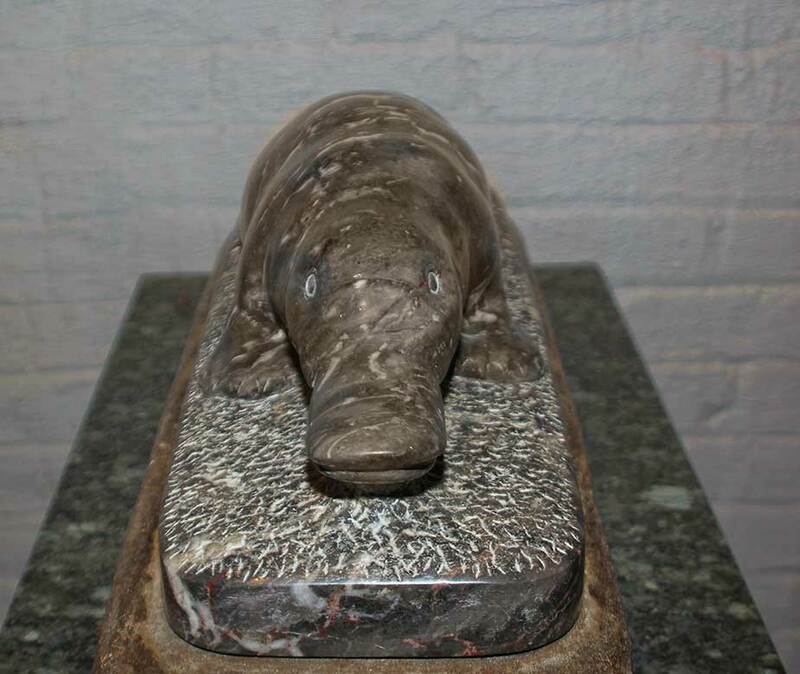 Seal was awarded the Speyer Prize in the National Academy of Design exhibition in 1929. 6. 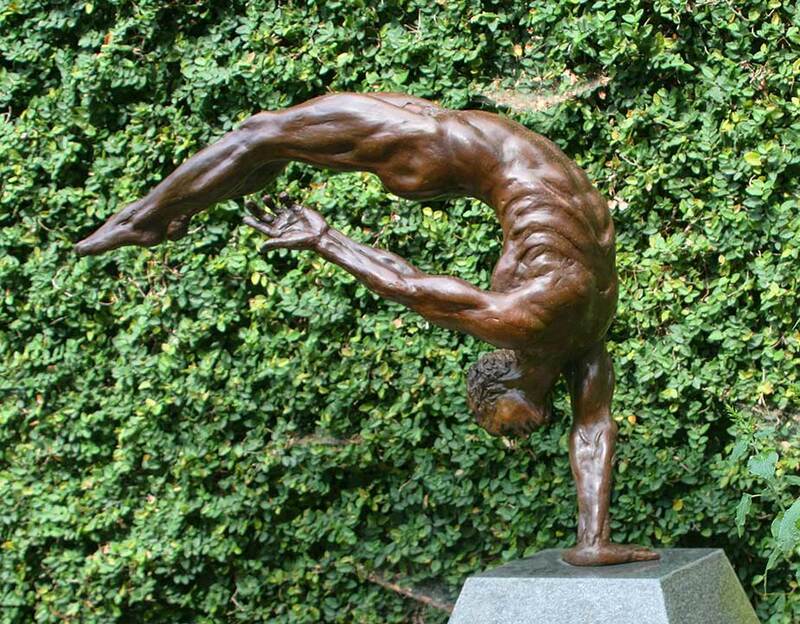 The Diver by Stephen H. Smith (born 1958) Bronze on granite base, 2007. 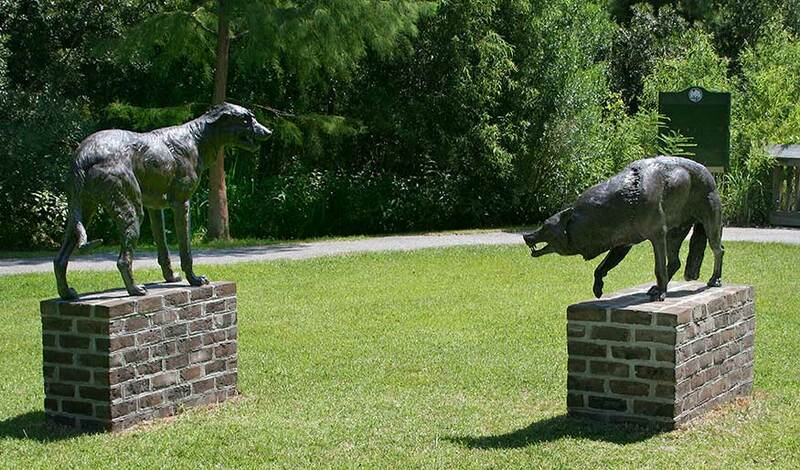 Stephen Smith earned his MFA in Sculpture from the University of North Carolina. 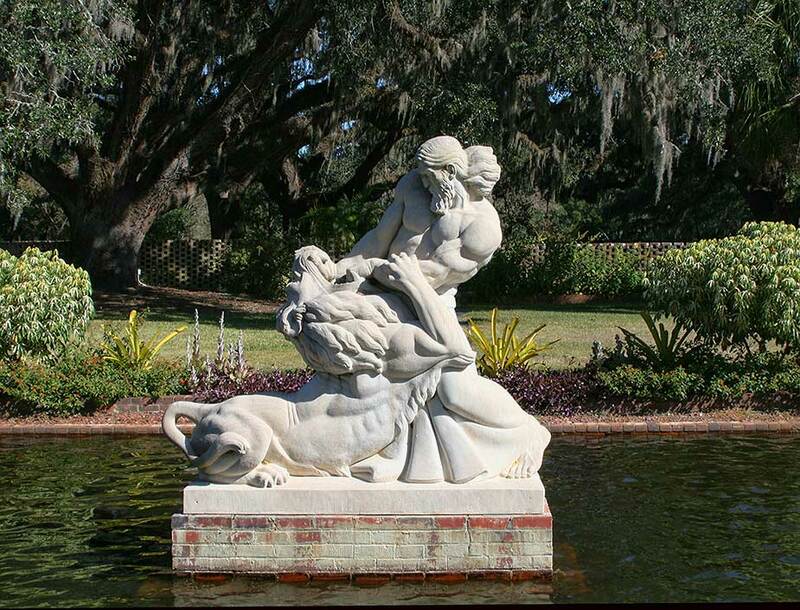 Compositionally, this sculpture illustrates the harmony and grace of the diver as he is about to leave the platform. 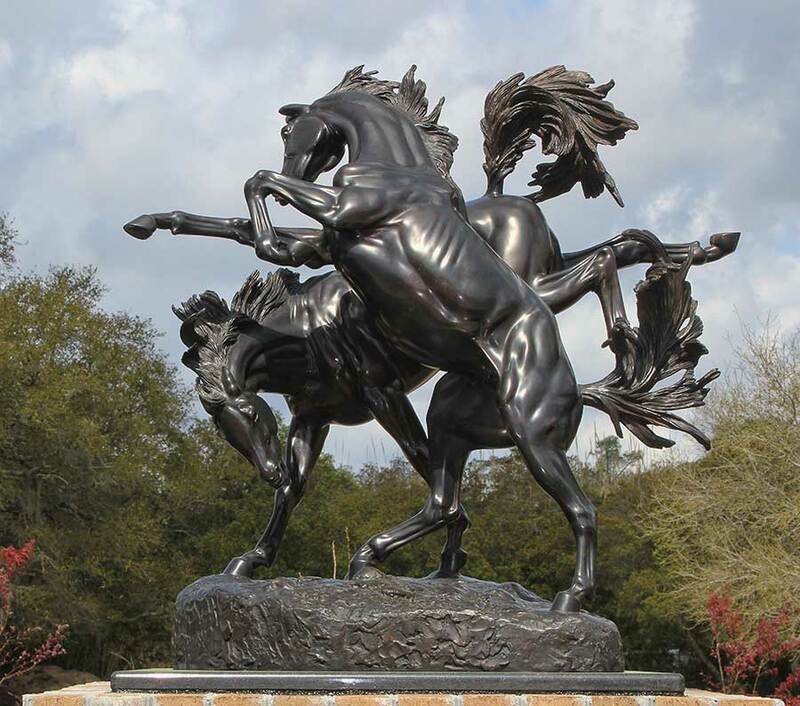 It was shown in the National Sculpture Society's 75th Annual Awards Exhibition where it won the "People's Choice Award" and was later donated to the collection. 1. 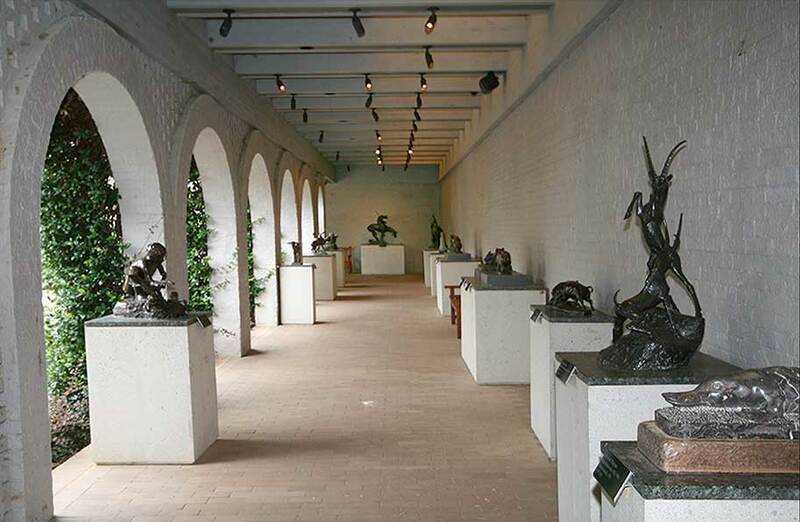 Brown Sculpture Court 2. 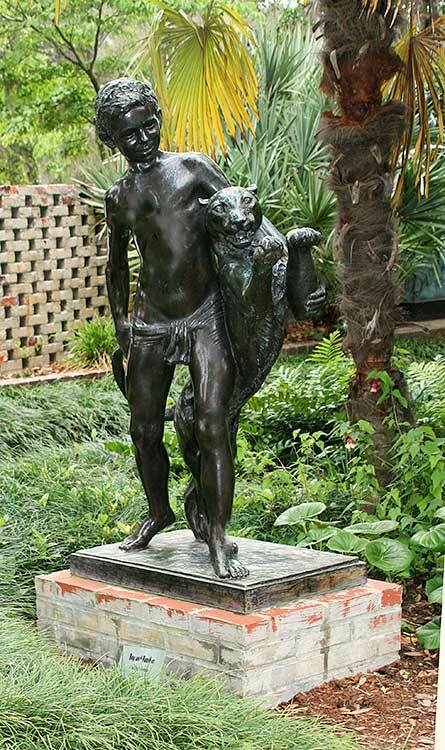 Boy and Panther, by Rudolph Evans 1878 - 1960) Bronze, 1819. 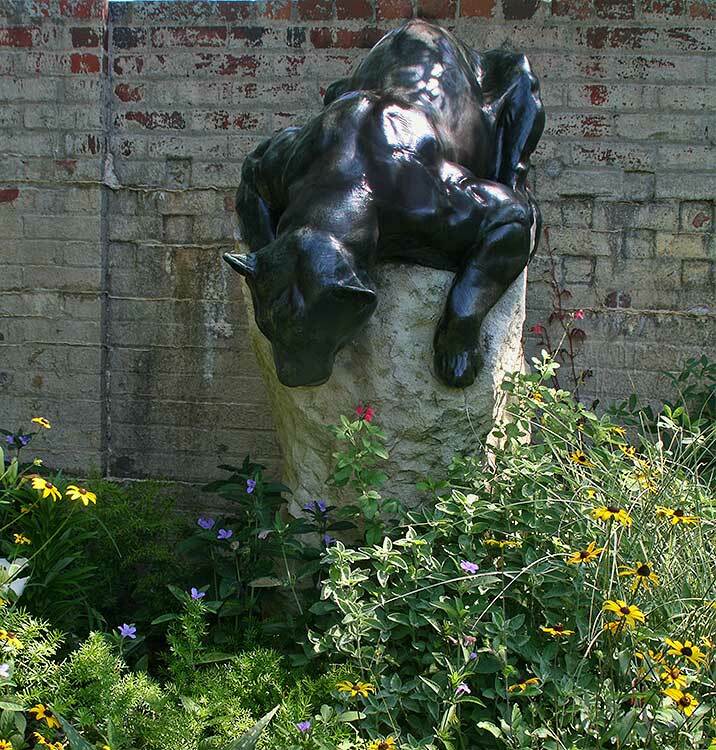 This sculpture is an interpretation of Rudyard Kipling's Mowgli from 'The Jungle Book'. 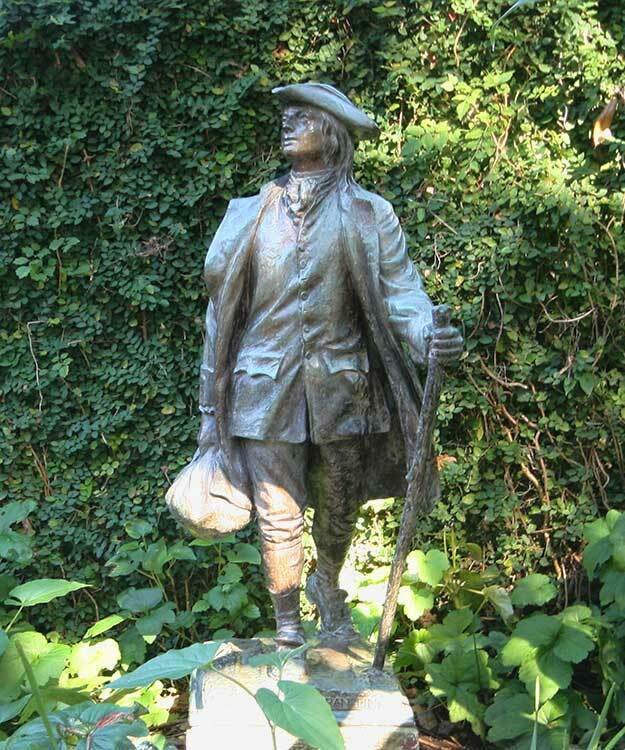 Evans was a versatile sculptor of architectural sculpture and public monuments such as the statue of Thomas Jefferson in the Jefferson Memorial Washington, DC 3. 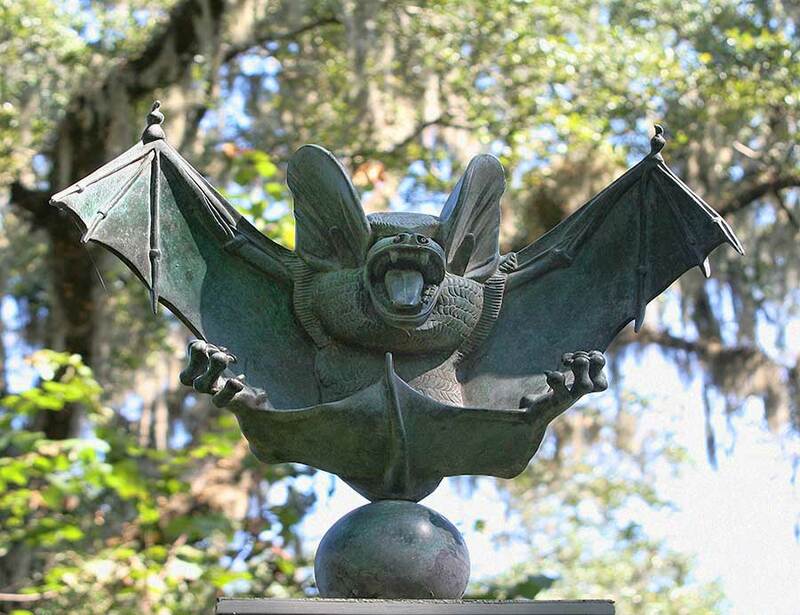 The Bat - by Lawrence Tenney Steven (1896 - 1972) Steven began modeling figures while he was still in junior high school in Massachusetts. He was accepted at the Boston Museum School and went on to win the Prix de Roma in 1922, to study for three years at the American Academy in Rome. 4. 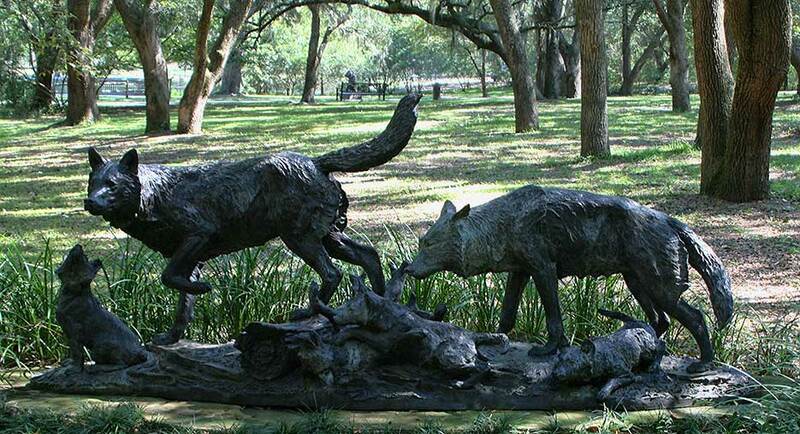 Timber Wolf Family by William Henry Turner (born 1935) Bronze 1990, gift of Dorothy R. Blair. 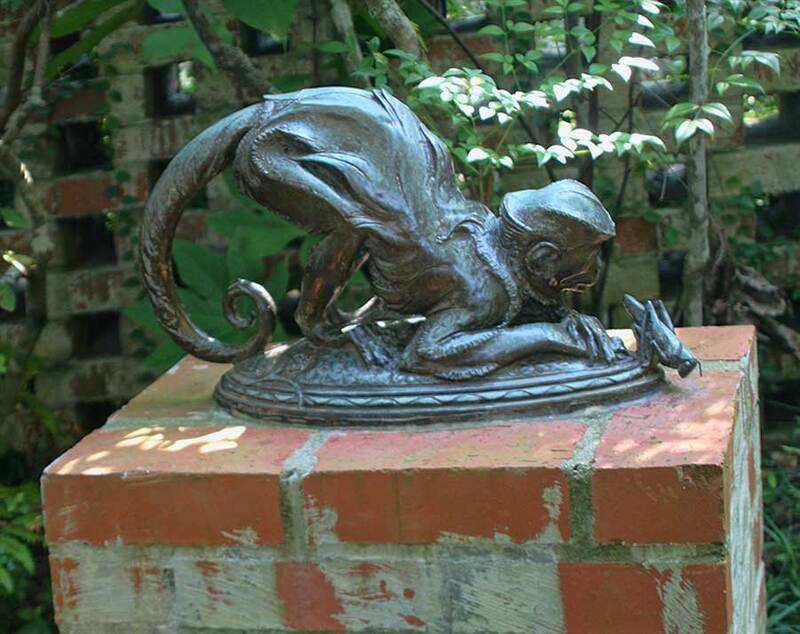 A self-taught artist, Turner experiments with modeling and casting techniques, and has built his own foundry. 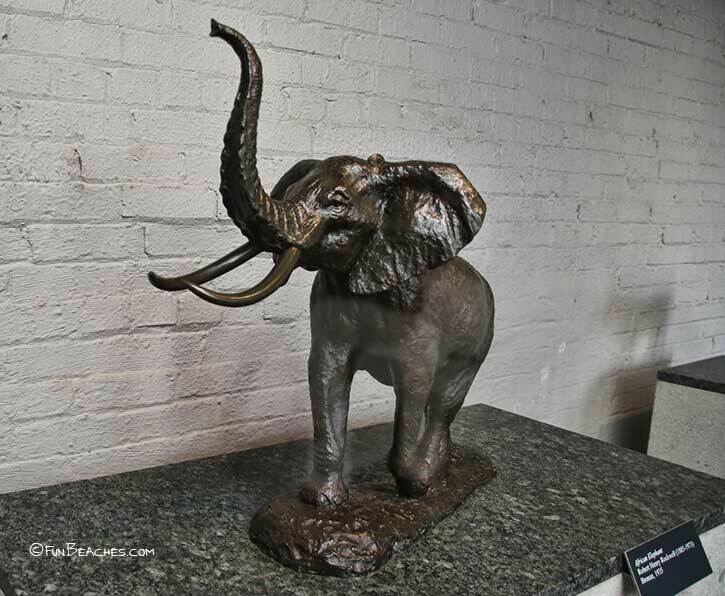 At a young age, he became interested in taxidermy and sculpture after Robert H. Rockwell, noted animal sculptor and curator of the American Museum of Natural History, retired near Tirner's home and eventually became his mentor. 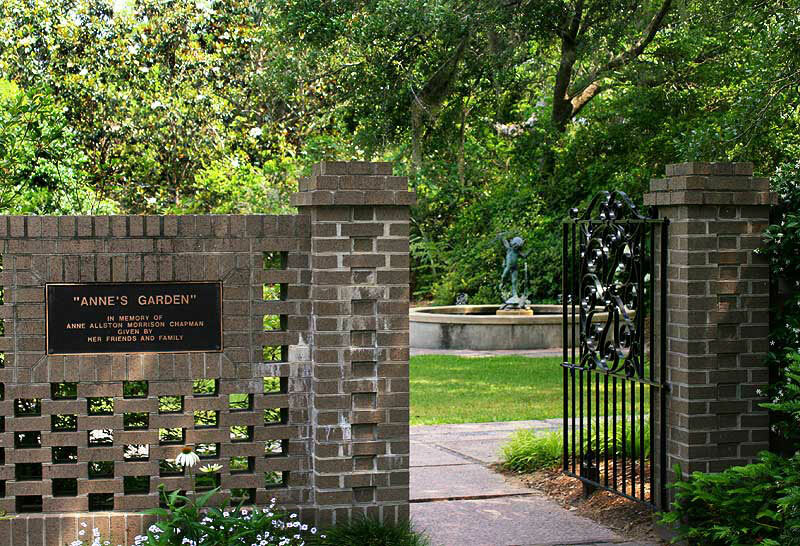 In 1989, Turner was commissioned by the museum to create thiswork as a memorial to Rockwell. 5. 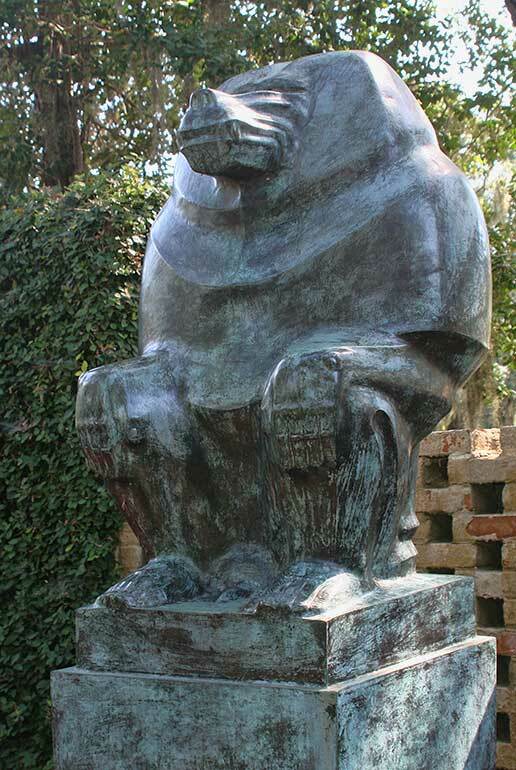 Baboon by Marshall Maynard Fredricks (1908 - 1998) Bronze, 1939. A male baboon sits in a crouching position, his hands on each knee and teeth bared. Click each photo to enlarge. 1. Chico by E. Bruce Moore (1905 - 1980) Bruce Moore attended the Pennsylvania Academy of Fine Arts from 1922 to 1926, studying with both Albert Laessle and Charles Grafly. 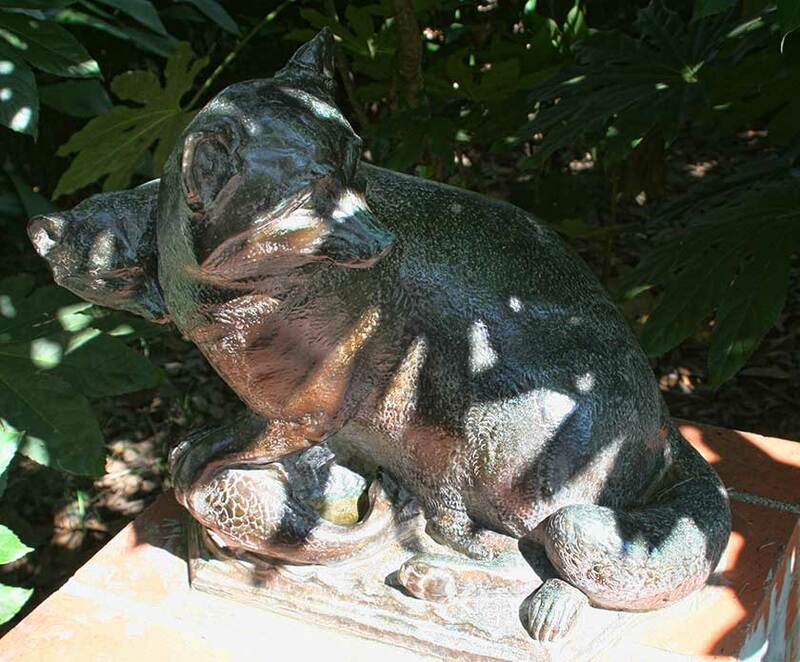 In this sculpture, a monkey crouches on it forelegs, and watches a grasshopper. 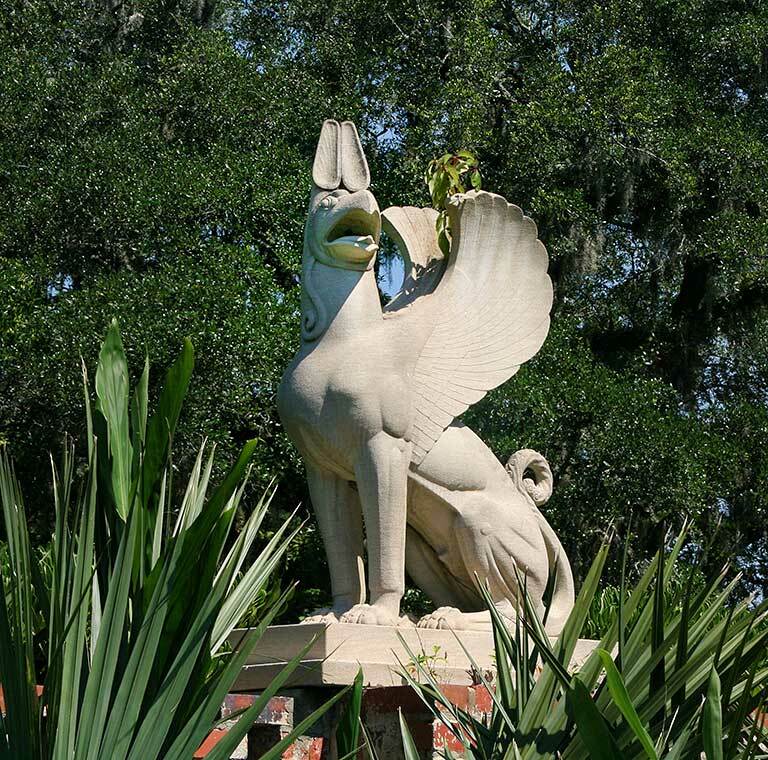 The sculpture was created in 1927. 2. 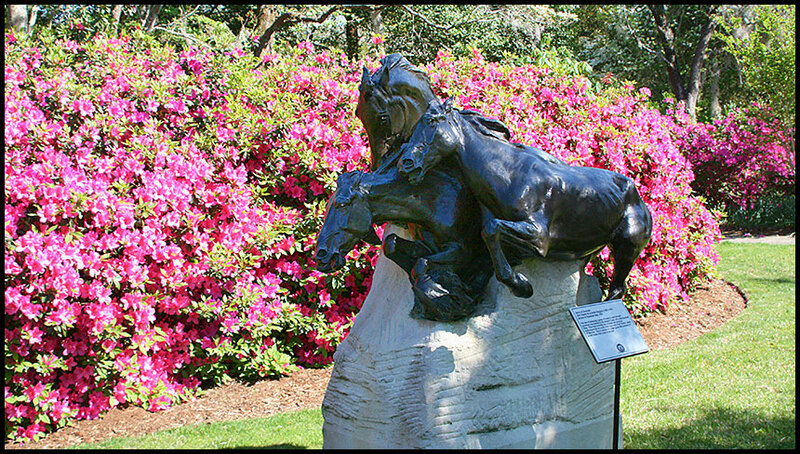 Eat more Beef by Sandy Scott (born 1943) Bronze. 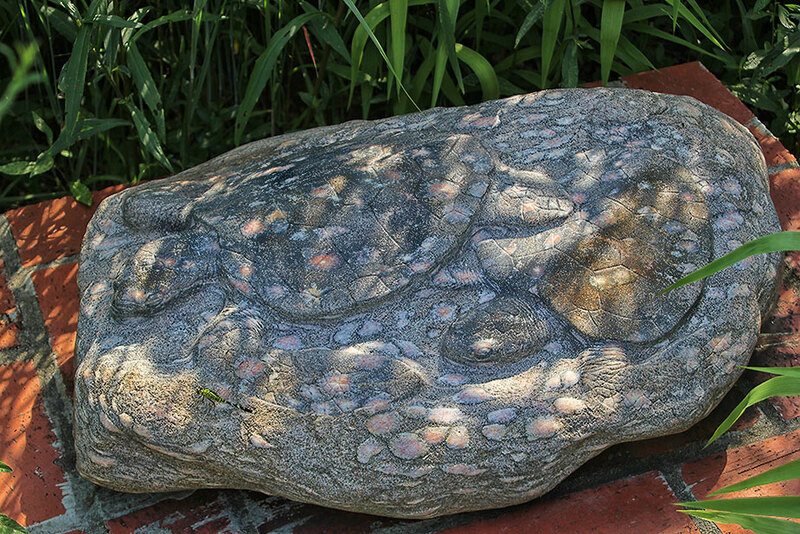 Gift of Trish Smith. 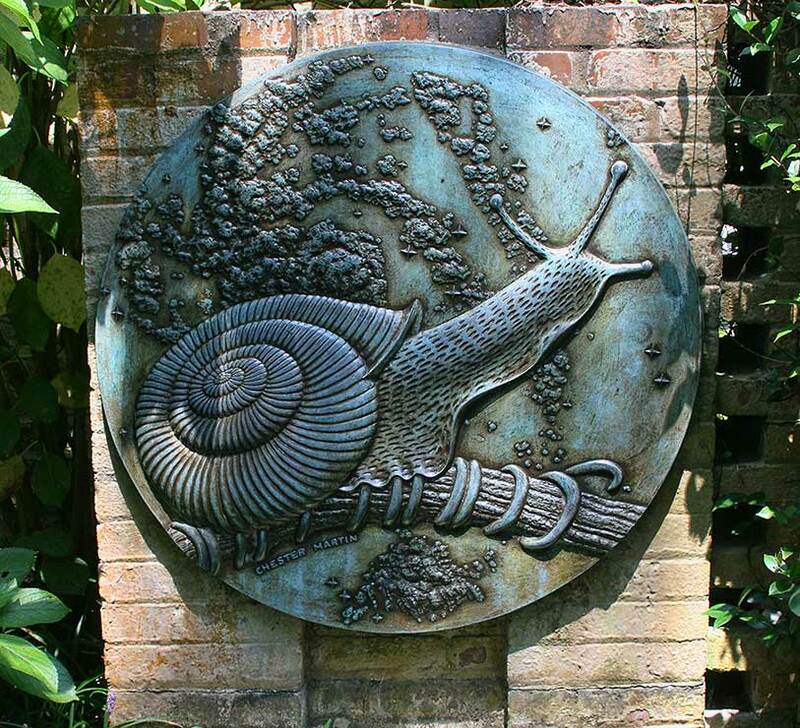 A graduate of the Kansas City Art Institute, Sandy Scott started her art career in the 1970's as an award-winning printmaker. 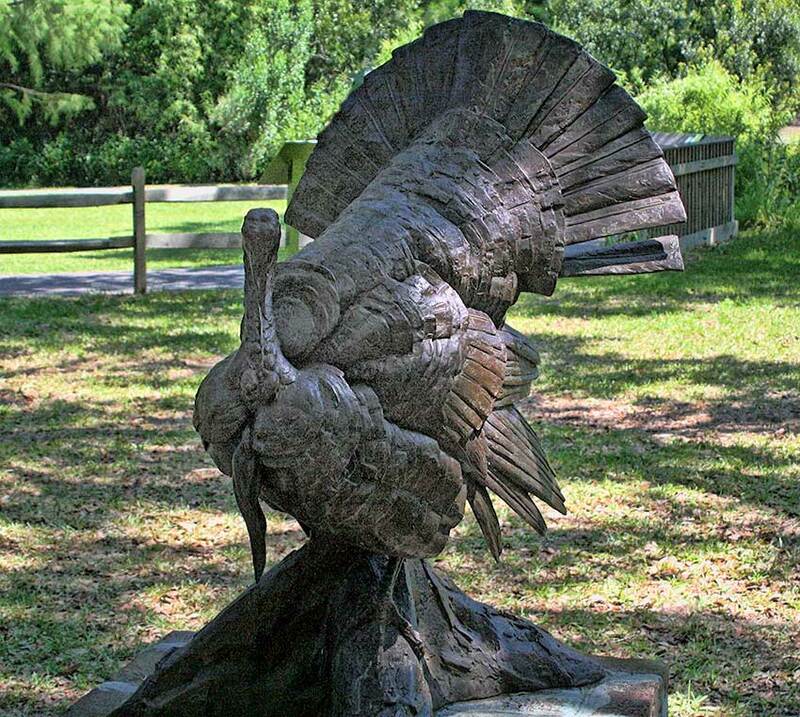 Today she is one of the country's leading animal sculptors. 3. 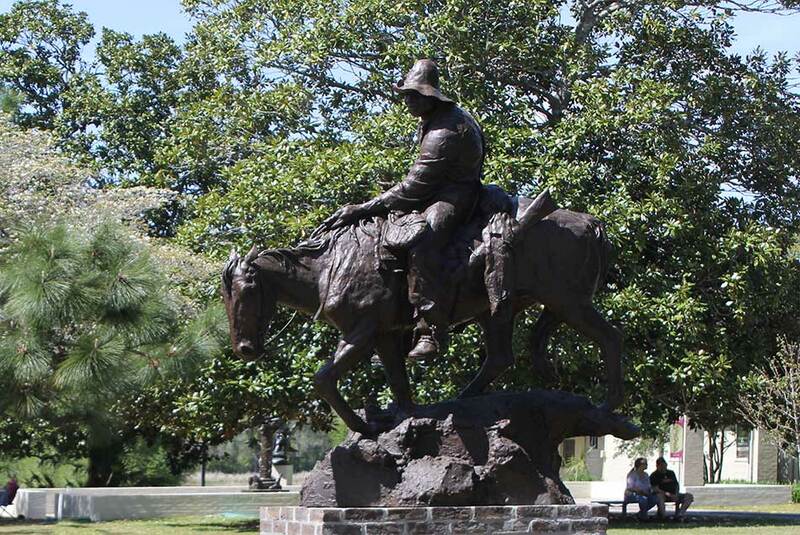 The End of the Trail by James Earle (1870 - 1953) Bronze 1950. S.1932.001 4. The Listeners by Hazel Brill Jackson(1894 - 1991) Bronze, 1962. Although Hazel Jackson was born in Philadelphia, her family went to Italy to live when she was a child. She returned to America at the outbreak of World War I, but after WW1 went back to Italy and worked in Rome until 1935. The Listeners resulted from observing a racoon raccoon family living in her icehouse for several years in Newburgh, New York. 5. 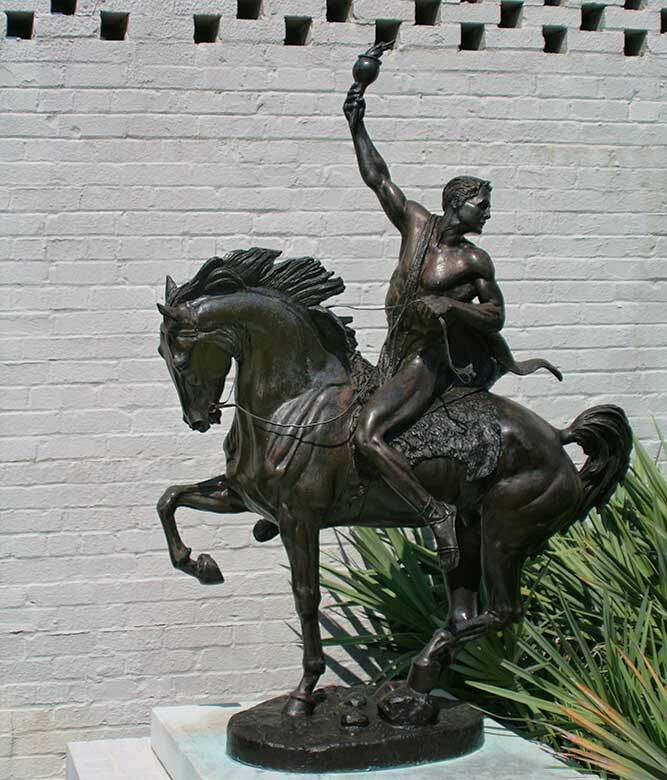 The Torchbearer, 1953, by Anna Hyatt Huntington (1876 - 1973) Bronze, 2959, S.1994.003. permanent loan from the Hispanic Society of America Click each photo to enlarge. 1. 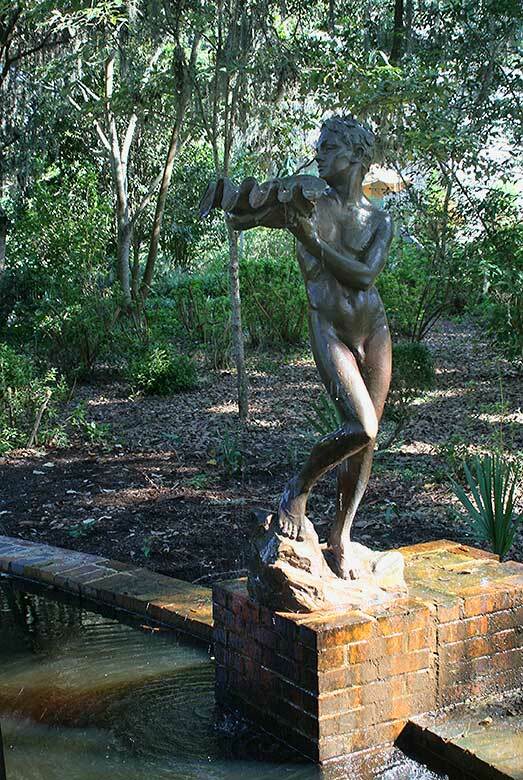 Girl With Fish by Harriet Hyatt Mayor (1868 - 1960) Bronze. 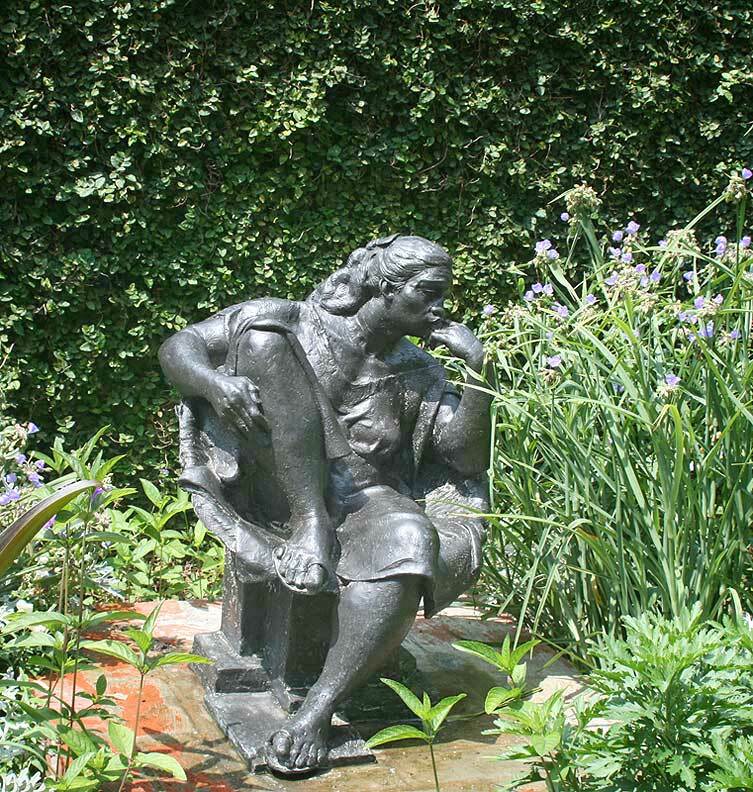 Remembering stories of Rudyard Kipling's 'The Jungle Book' Harriott Mayor was inspired to create this female version of the impish prankster, Mowgli. 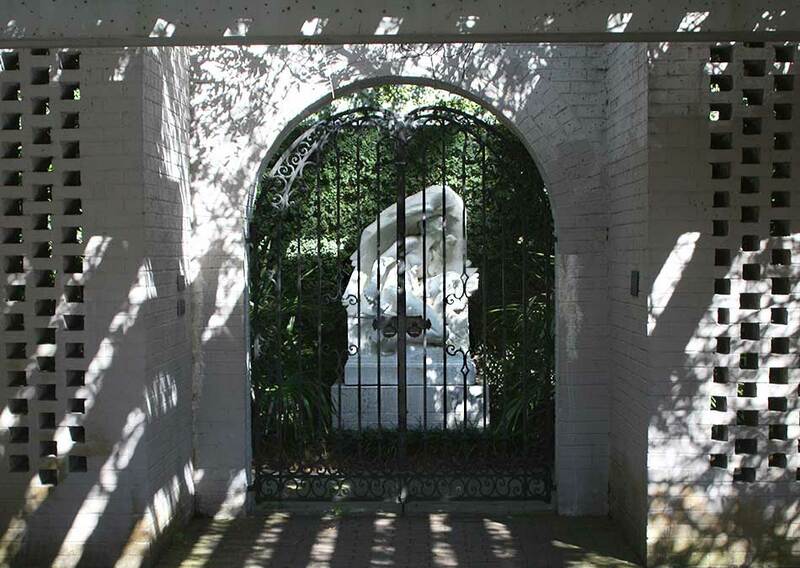 The sister of Ann Hyatt Huntington, Mayor was the first sculptor in the family. 2. 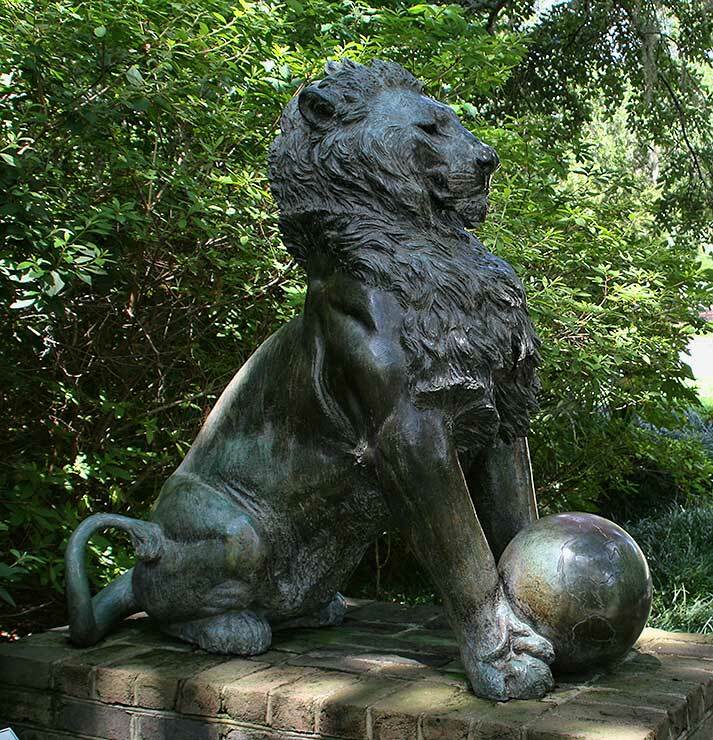 Samson and the Lion by Gleb Derujunsky (1888 - 1975) Limestone 1949. 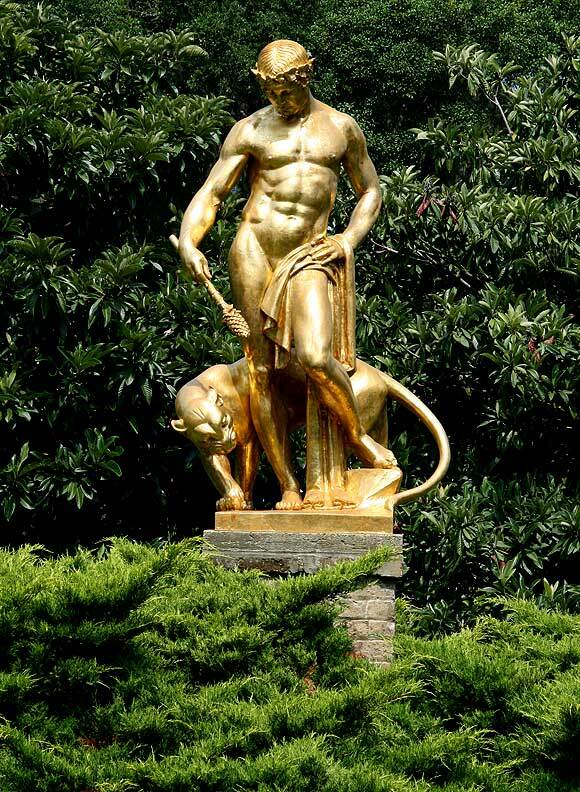 Derujunsky's work included a lrge number of biblical themes such as this powerful rendition of Samson and the Lion. 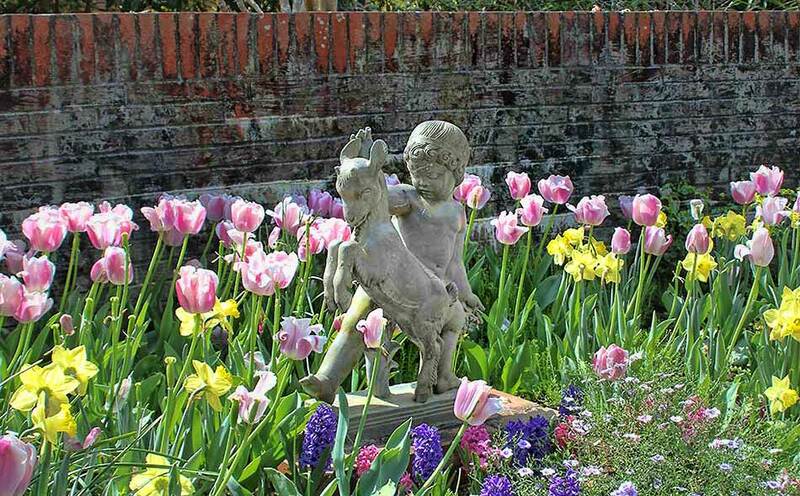 As proficient at carving as he was at modeling in clay, Derujinsky worked in both stone and wood. 3. 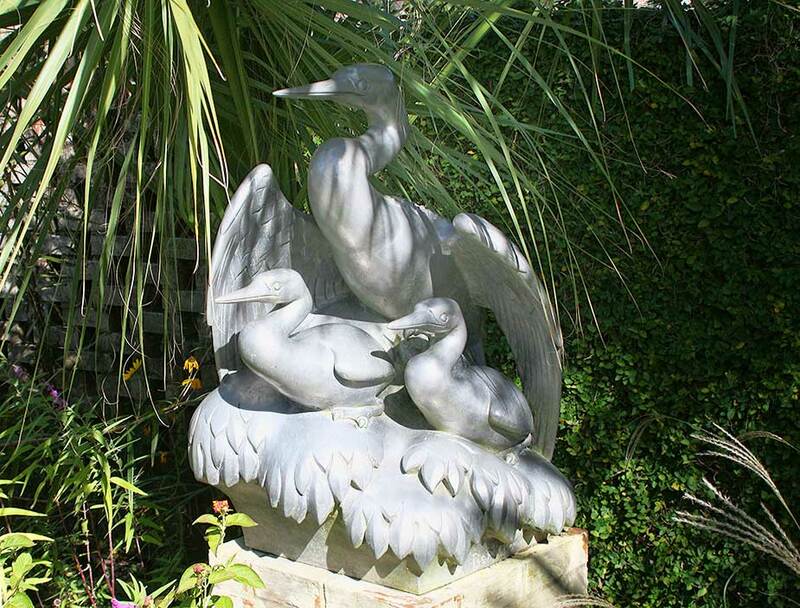 Group of Anhingas by Gustave Bohland (1895 - 1959) Aluminum, 1936 A female anhinga, or water turley, on the nest shelters her fledglings beneath her wings. 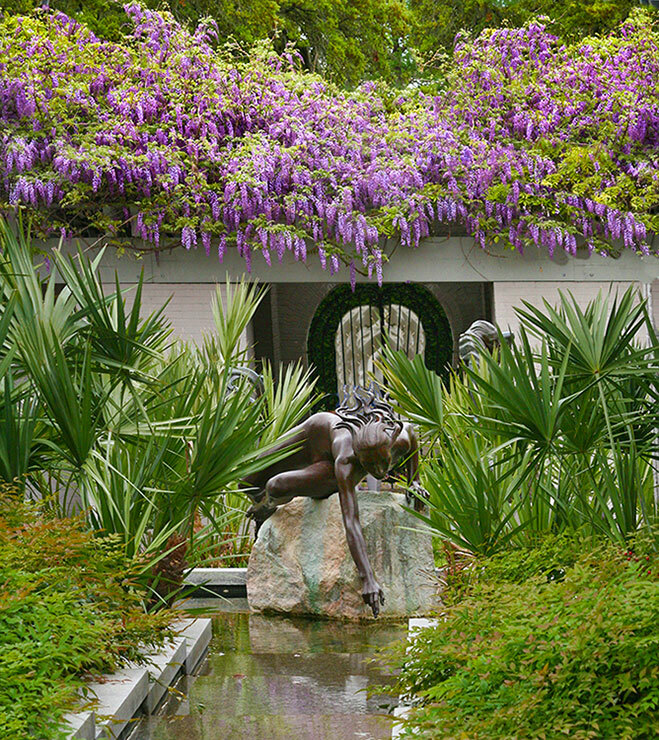 This group ornamented the facade of Bohland's studio at Miami Beach, Florida. A native of Austria, he was best known for portraits and bas-reliefs. 4. 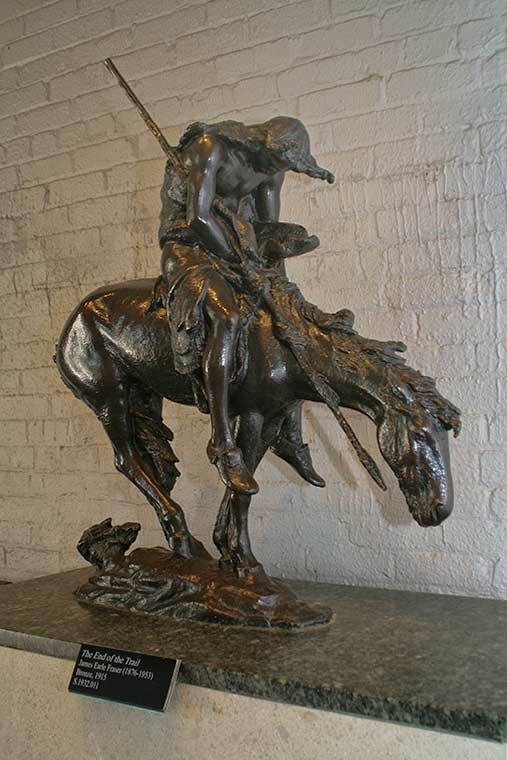 Primitive Man and Serpent by Roland Hinton Perry (1870 - 1941) Bronze, 1899. Originally titled Thor and the Midgard Serpent, this work portrayed the final battle of Ragnorok - the twilight of the gods and the end of the world in Norse mythology. 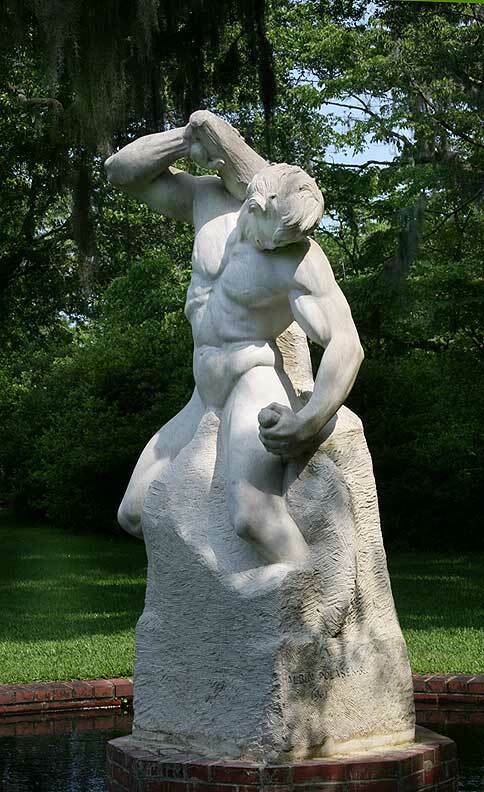 The thunder god Thor killed the serpent Jormangund, but then died from exposure to it's deadly venom, the myth representing the end of paganism and the beginning of the Christian era in northern Europe. 5. 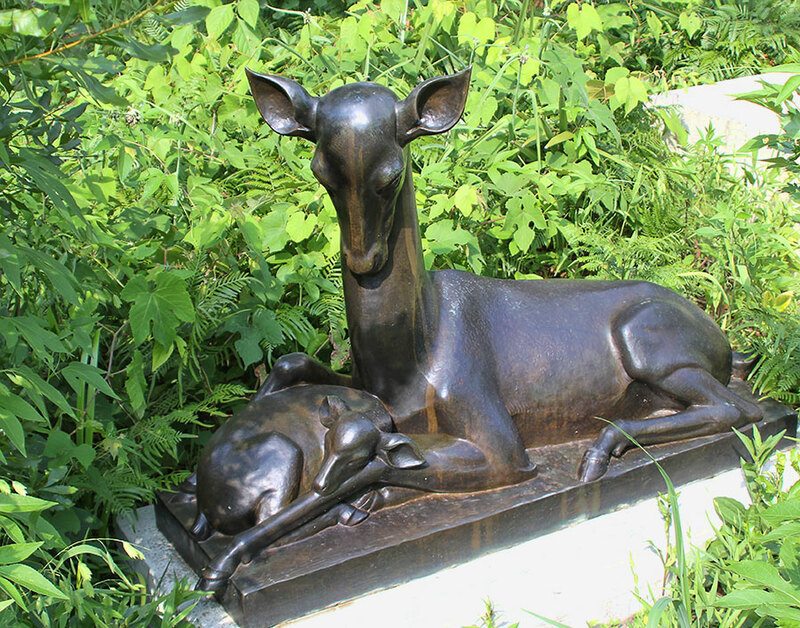 Scratching Doe by Dan Ostermiller (b.1956) Bronze, 1996. Gift of Nedra and Richard Matteucci. 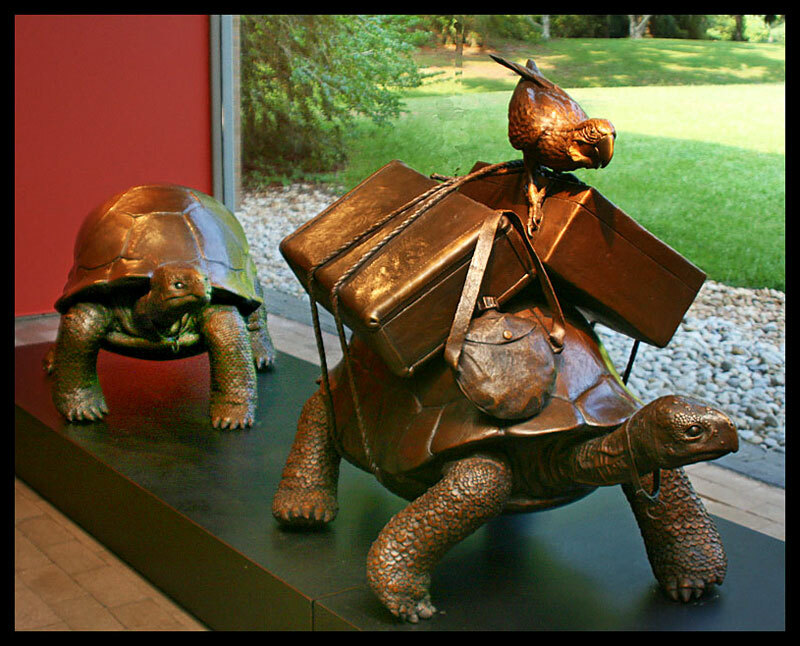 A fascination with wildlife led Dan Ostermiller to age to become a sculptor. Although his work is realistic, it is not just an accurate rendering of the subject, but an artistic line of composition. a self-taught artist. 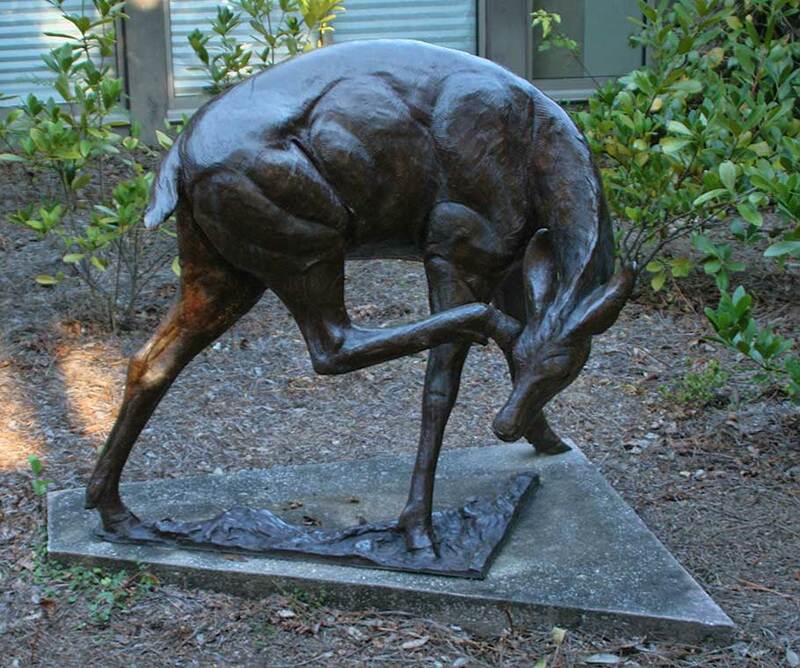 Ostermiller draws upon his vast knowledge of animal anatomy acquired through many years of keen observation. Click each photo to enlarge. 1. 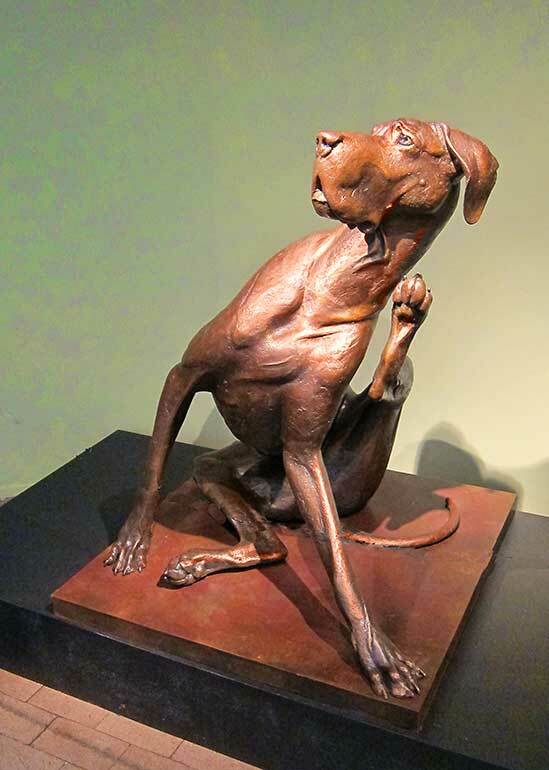 Can Can by Jane DeDecker (born 1961.) The Jane DeDecker's dancers represent a cancer victim with 4 friends helping her through the process of dying. An allegory of the human spirit's triumph over death. 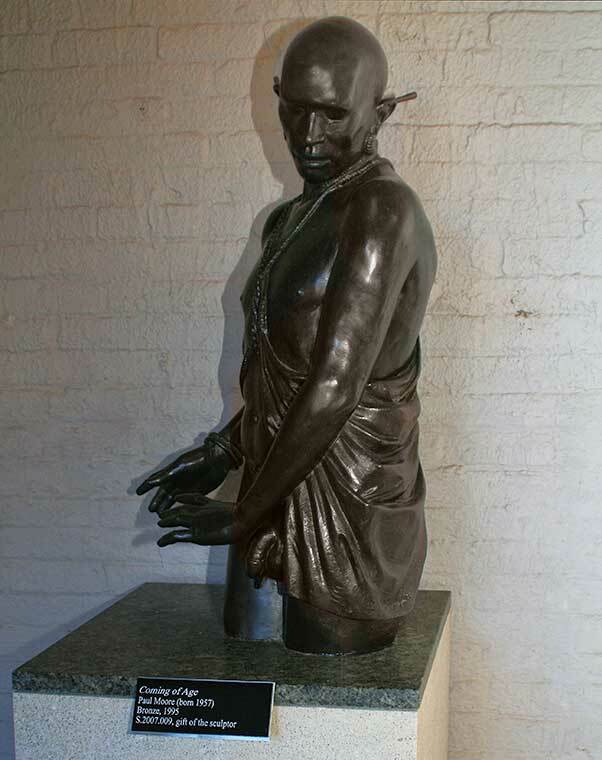 This clay sculpture received the 1999 National Sculpture Society's Silver Medal. 2. and 3. 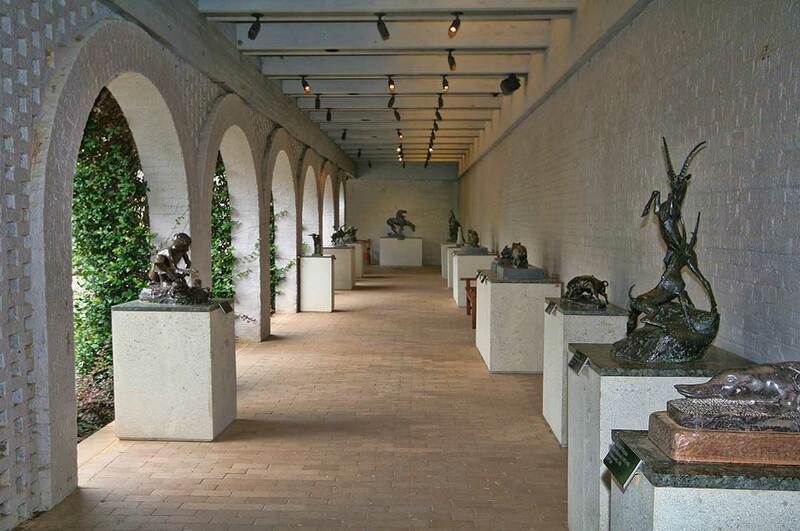 Brown Sculpture Court. 4. Bella and the Bug by Louise Peterson (b. 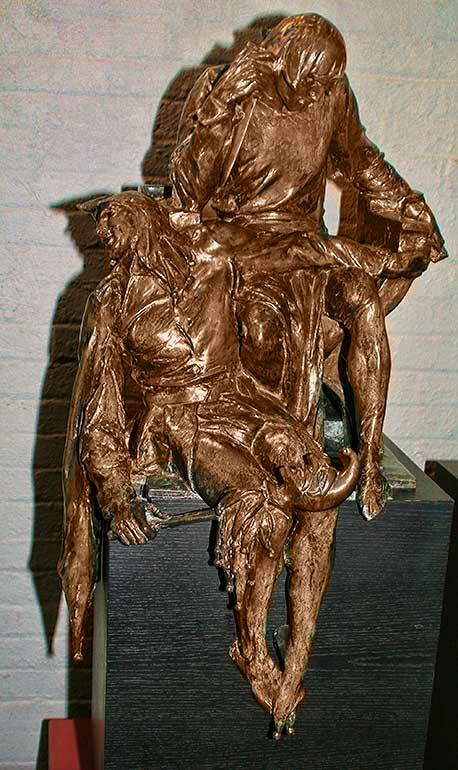 1963) Bronze. Gift of sculptor. 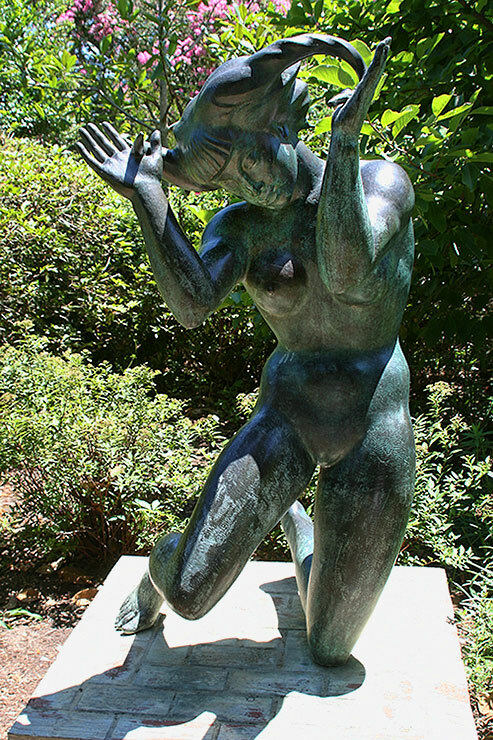 Originally trained in classical ballet, Louise Peterson did not begin to study sculpture until 1987. Bella and the Bug was inspired by observing her pet showing a disturbed level of concentration for many minutes while inspecting a fly. 5. Spout for a Drinking Fountain by Anna Hyatt Huntington (1876 - 1973) Aluminum, 1953. 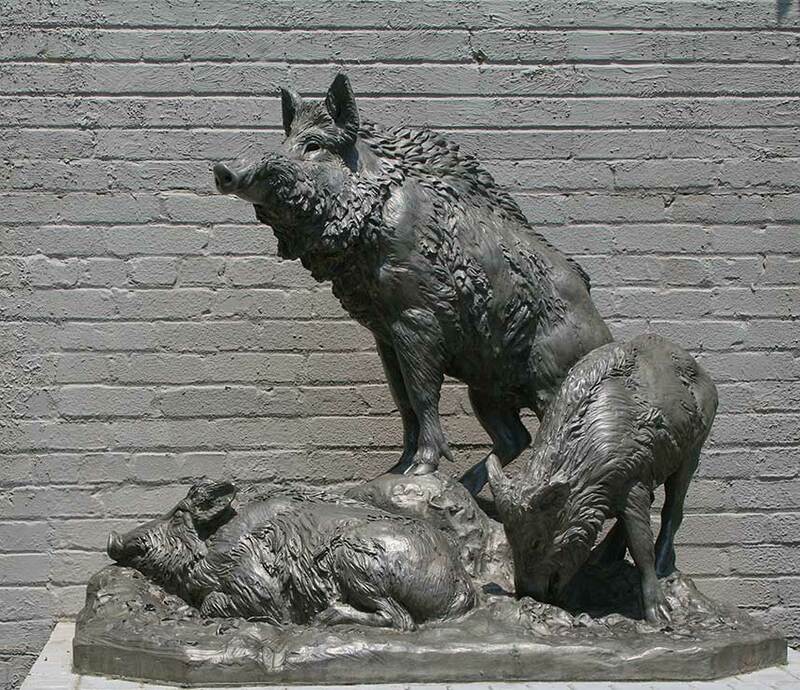 Anna Hyatt Huntington was te first sculptor in America to cast in aluminum which she liked for its light weight and luster. 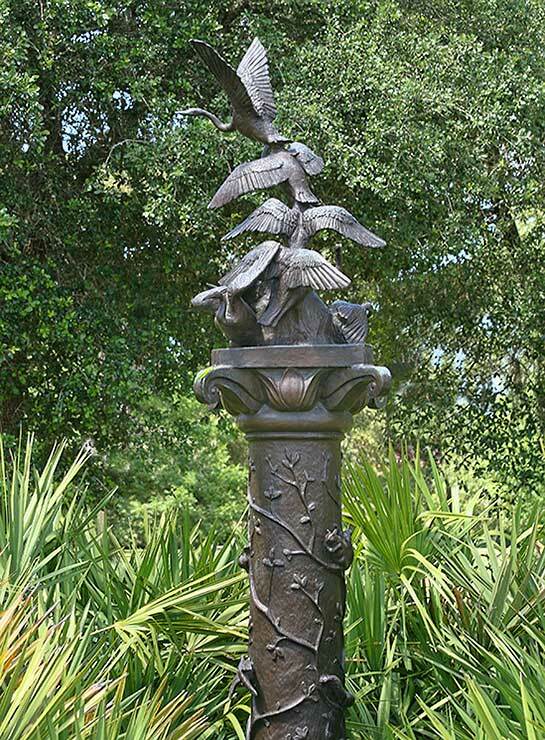 This duck sculpture was designed to accompany the oak-leaf carved marble base which was later re-purposed as a drinking fountain. 1. Peacocks by Dan Ostermiller (b. 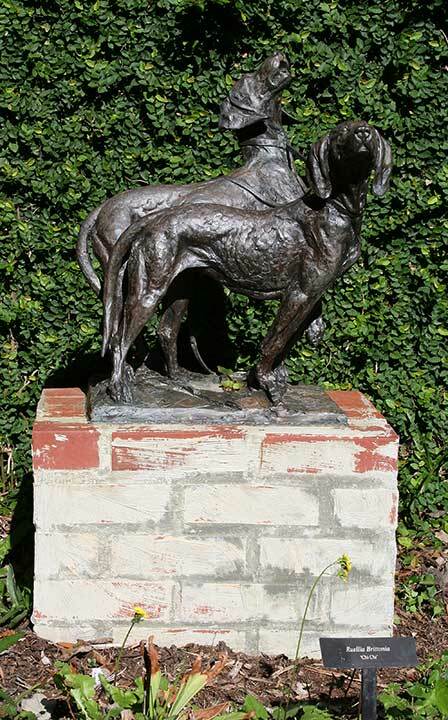 1956) Bronze, 2004. On loan from thePrivate Collection of Tia. 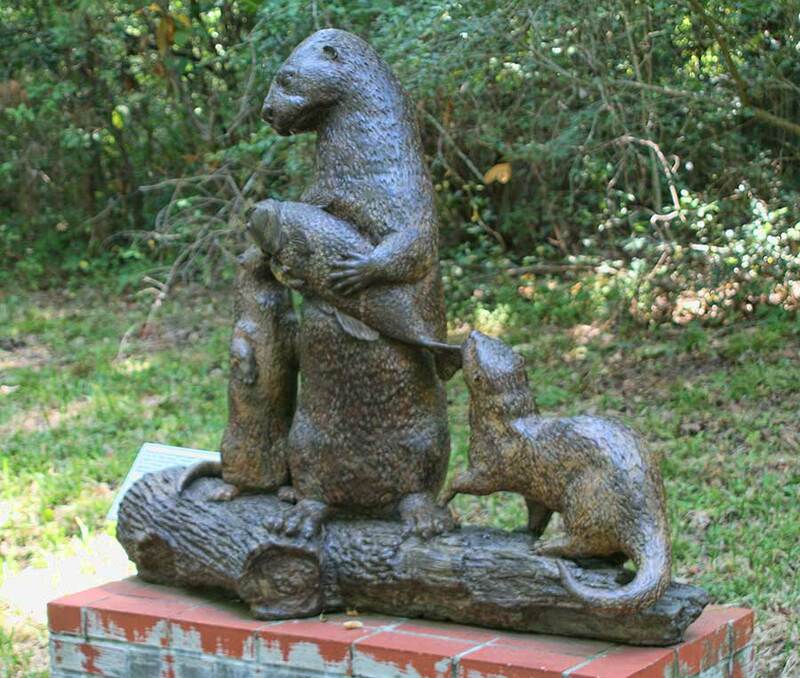 A fascination with wildlife led Dan Ostermiller at an early age to become a sculptor. Although his work is realistic, it's not just an accurate rendering, but a skillful blend of lines, composition and texture. 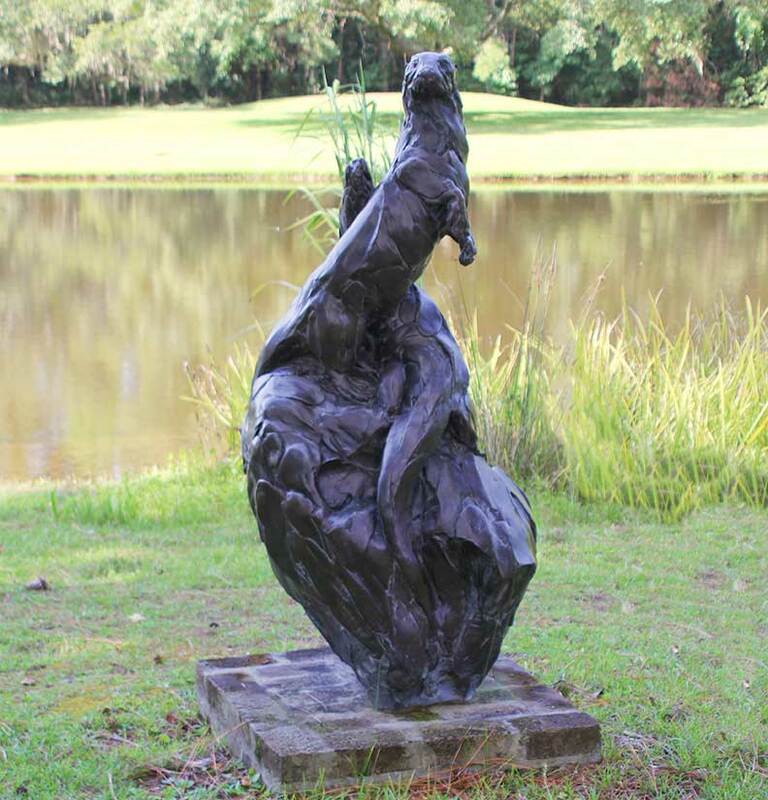 As a self-taught artist, Ostermiller draws upon his knowledge of animal anatomy acquired through years of observation. 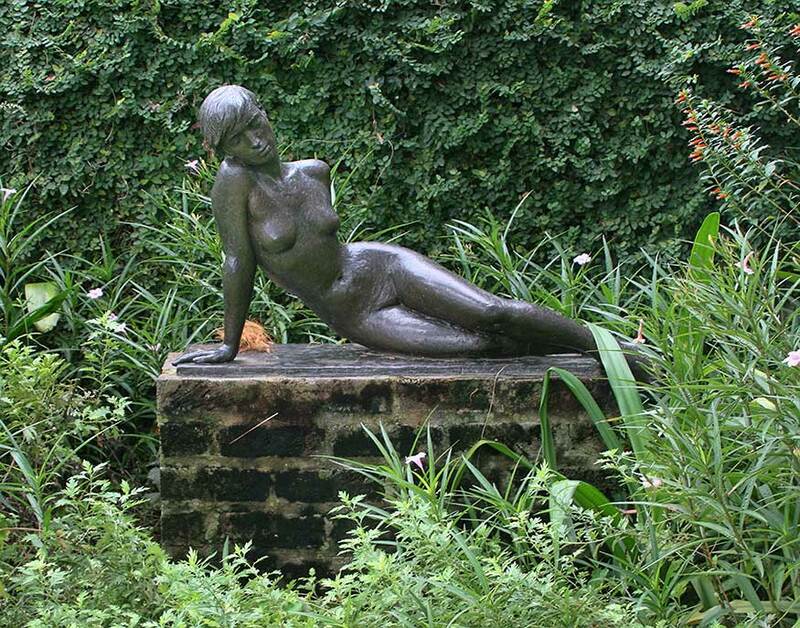 His works are in public an private collections worldwide. 2. 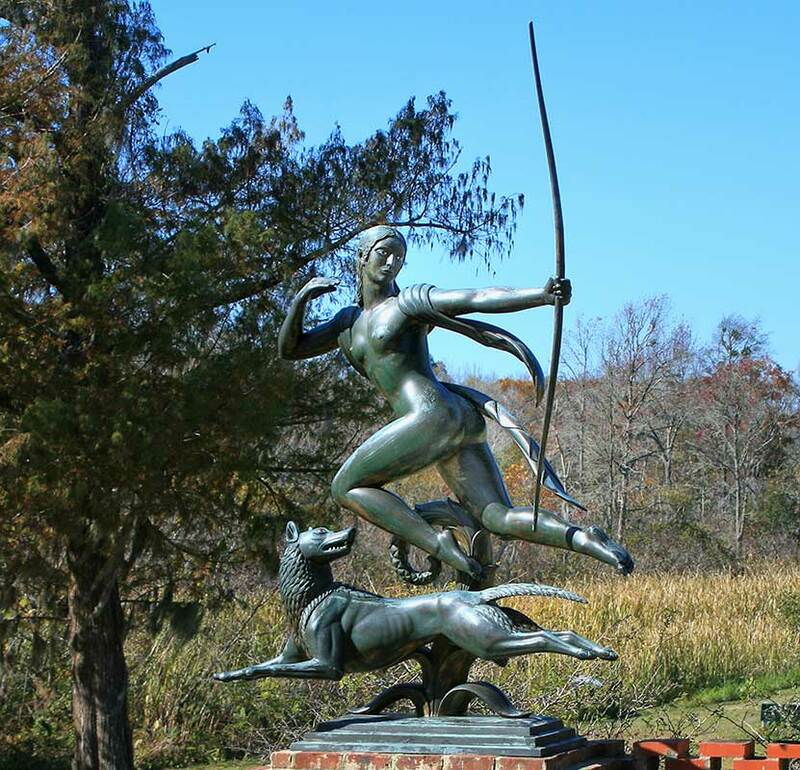 A penchant for astrological and mythological symbolism comes across clearly in Paul Howard Manship's work. 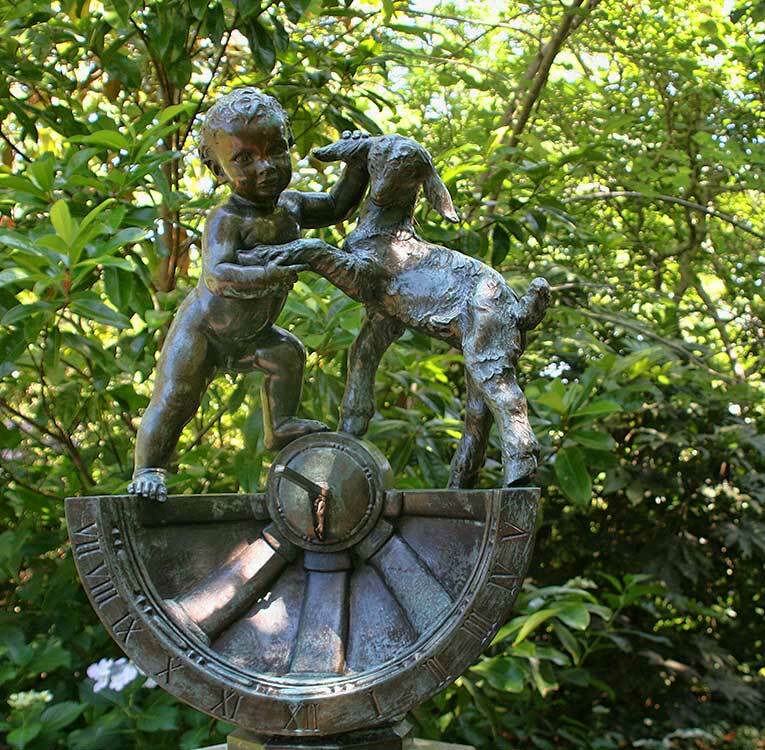 The sundial symbolizes the cycle of life encompassed by the cycle of eternity. 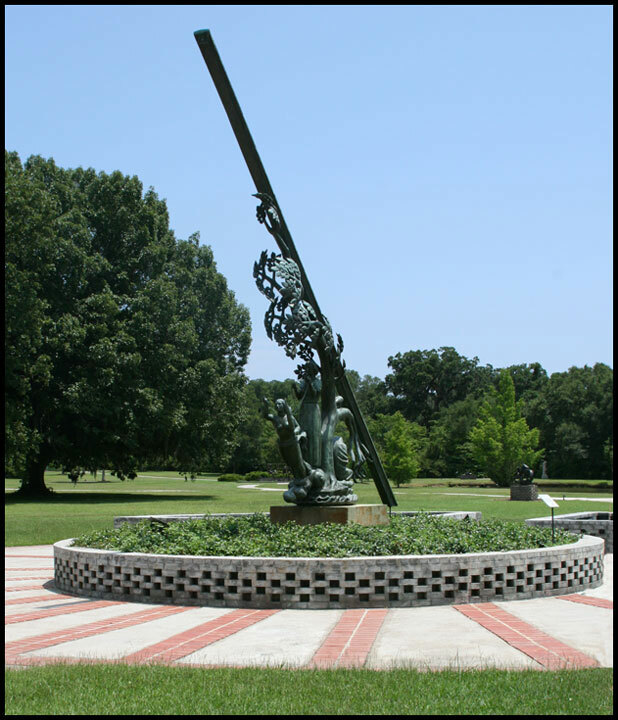 It is patterned after an ancient astronomical devise composed of rings, representing the great circles of the heavens. In the rings and base depicted the elements, seasons, hours of day and signs of the Zodiac. 3. 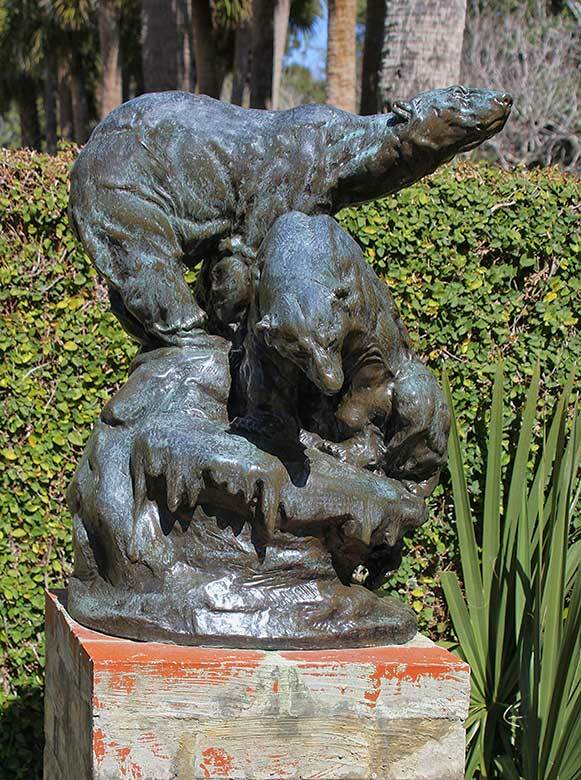 Polar Bears by Frederick George Richard Roth (1872-1944) Frederick Roth preferred to present animals in natural settings using an impressionistic modeling style. 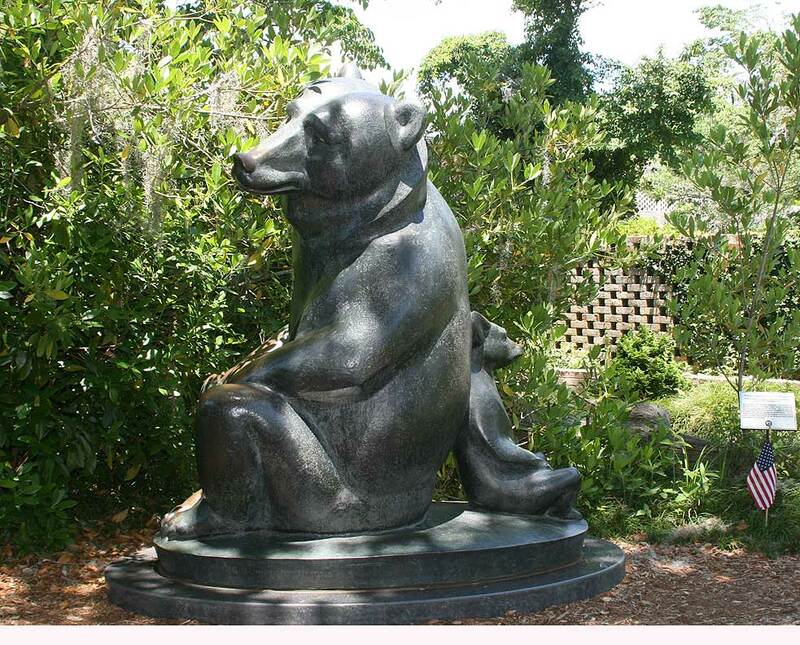 His work often depicted his subtle sense of humor and preference for movement, Polar Bears assured his election to the National Academy of Design in 1906 and won the National Arts Club prize in 1924. 4. and 5. 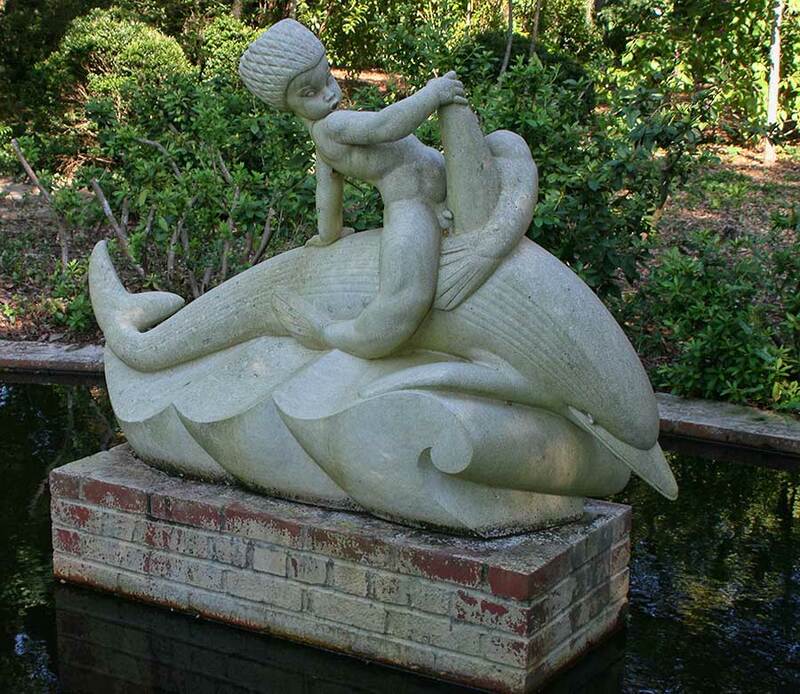 Neptune (4) and Amphitrite (5) by Wheeler Williams (1897 - 1972) Lead, 1939. 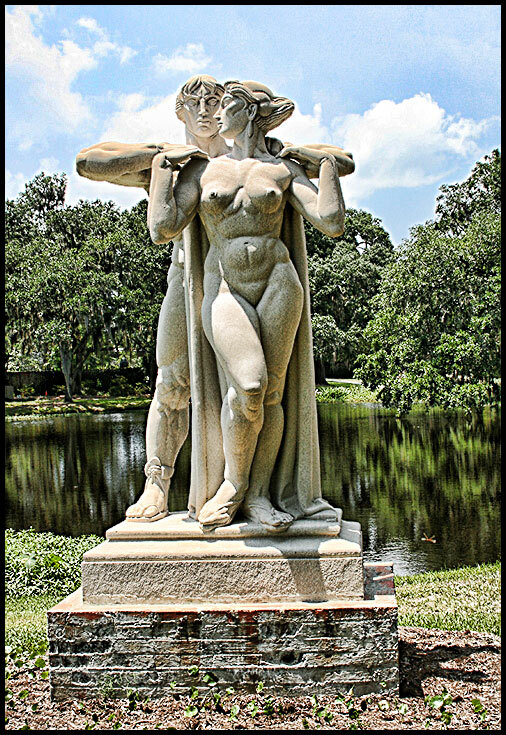 Representing the youthful ggod of the sea, Neptune, and his wife Amphitrite, these two figures are part of "The Childhood of the Gods." 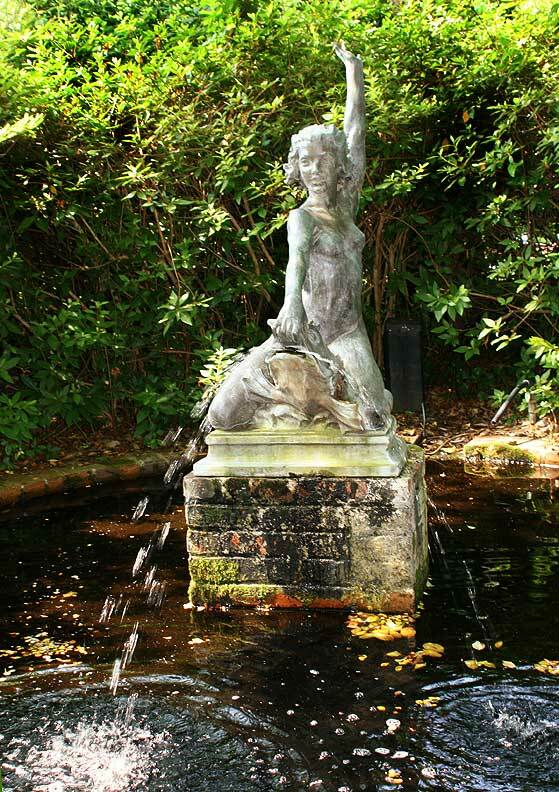 Neptune stands with a trident in hand, while Amphitrite (who has the body of a mermaid) holds a seashell to her ear. 1. My Niece, by Jo Davidson 1883-1952. Jo Davidson distinguished himself as a portraitist, working rapidly so that he could express his thoughts as they came. his ability to present innnate qualities with startling clarity was coupled with his flair for capturing the physical appearance of the sitter. 2. 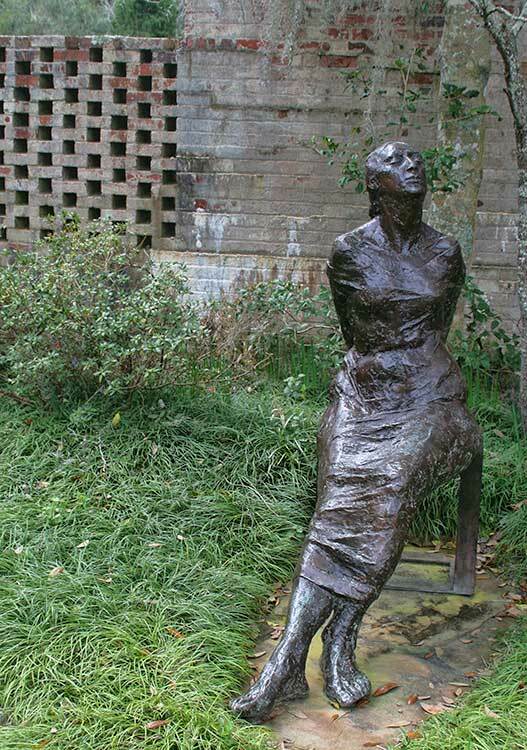 April, by Charles Cropper Parks (1922 - 2012) Bronze 1998. Gift of sculptor. 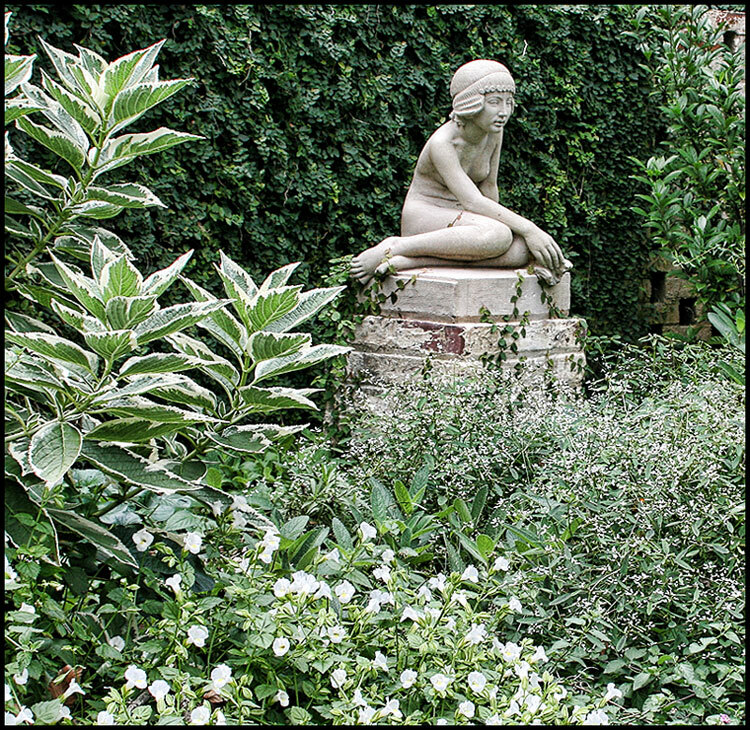 Modeled in the late 80s, this figure was based on the design of an earlier small sculpture of the Roman Goddess of Flowers, Flora. 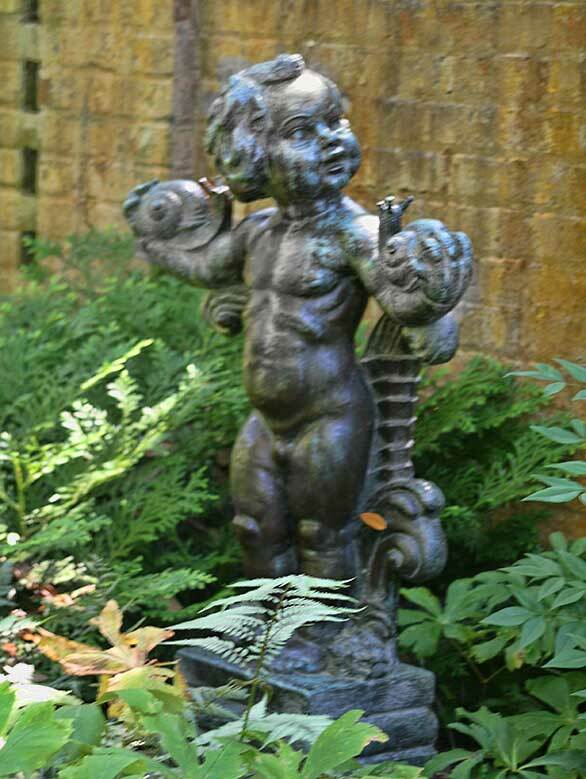 This work was an experiment, cast in a commercial foundry from several small rubber molds. 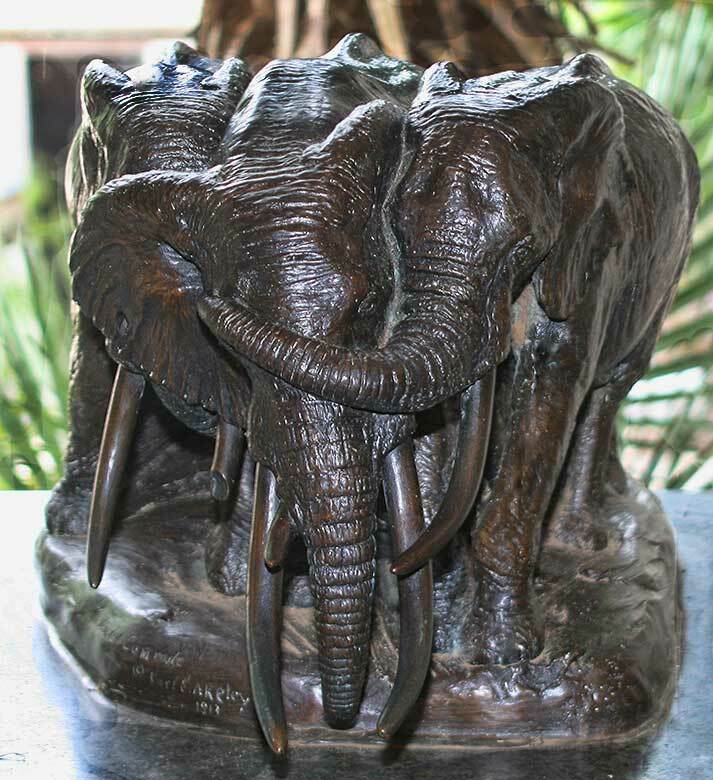 Each part was then welded together to create a seamless casting in bronze. 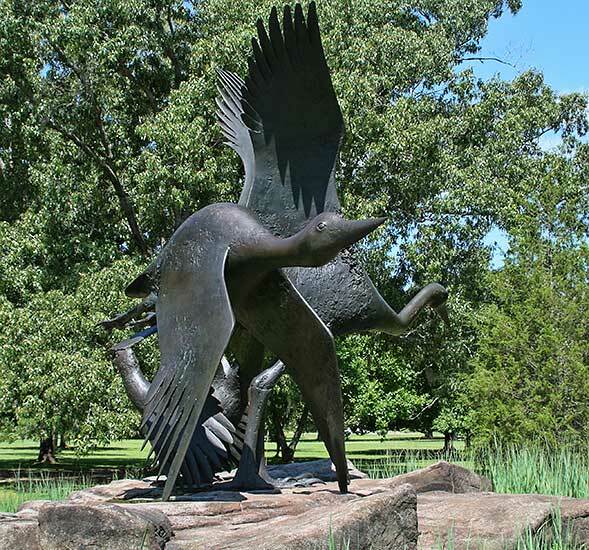 The lifetime works of Charles Cropper Parks is a Delaware treasure. 3. 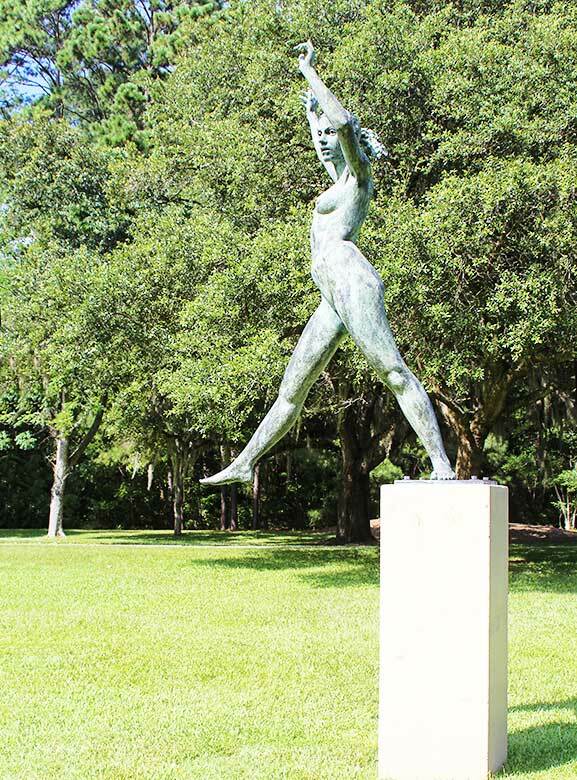 The Space Walker by Richard McDermott Miller (1922 - 2004) Bronze 1978. 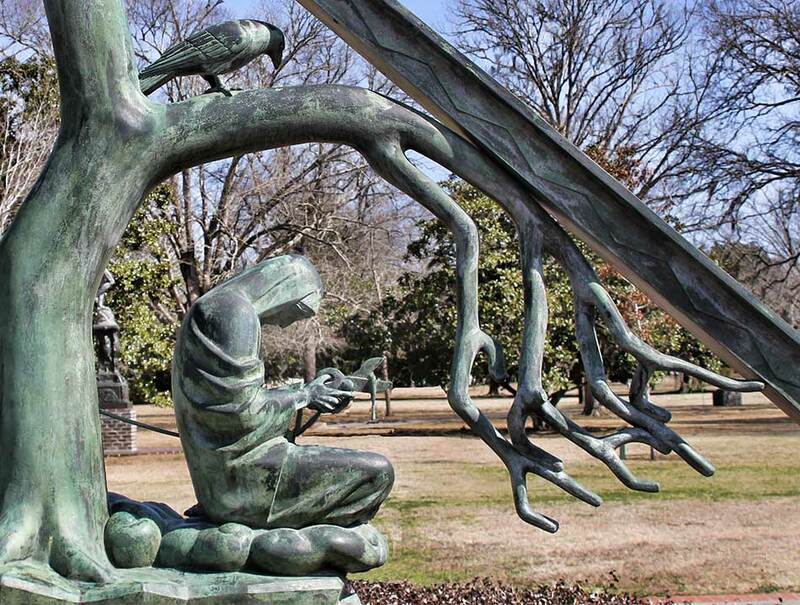 Gift of the sculptor. 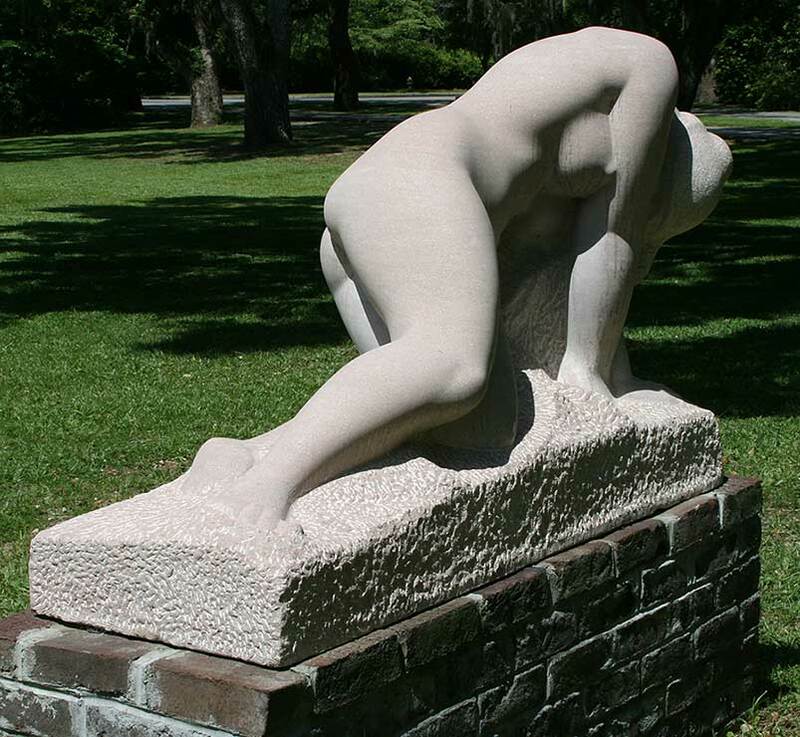 Often referred to as the "Figure Sculpture of Soho," Miller focused his work on the human figure, and, in particular, the female form. 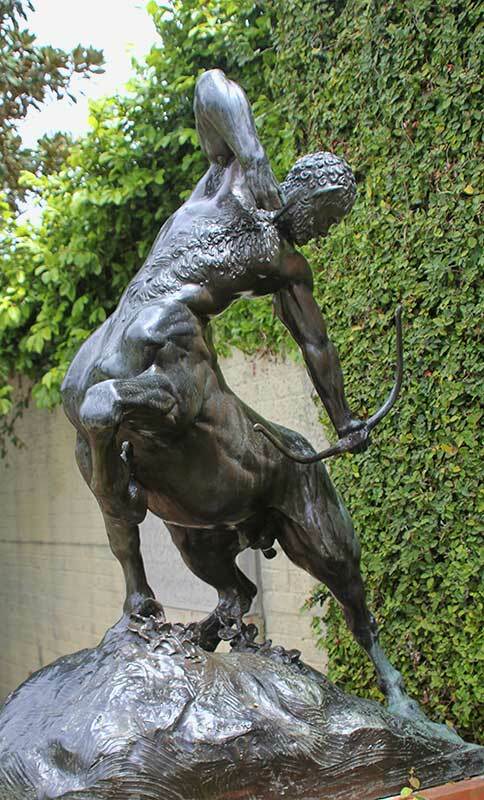 His bold figures always featured interesting composition and dynamic movement. 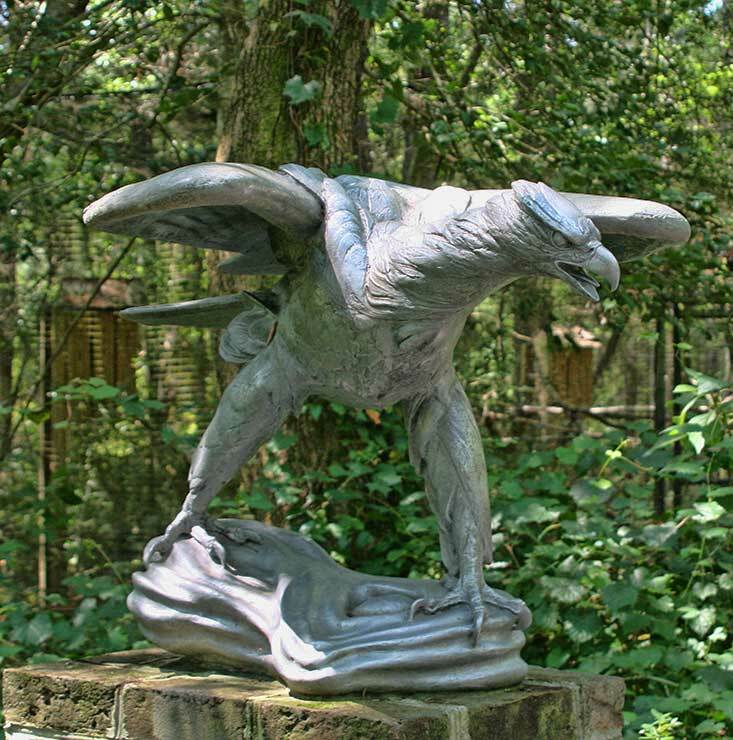 Another casting of this size is located on the campus of Kent State University. 4. Duck and Turtle by Albert Laessle (1877 - 1954) Philadelphia native Albert Laessle's choice of animals as subjects began in his student days. He studied with Thomas Anshutz and Charles Grafly at the Pennsylvania Academy of Fine Arts in Europe. An art critic wrote that he presented his studies with something of the flavor of a humorous naturalist who observes the tragedies and comedies enacted in his little kingdom. 5. 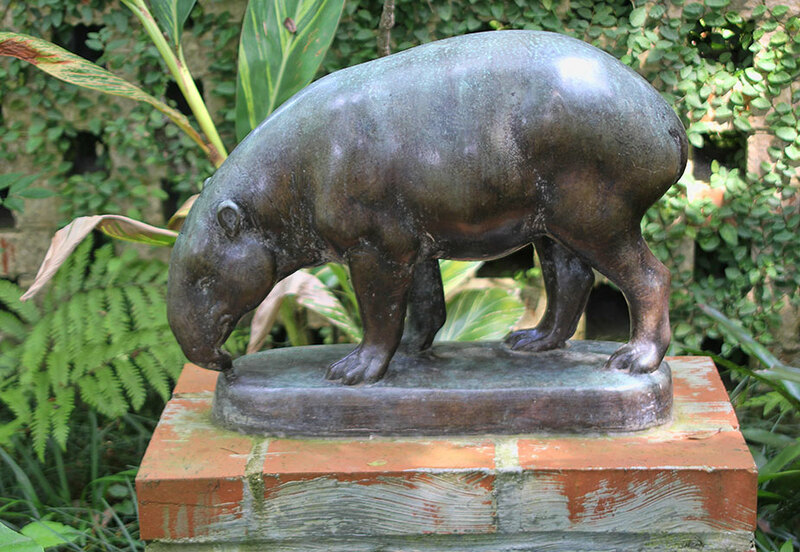 Black African Rhinoceros by Robert Henry Rockwell (1885 - 1973) Bronze, 1937. 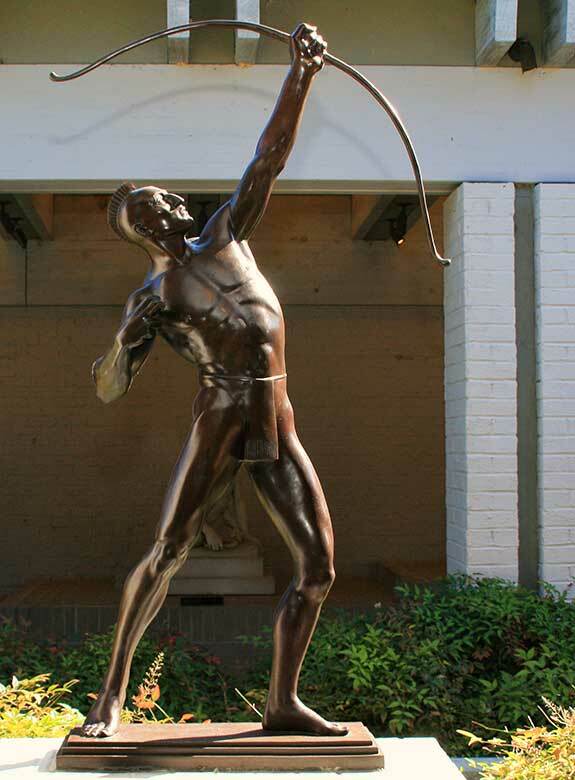 Rockwell's early career was spent at the National Museum in Washington D.C., the Brooklyn Institute of Arts and Sciences and the Cleveland Museum. 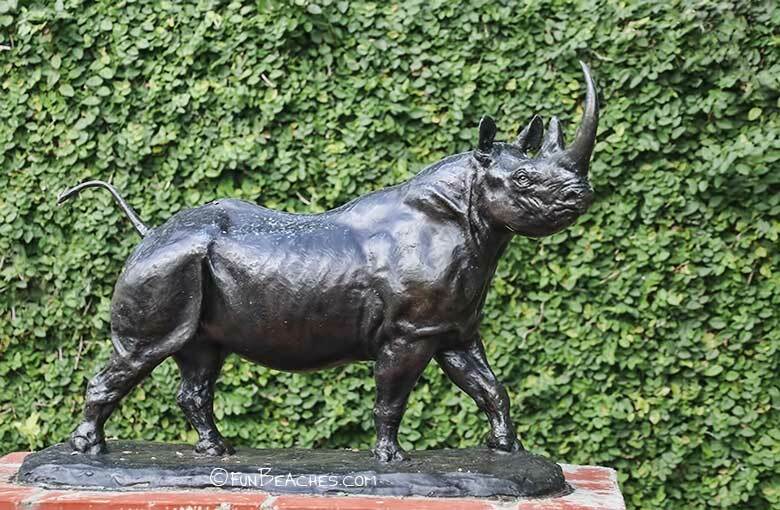 Later, in the Museum of Natural History, Rockwell helped create the Akeley African Hall, where the life-size version of this rhinoceros was mounted. This study was modeled as a sketch for a habitat group placed in scenery of the northwest slope of Mt. Kenya. 6. Bernard Baruch Maira J. Kirby-Smith (b. 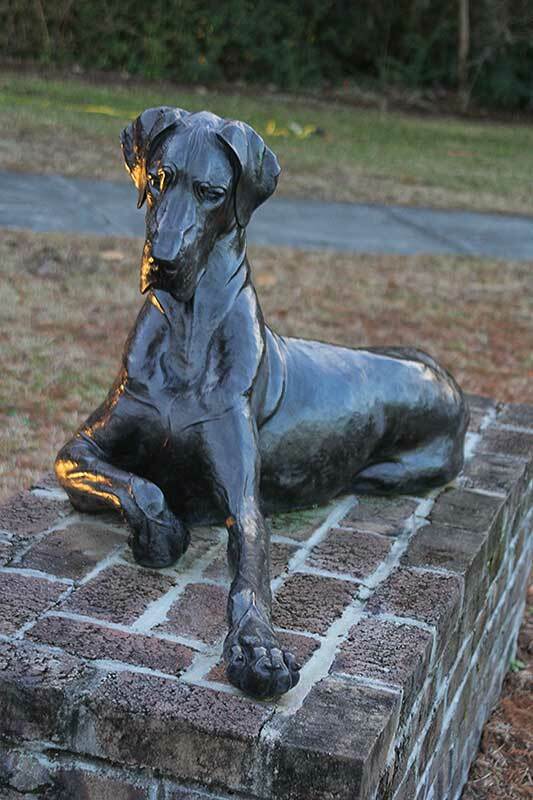 1949) Bronze, 2013 Gift of the Trustees of Brookgreen Gardens Bernard M. Baruch (1870 - 1965), the “Park Bench Statesman” made his fortune on Wall Street, but his greatest satisfaction was his service to his country as an economic advisor during both World Wars I and II and as a confidante to 6 American Presidents. 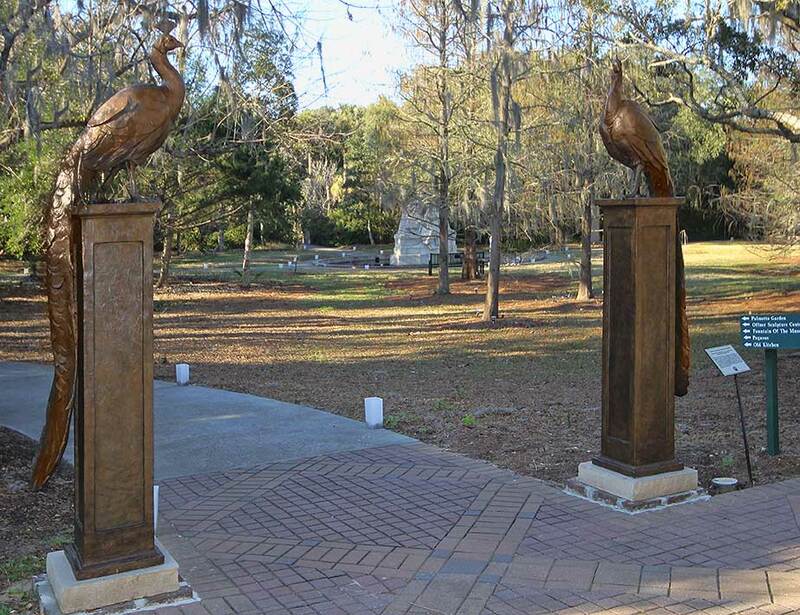 Another casting of this sculpture, located in Camden, SC where Baruch was born, is party of a larger work entitled ‘Reconciliation’. 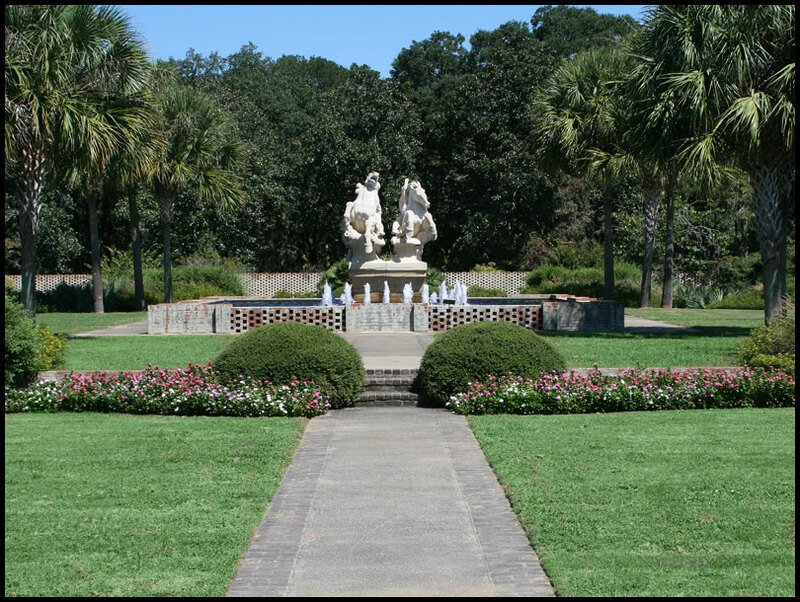 Maria Kirby-Smith has cfreated several monuments of his otic persons such was Gen. Thomas Sumter, Judge Matthew W. Perry, and Strom Thurmond. 1. Call of the Bison by Herb Mignery. 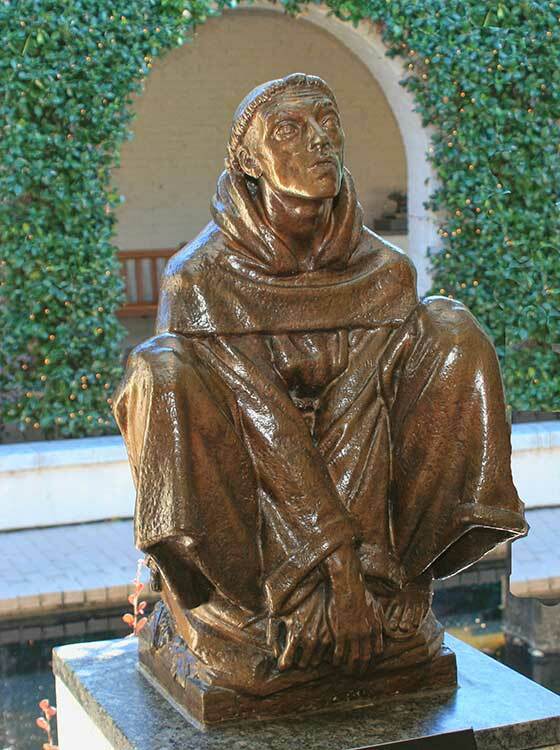 Bronze, on long-term loan from the Private Collection of Tia. 2. 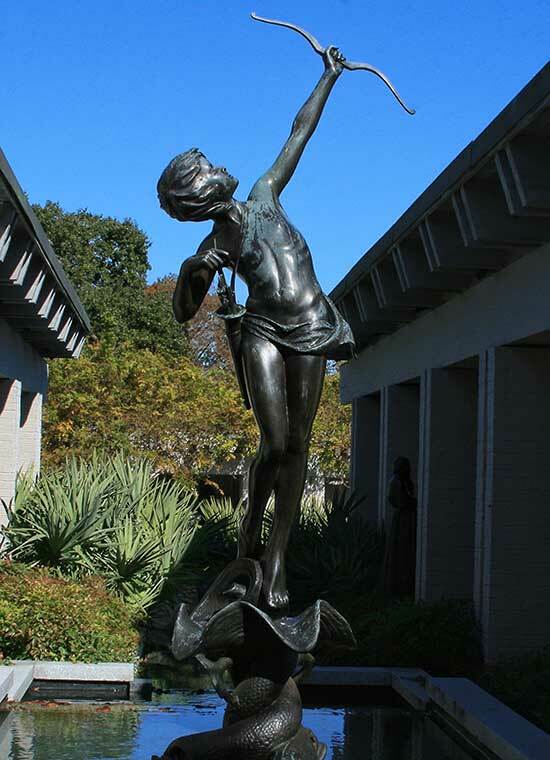 Spirit of American Youth by Donald H. Lue (1897-1988), bronze 3. 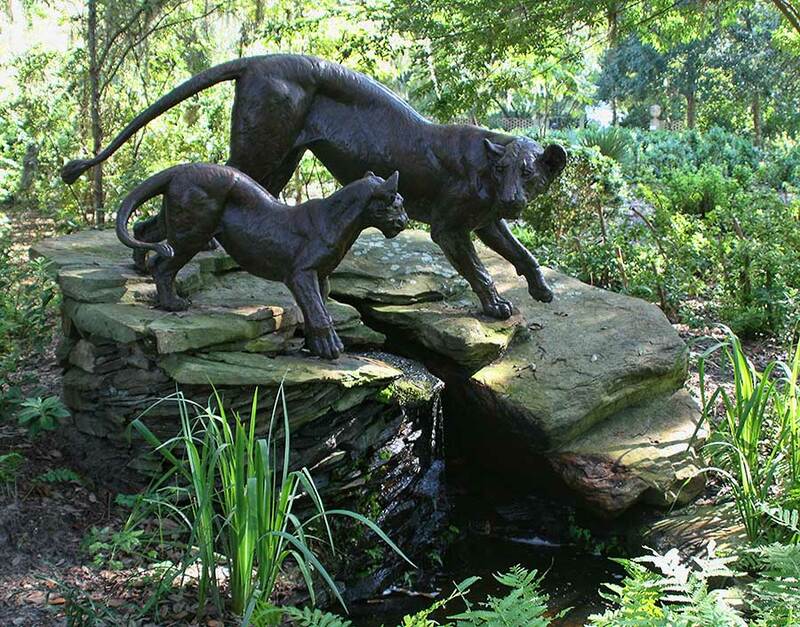 Jaguars by Anna Hyatt Huntington (1876-1973) Aluminium 1935 4. 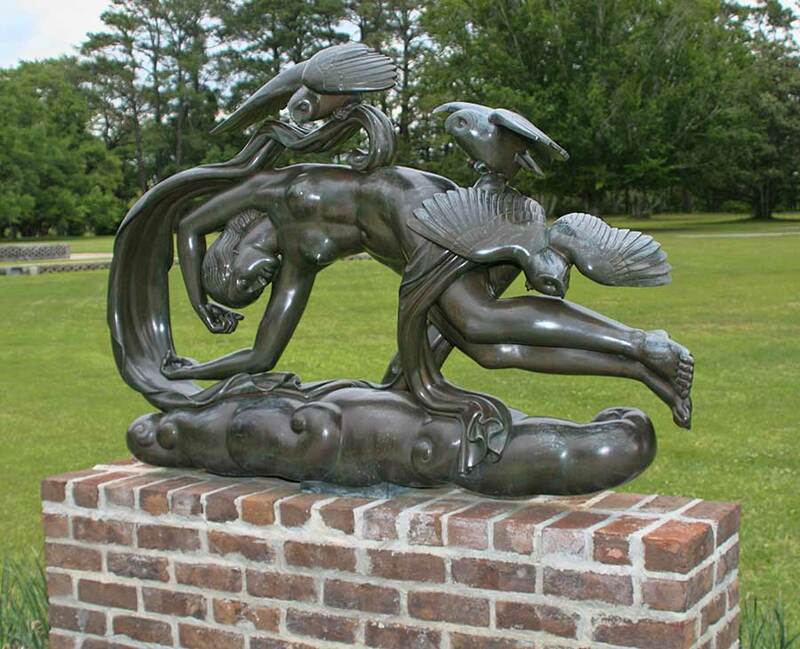 Survival of the Fittest by Robert Henry Rockwell (1885 - 1973) Bronze 1938 5. Otter Rock by W.Barton "Bart" Walter (b. 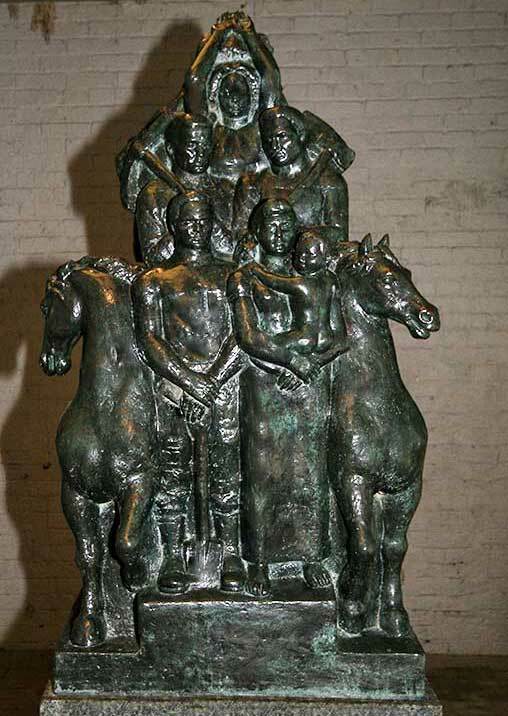 1958) Bronze 1992. 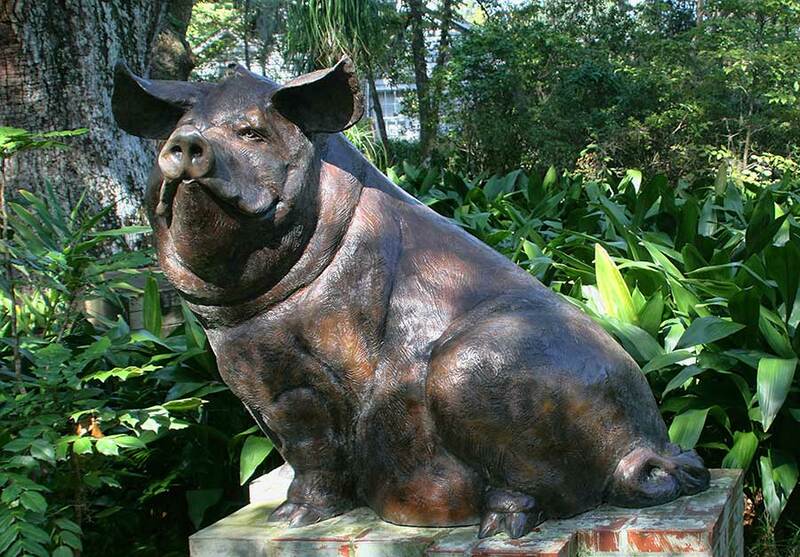 Bart Walter's animal subjects aredrawn from many regions of the world. His composition and modeling style, building layered surfaces of clay to depict muscle and movement, provide a fresh approach to his work. Bart Walter's background as a biologist brings a deep interest in the animal world, not only as subjects, but as important links to the future of the environment Click each photo to enlarge. 1. 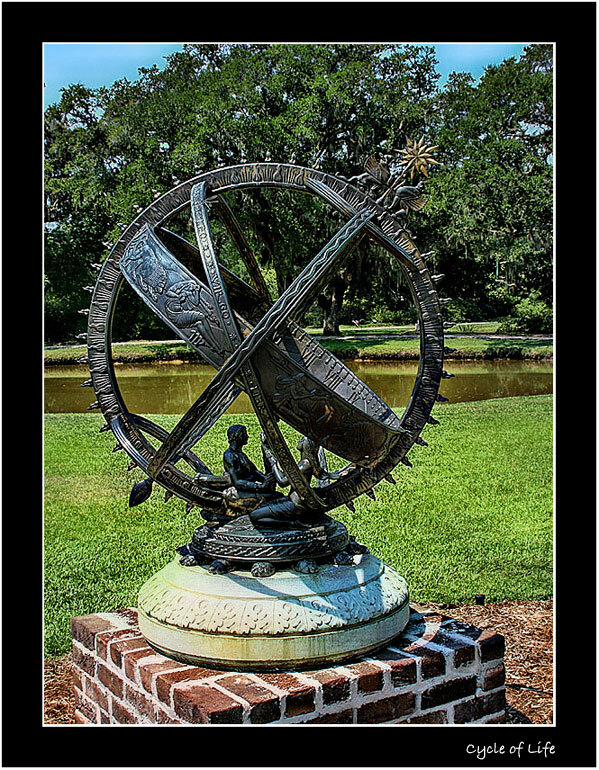 Tidal Rhythm by Christopher Smith (b. 1958) 2. 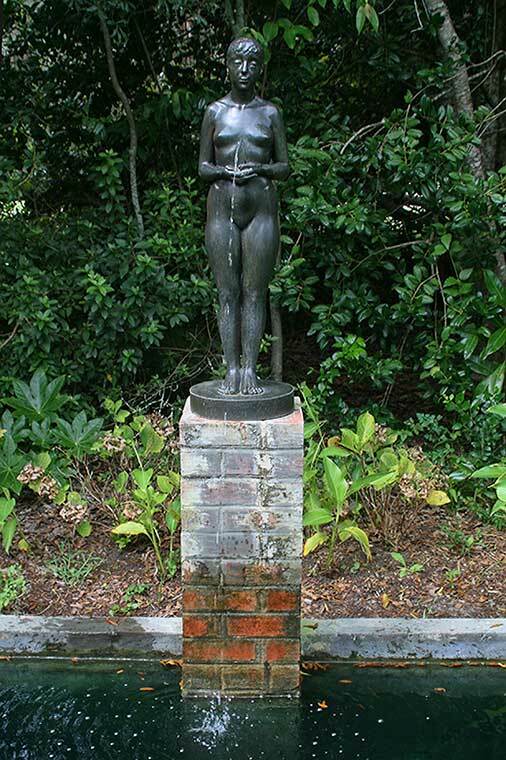 The Bather by Gwen Marcus (b. 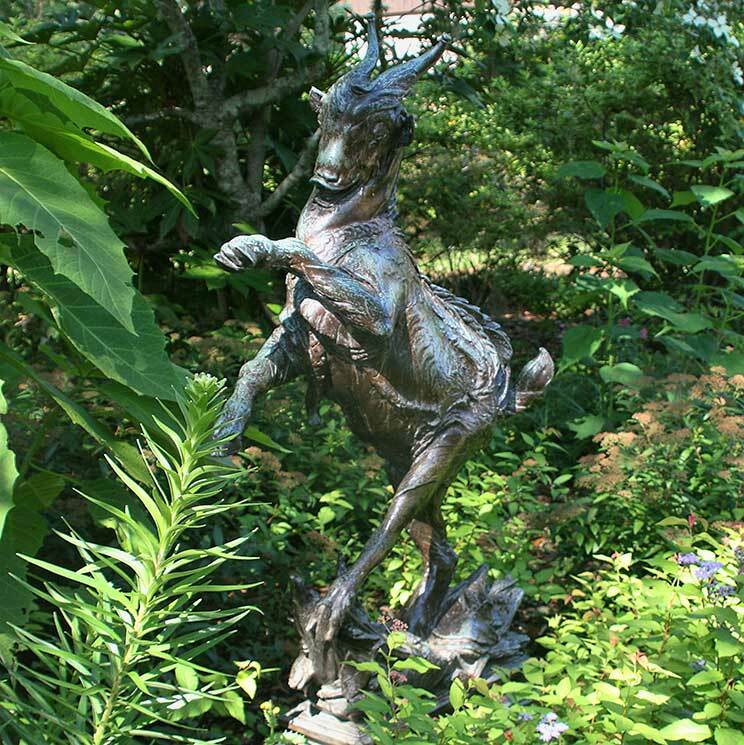 1956) Bronze, 2005. Gift of John and Cookie Cloyd and others. 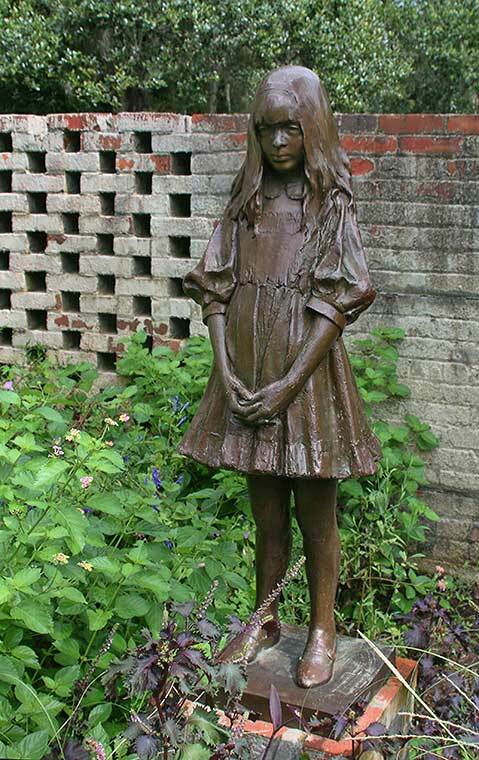 Asa child, Gwen Marcus studied with Clementine Spampinato and Bruno Lucchesi. She went on to attend the National Academy School of Fine Arts, Rhode Island School of Design, and the Art Students League. 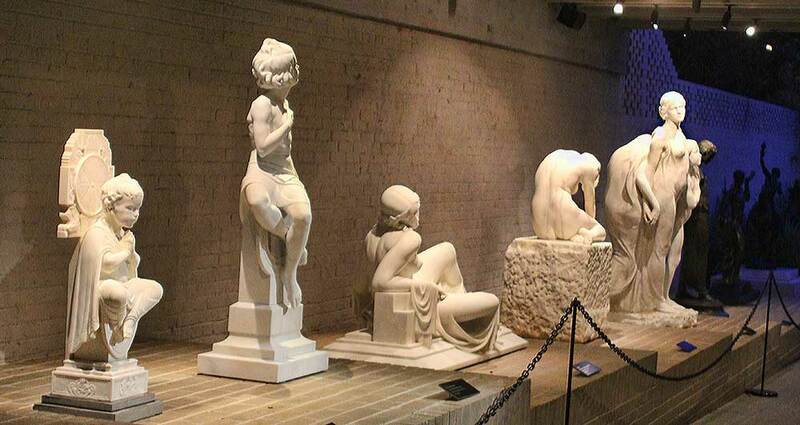 Marcus depicts diverse views of women. 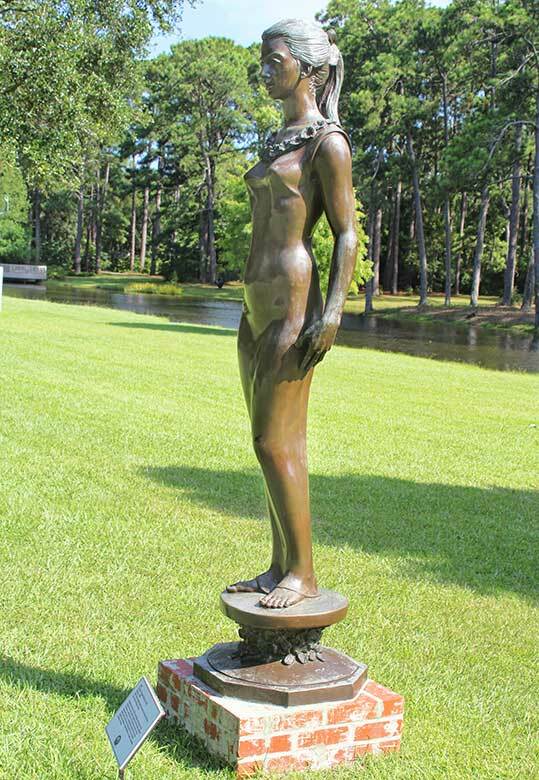 The Bather is also in the collections of the Chi Mei Museum, Taiwan, and Champs Hill, West Sussex, England, as well as private collections in England and New York. 3. 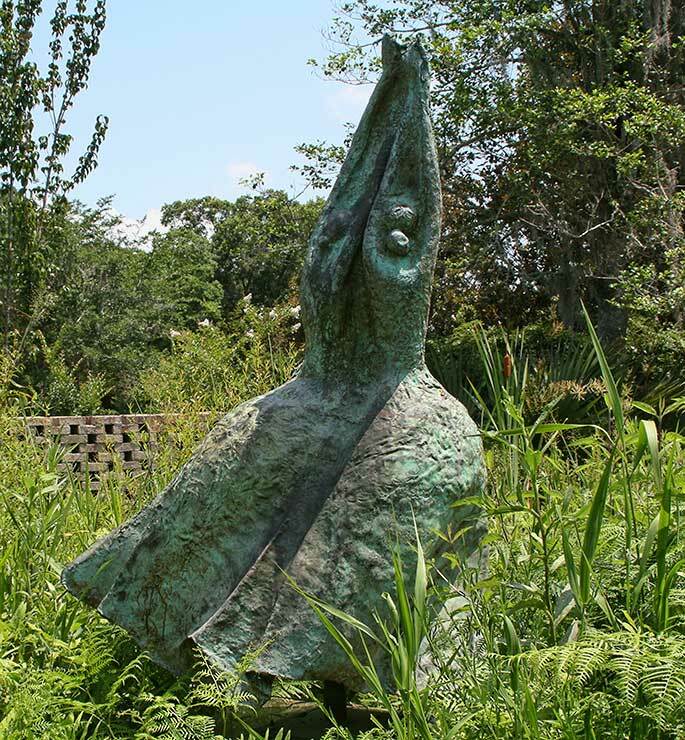 High Tide by Charles Cropper Parks (1922 - 2012) Bronze 1985. Gift of the family. 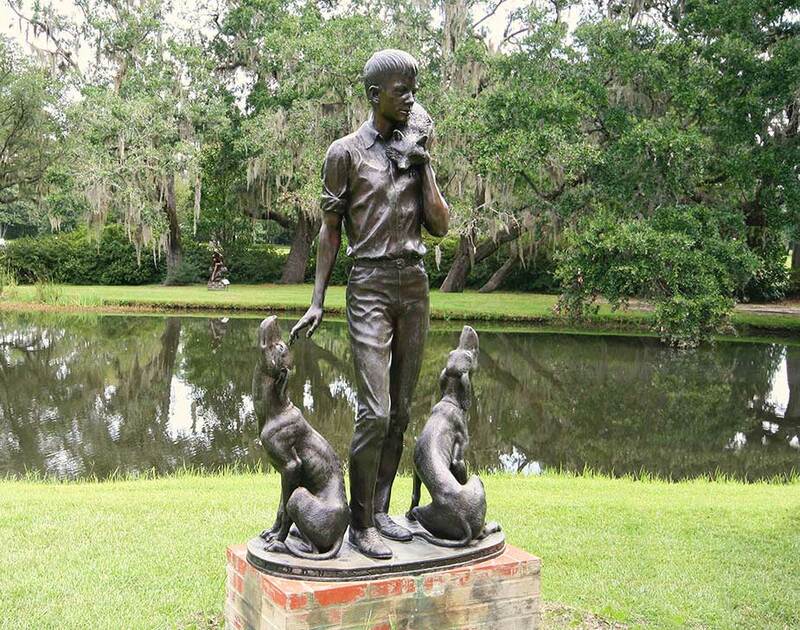 Known for his enchanting portraits of children, Parks embraced genre sculpture by placing hus subjects ub casualsetting and activities, The prototype for this sculpture, titled Boy and Gulls, was first conceived in 1976 for Mystic Seaport Museum in CT. The concept was remodeled in 1965 and enlarged to life size. 4. 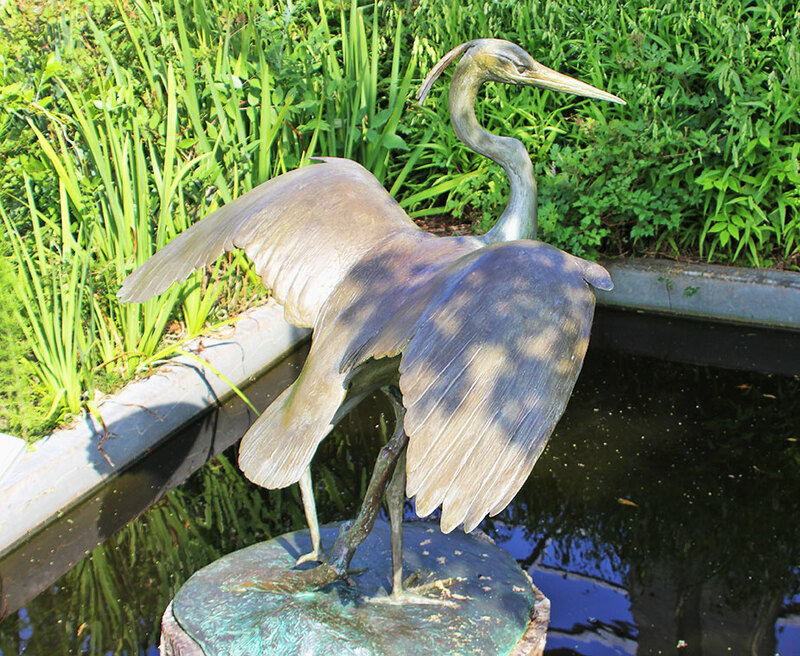 The Water Bearers by Glenna Goodacre (b. 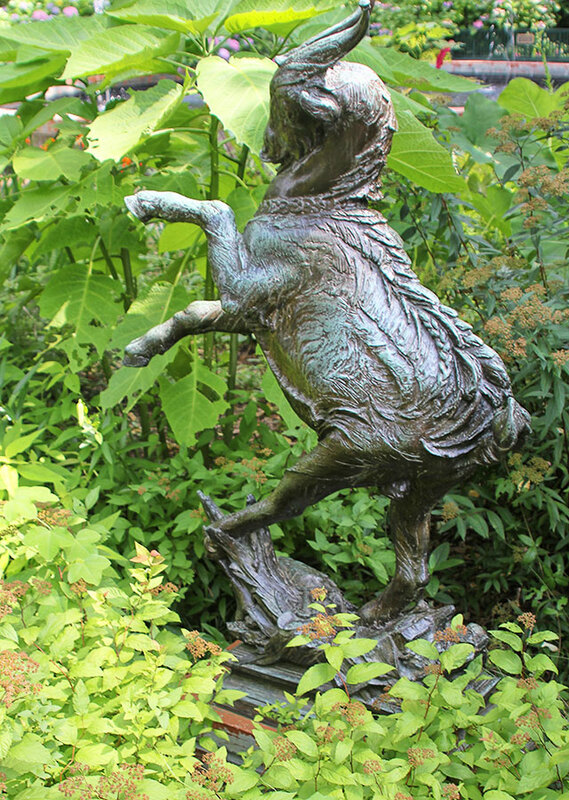 1939) Bronze, 1985-1986. On long-term loan from the "Collection of Tia." 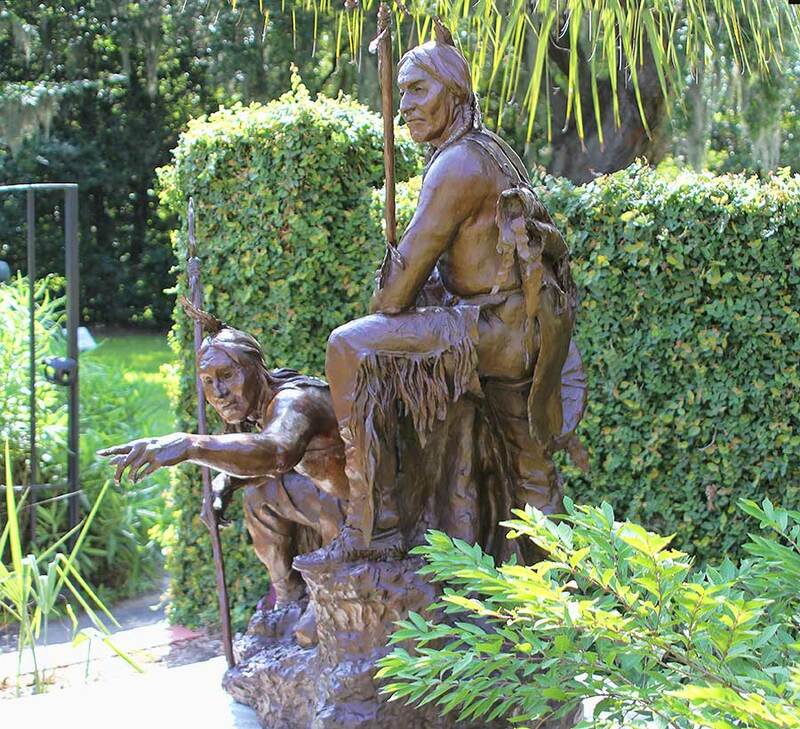 Glenna Goodacre often presenters scenes from Native American culture life in her sculpture. 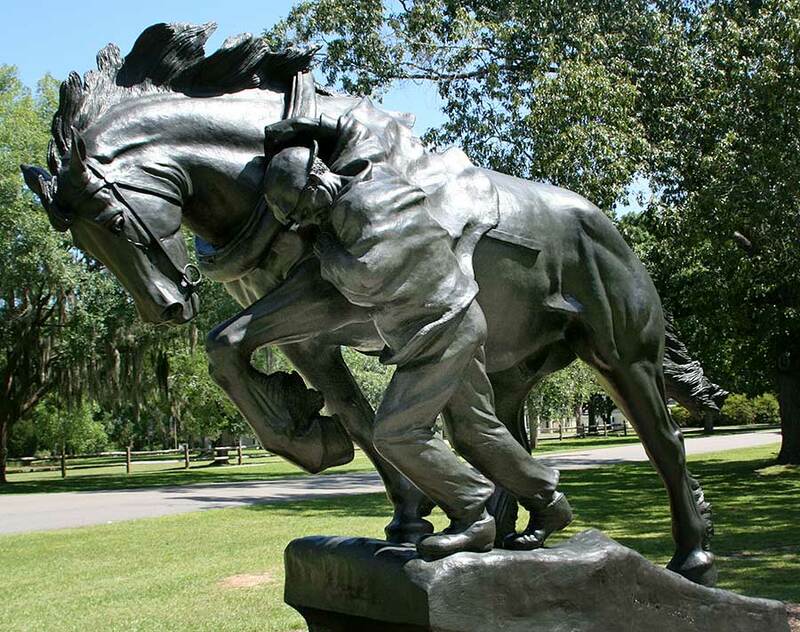 In 2p002 Goodacre won the James Earle Fraser Sculpture Award at the Prix de West Exhibition. In 2003, she was awarded the Gold Medal for Career Achievement from the Portrait Society of America and was inducted into the Cowgirl Hall ofFame. Among her most significant commissions are the Vietnam Womens' Memorial in Washington, D.C. and the Irish Memorial in Philadelphia.